Karla Acevedo, Class of 2016, A Drop of Paradise. I chose the title of my photograph to be A Drop of Paradise because the way the image came out it sort of reminds me of the vague descriptions of paradise, so clean, clear, and simple. Also I decided to name my piece this because every time I go to the duck pond and look at the beautiful view a sense of peace overwhelms such as I imagine that that is how peace would be in paradise. This Picture is a picture of the duck pond from the far left point of view, that day there were lots of ducks and it was a very beautiful bright sunny day. What I really liked about my picture is how clean and how bright it came out and how all the colors contrast. 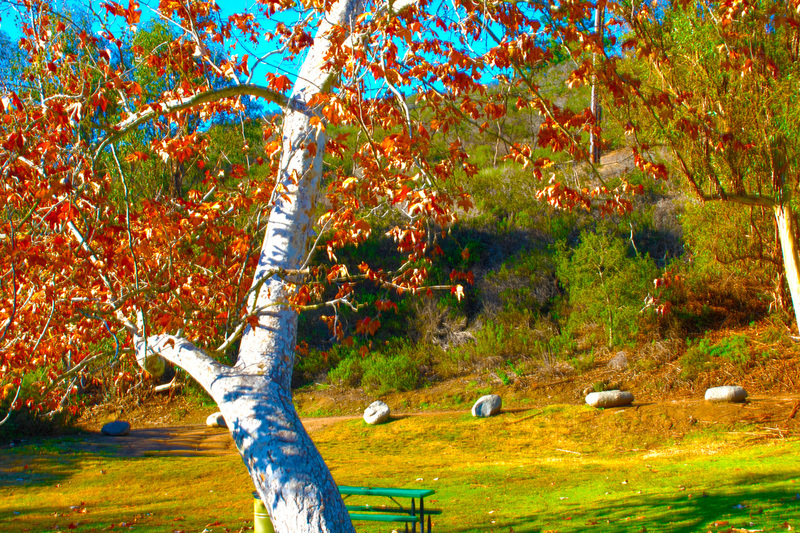 What I also liked about this picture is that it was practically natural all I really did in Photo Shop is make the colors contrast more and brighten the picture, also crop because there were some people in the way. I think as a photographer I would describe myself as very random and that I really enjoy taking pictures where the image comes out symmetrical, clean, and bright. I think I have grown as a photographer because now I know many new editing and image cleaning tools. Eduardo Aguila, Class of 2015, The Bridge. 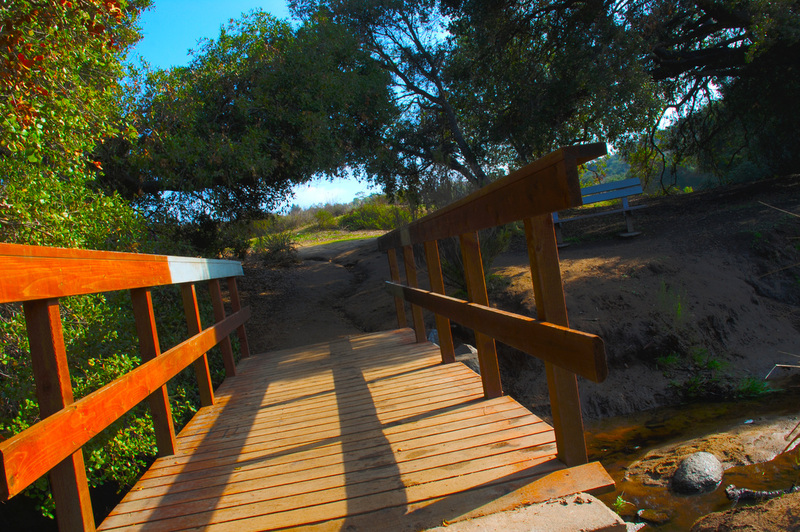 I decided to title this picture The Bridge because it is a picture of a bridge I found at the duck pond. 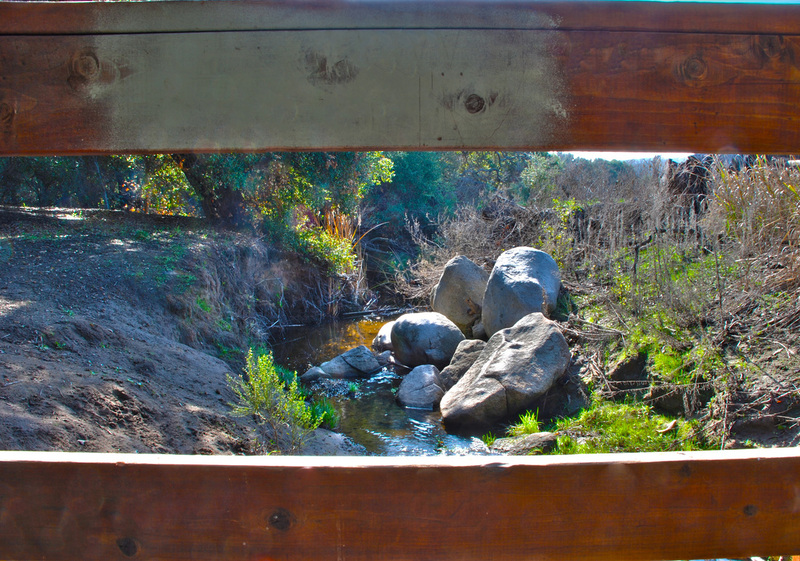 This is a picture of a bridge that was built to go across the little river. To make this picture nicer I took five pictures of the same thing but with different exposure. I used Adobe Photoshop and and merged to HDR to get all the five pictures together and made this single picture with good detail. I like this picture because it shows a lot of detail and I like how the background came out. I think this is a successful photograph because it came out with good detail and because five pictures were used to make this nice photograph. I have learned a lot this year- I’ve learned how to work the camera better, how to take better and nicer pictures, and how to make pictures look even nicer. I want to get better at taking pictures. Carlos Alvarez, Class of 2015, La Flor. I titled the image “La Flor” because it’s a picture of a flower and in Spanish it is Flor. The colors are vibrant and it reminds me of a Mexican village. The picture is of a flower. I made this picture in Photoshop. I like this picture because of the colors and the way it looks. I think it is a successful photograph because it brings up other ideas. I would describe myself as someone who waits for the perfect timing to take a picture. I have learned a lot about the camera itself and how to use Photoshop. I am looking forward to learning how to use Photoshop for more advanced things. 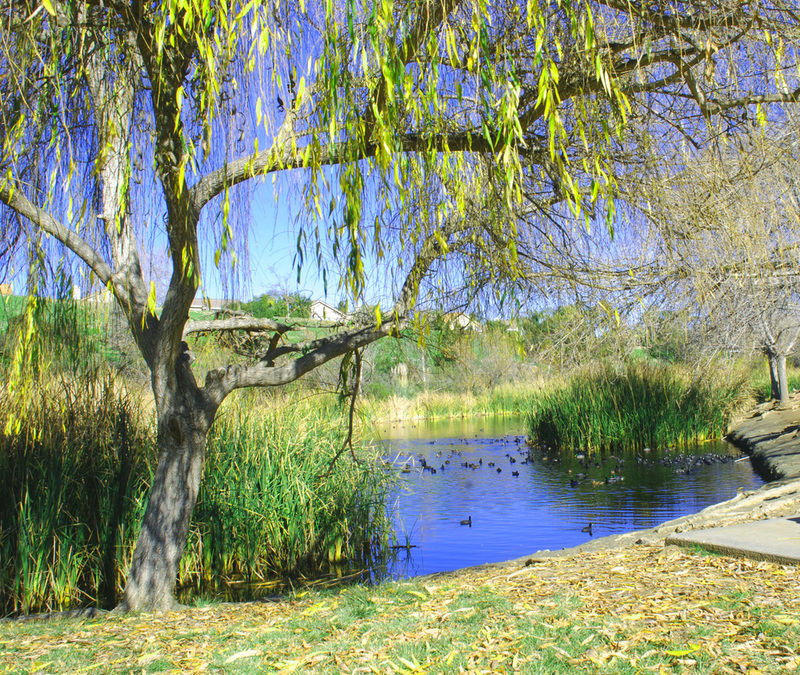 My picture is an HDR photograph of a path at the duck pond. I titled it “Into the Dark Forest” because the setting looks like that of a forest that has mythical creatures and a totally different world from the one we know. To make this picture, I took a copy of this picture 5 different times with different exposures ranging from -1.0 to +1.0 in sections of .5. After doing so I opened the pictures as an HDR in Photoshop and changed the brightness and contrast to my liking. My artistry has gotten better as the year has progressed, my pictures are more stable therefore they are clearer and portray exactly what I am trying to capture. Vanessa Amaya, Class of 2015, The Venus Fly Trap. The title of this piece is “The Venus Palm Trap”. 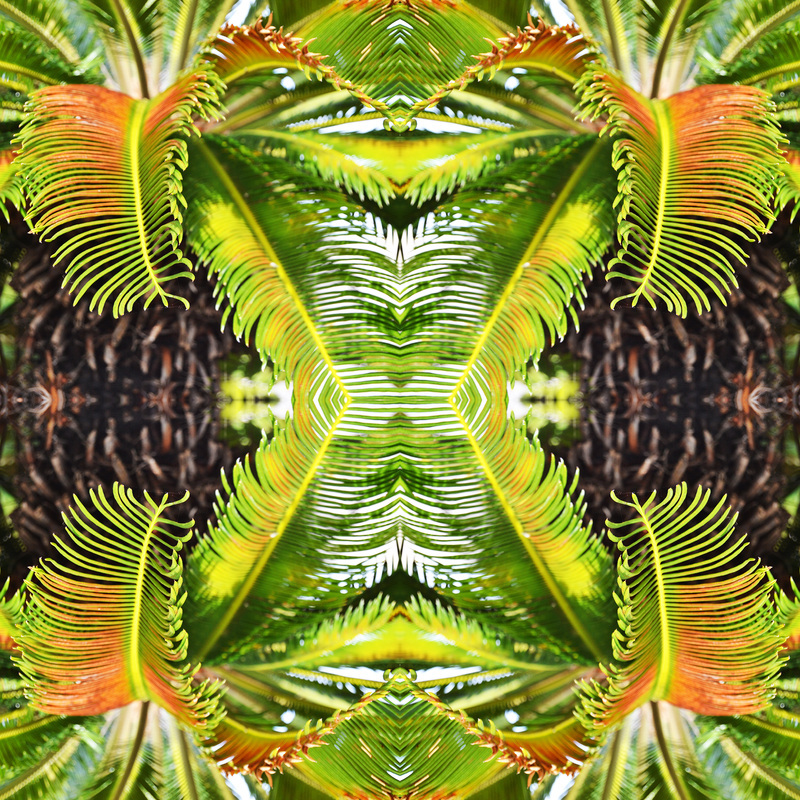 If you look closely, the palm tree mandala pulls you right at the center. The picture is of the corner of a palm tree that stood out to me in the quad. First I edited the original photograph to make the colors pop out. Then I began the mandala process with a four inch template. I rotated the original photograph and aligned the rotated photograph to create the final project. I really like this photograph because the colors of the palm tree stand out and the middle part catches your attention. This photograph shows that I love taking photographs of nature and as an artist, I go for the more peaceful settings. Naye Andrews, Class of 2016, Serenity. Serenity means the state of being calm and peaceful. I chose that title for my photo because painting brings peacefulness and happiness, and takes her to a whole new world. 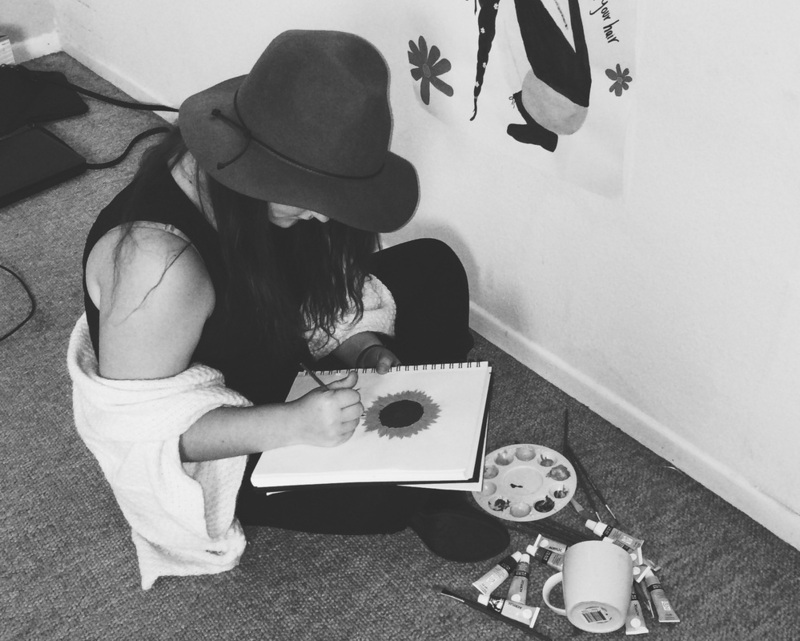 This is a picture of my friend painting a sunflower with her painting supplies by her side. To make the photo, I took it on my phone and then used the app VSCOcam to give it a black and white effect. I like this photo because it’s simple, but can say a million things in just one photo. This photo is succsessful because it was used for a project, it took many tries to get the perfect shot and then this one came out, my friend and I instantly fell in love with it. As an artist I would describe myself as a risk taker and take pictures of random objects/places and make them into something more than how other people would see it. This year I have learned how to do many things in Photoshop that I never knew how to do before. I am looking forward to taking unique photos and learning more about Photoshop and how to use it. 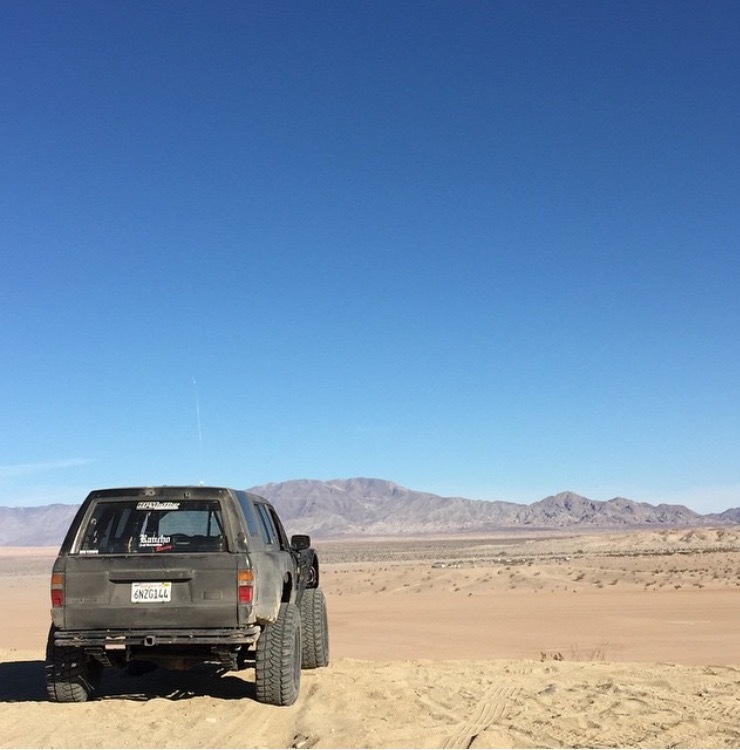 Andrew Apodaca, Class of 2015, The Adventure. This picture was taken at the duck pond in mid-day. The reason for the name of THE ADVENTURE is because I’m always ready for and adventure and something new. 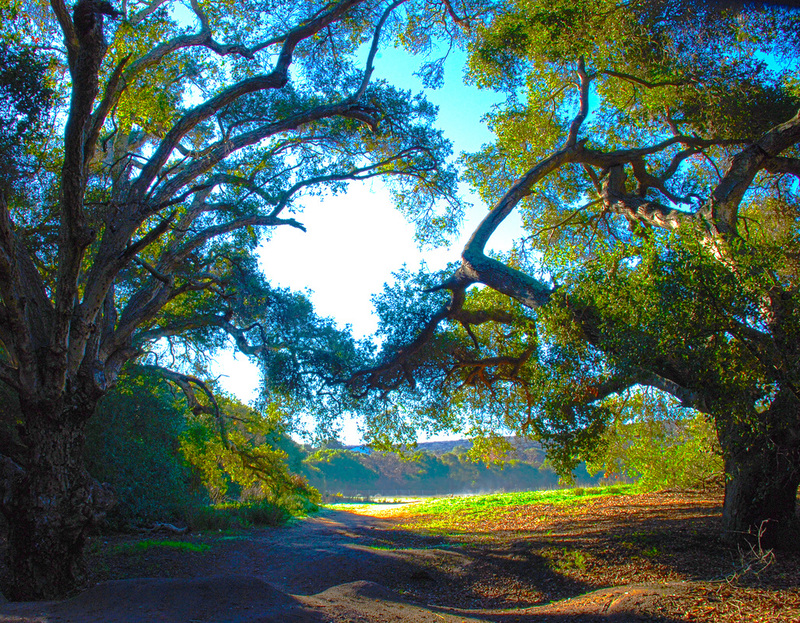 This picture is of a tree and the outdoors and all the things you can enjoy while exploring. In order for me to make this picture I had to use photo shop and make all the colors bright and then use the darks a little lighter so that all the other colors would pop out. The reason why I like this picture so much is because I like the outdoors and it shows where I like to be and have fun. It's successful because I spent a lot of time making sure it was the perfect picture to capture all the essence of nature. I would describe my self as an outdoor artist and capturing beauty of life. I have learned that anything can be done with a photo to make it what you want. I’m looking forward to learning about the HDR photos to enhance the meanings and qualities of the picture. Tony Arroyo, Class of 2015, Spacing. 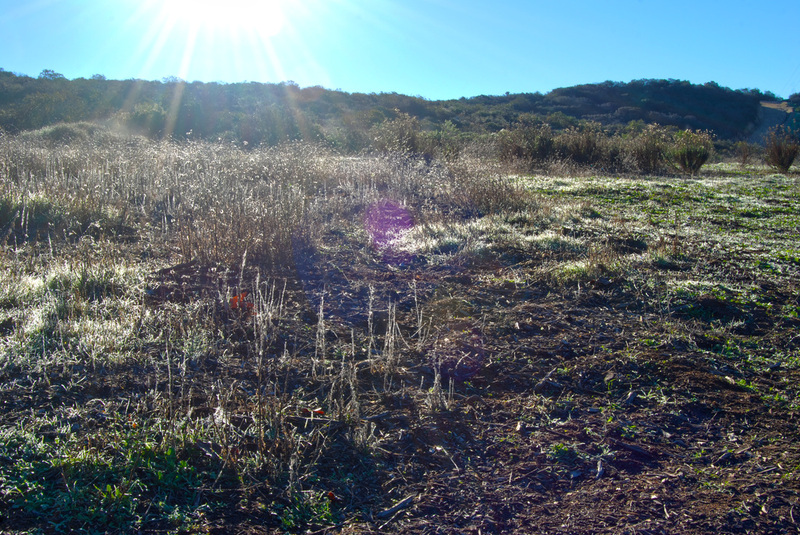 This is Spacing which was taken during our HDR project. I named it spacing because if you closely at the photograph you can see everything in the photograph is mostly evenly spaced- the three trees in the photograph are almost perfectly spaced between each other. You can also see the symmetry between the plots for the land where there are two parallel triangles and that just adds to the beautiful spacing. Also you can see that there is a barrier between the three trees and the other triangle. This is actually multiple pictures taken at different setting such as 1 or -.05 which changes the light and darkness of the photograph and with a little bit of Photoshop magic it turns the five photos into one concentrated image and then you change the saturation which results in enriched colors and giving it a HD outlook of life. I would describe myself as not an artist, I just like to taking photos and I’m not hugely into editing. I just like to take photos which capture moments in history, great art or just fun moments in your life that you want to stay with you in life and later remember all the great times you had. Overall I chose this photo because its simple, and it has to me a positive outlook on life which is something that I think is necessary to be happy. Ryan Bautista, Class of 2015, The Foraging Bee. I chose to give my photograph this title because to me it represents a single bee foraging for pollen on several different flowers. 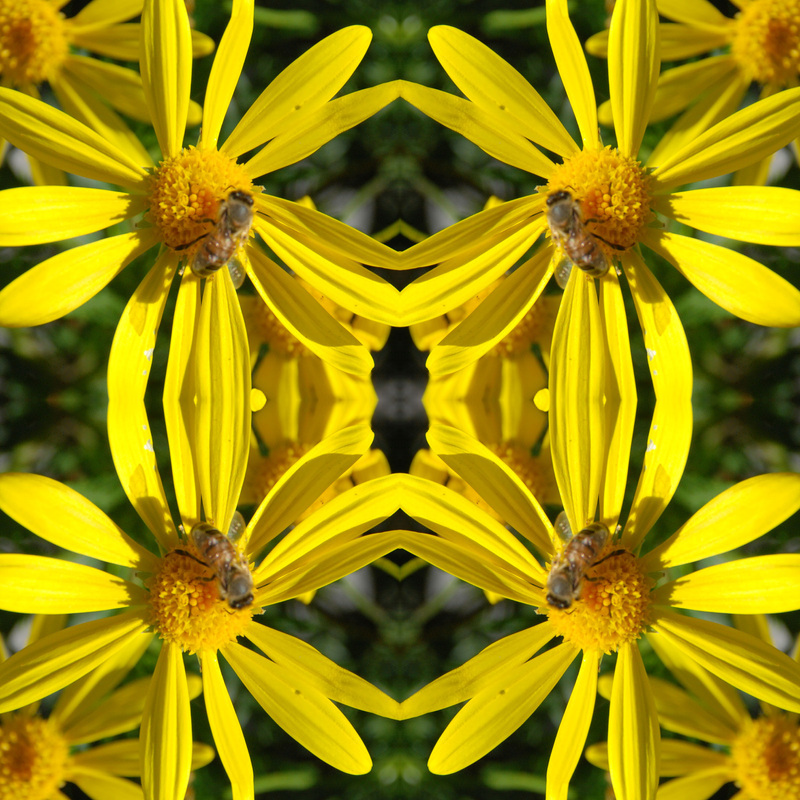 It is a photograph of a single bee sat upon the same yellow flower in four different angles. I created this photograph in Photoshop CS6 by doing the following: I created a blank template of a mandala by dividing up a blank background into four sections of equal height and width, I uploaded and dragged the original photo into one of the four sections of the mandala template, I then copied and adjusted the original photograph onto the other sections of the template to make them mirror each other, and I finished off the photograph by merging the layers on the template and adjusting the brightness, contrast, and saturation of the photo. 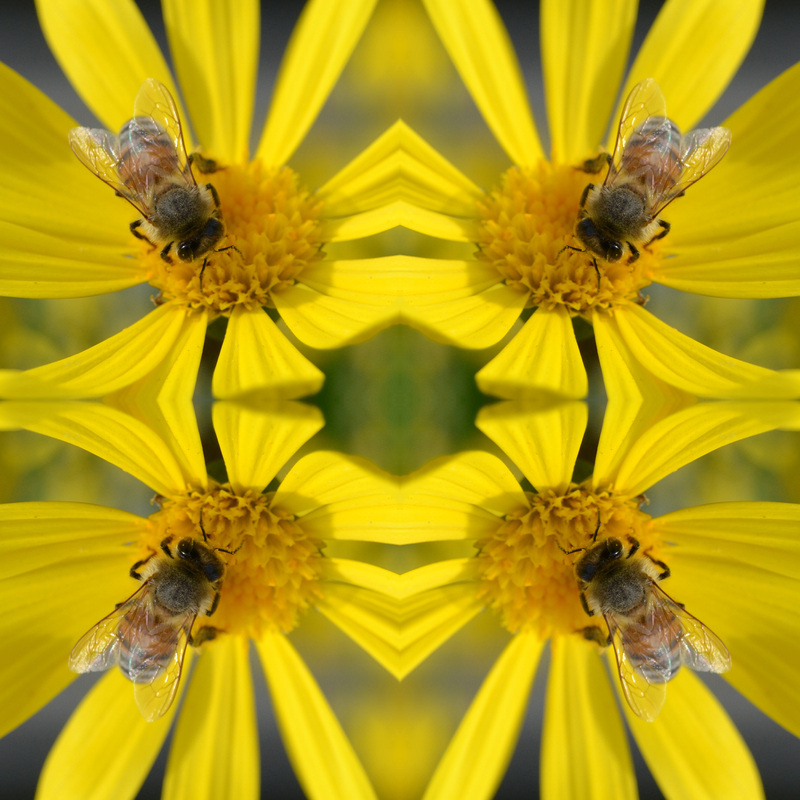 I like this photograph because of the amount of detail on the bee that I was able to capture and because of the process it took to create the end result of the mandala. I enjoyed the process of creating the mandala, and I thought that of all the mandalas I created, this was most visually appealing. I feel like this is a successful photograph because of the fact that I was able to approach the bee and capture it in the moment with high detail. I wouldn’t describe myself as a great photographer, but I am learning how to become a decent photographer. I’ve learned how to manipulate my setting to create unexpected photographs that give different vibes. I am looking forward to learning more about perspective because I believe learning this essential element will help me in improving my photographic capabilities. 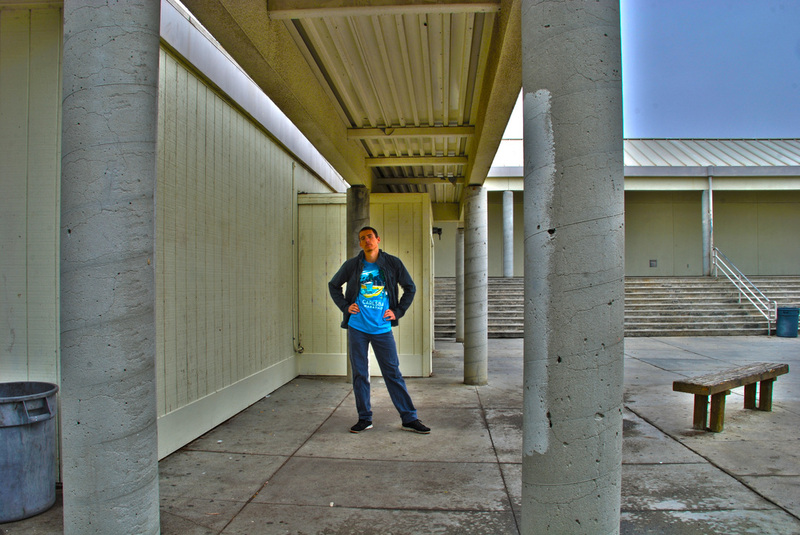 Victor Bernal, Class of 2015, The Library. I have titled my photograph “The Library” because the subject is reading a book in a place where books were left to read. 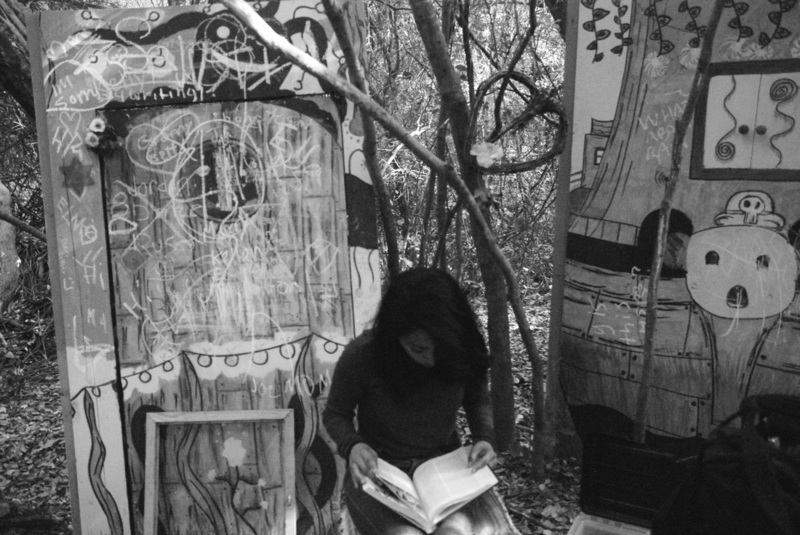 The picture is of a girl lost in her own world of books in isolation. I desaturated the photo in Photoshop. I wouldn’t put a name on what kind of artist I am when I look through the viewfinder in the camera I capture things to me that must be a photo and a memory. Guadalupe Camacho, Class of 2015, Visible. Many pictures that I have seen always seen fake to me. They always have this fake smile that is being forced on the surface to deceive those who see it into believing a fake happiness. I chose this picture because I was the photographer and I know that these emotions that were expressed were ones that I did not influence. When a masquerade is in motion and reality is abandoned to those who celebrate, Halloween. My presence may have had an affect but I did not attempt to bend their appearance to fit my own desire of a cheerful image. This was one of the few pictures that allow those who are in it to express their current emotion. This picture is simply called Visible, because there are no blurred lines or unseen motives that would change how the pictures depict my classmates. This picture is one that I take joy in because of my colorful classmates and the very real happiness that they were experiencing at the moment. I did not need to say to smile or do anything, and they chose how they wanted to be. I do not believe that this makes me an artist, but now I do feel the joy of taking a successful picture of those who are important to me. An Cheng, Class of 2016, Path to Fangom Forest. The title of my favorite picture taken from August-Present is named “Path to Fangorn Forest”. I decided to name it “Path to Fangorn Forest” because of how J.R.R Tolkien has influenced through the writings of his fantasy novel which includes: The Hobbit, Lord of the Ring, and The Adventures of Tom Bombadil. 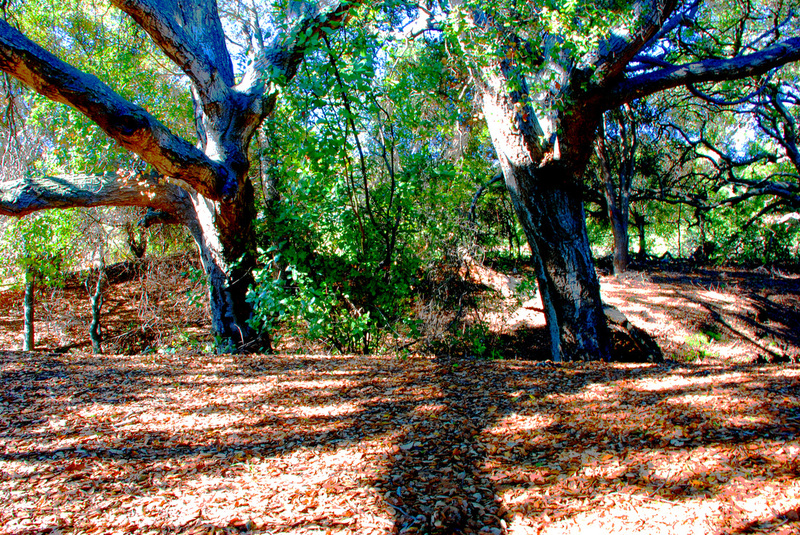 The picture taken shows environmental characteristics, such as its surroundings including the symbolic objects like trees, grass, shadows, etc. 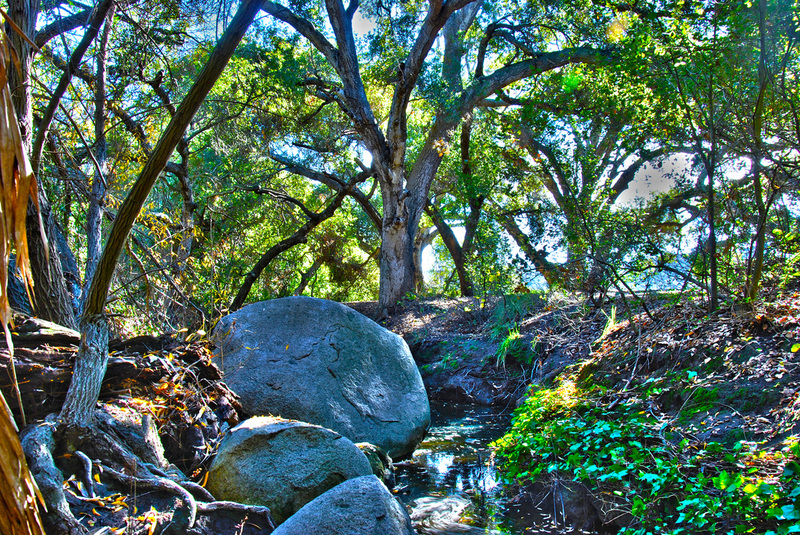 The picture is an HDR processing that combines 5 different photos, taken at different exposure level (i.e. -1.0, -0.5, 0, +1.0, +1.5). I went to the duck pond to take this elaborate photo. I like this particular picture because it reminds me of a place in middle-earth. This particular place is called Fangorn Forest, which was first introduced in the film Lord of the Ring: The Two Towers, and mentioned in the novel of Lord of the Ring: Fellowship of the Ring. This picture represents light which dark is weak to. The mother nature would spawn Ents to defeat and overcome the crushing force of Orcs, controlled by the corrupt Saruman to do Saurons’ biddings. I would describe my self as a creative artist, due to influences from pictures that I have welcomed my mind to. I can virtually imagine my surroundings and simulate the likeness of the setting that is taken in whatever movies, novel, etc. I have learned the characteristics of what photography has offer, providing different variety of ways of producing and editing pictures. I am looking forward to learn about green screens and animated photography, which could furthermore enhance my learning ability in photo imaging. Elaine Clark, Class of 2015, Indifference. I named this photograph Indifference because when two different things are put together, it makes no difference what they do or what they look like; what matters is that they are together as one. 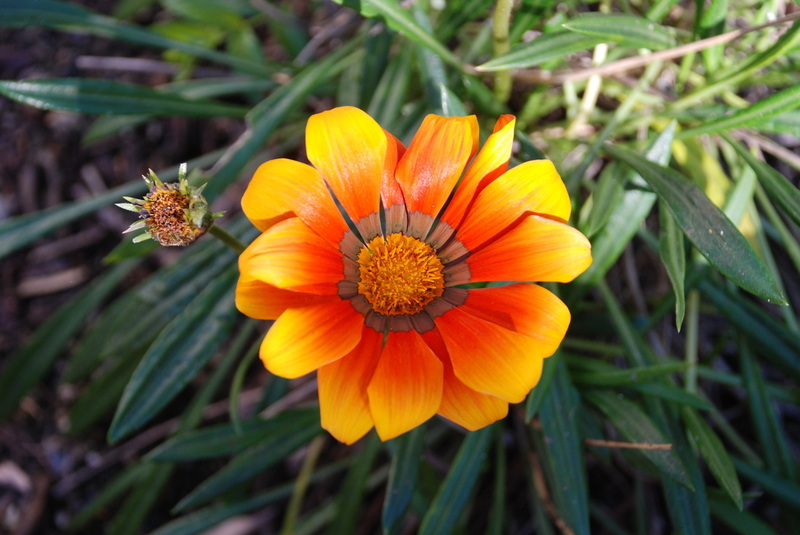 This photo shows a large orange flower inside a branch of small white flowers. I edited this photograph in Adobe Lightroom by changing the hue slightly to make the background darker and the colors more vibrant. I like the contrast in this photo and the orange flower really draws a lot of attention. I think it is a successful photograph because it has a sharp edge and the only thing to see is the flower since the background is blurry. I would call myself an artist, not only because of this photograph but also because of the many other things I’ve captured with a camera. I’ve done a few photo shoots with my friends to test my photography skills. I love doing that kind of thing. It’s a lot of fun to take credit for beautiful pictures. Katie Cruz, Class of 2015, Endless Peace. The title of my photography is endless peace because it’s a place where there is endless peace and it’s a place where there is no type of stress, only peace and happiness. It’s a graveyard where the remains of someone special to me remain. I find peace in this place. Peace to me is when you’re at a calm mindset with yourself and your body, and you feel relieved from everything. This work of art shows a picture that was captured by me in a graveyard. This place has so much meaning to me because it is my cousin that I am visiting, who was not only my cousin but also a sister to me. In this place I feel a little more closer to her and I feel like she’s actually there. I know she’s always with me, as she’s in my heart and mind everyday. I took this picture on my phone with the panorama camera and in the exact moment the sky and everything seemed to be still to me and I wanted to capture that moment. I like this picture because I always go here, sometimes more than twice a day. As an artist I feel like I’ve grown a lot- I’ve learned many thing and it’s helped throughout the year. I like what I’ve learned from taking a still picture to editing it to an extreme level. Photography is pretty cool and helps you capture a moment in life you’d want to cherish and keep still. Paulina Cruz, Class of 2015, Friends Uplift The Soul. I titled this picture “Friends Uplift the Soul” because you can see how there is a lot of emotion in this picture, and you can see how a friend’s smile can change any kind of mood. It is a picture of two great friends, one not having such a good day and then the other one is there by her side, giving her that smile she need to get through life. I like this picture well because you can really get a lot from this one picture- you can see a lot of emotion and a great message, which would be that there is always going to be someone special by your side to make your day better and give all the advice you need. I would describe myself as an artist that can capture a lot of emotion and meaningful pictures. What I’m looking forward to learning is to become better in everyway in my pictures and to work harder at landscape photography. Lindsay Daggett, Class of 2015, Sweet. I titled this picture “Sweet” because I feel that sweet has a lot to do with the photo. This photo is a picture of a bee landing on a flower wanting to get nectar. I edited it a bit in i-photo to make it come clear. I like it because it really speaks to me and makes me happy. It's successful because it captures nature in a lot of ways. As an artists it really makes me feel happy and I feel like I’m getting a lot better at taking photos as well. Andy Dang, Class of 2015, “Crescendo”. The title of this project is called “Crescendo” because it means that the music will gradually increase its loudness and when playing musical instruments together, it becomes loud. This picture is the Sense of Place Portrait assigned to me and favored this picture the most. 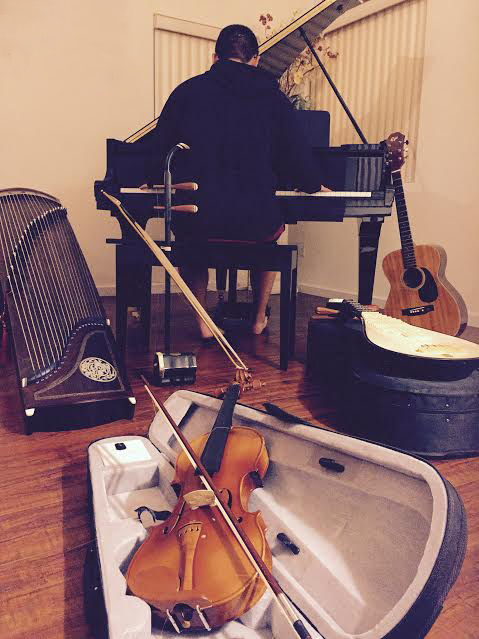 The picture contains all the musical instruments I play and own. I used my cell phone and took a picture and use Transfer and adjusted the picture to its brightness. The reason why I favored this picture the most is because I like how it describes me and show who I am. I think it is a successful photograph because it would be a picture to remember. I would describe myself as an artist because positioning the objects and camera was not easy. What I have earned so far in Photography class is how pictures are taken and why. Tyra Darrow, Class of 2015, Sweet Serendipity. I decided to give my photo this title because of its majestic qualities. You look at it and it is so soothing and beautiful, and gives you a feeling of inner happiness and freedom. 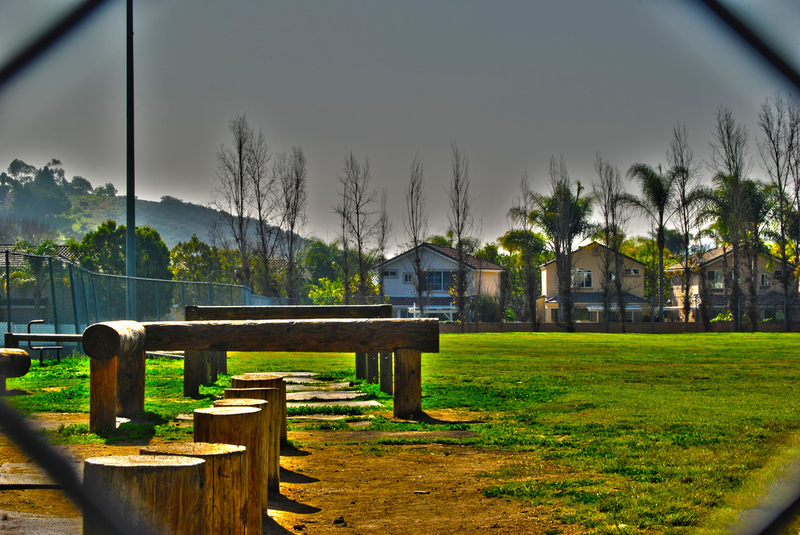 This is a photo I took at a nearby park around my school. In this photo, there is a tall tree that has brown leaves and isn’t very full, and next to it is a green and vibrant bush. The sky was clear and it was a cold winters morning. The grass is green and the sky a beautiful blue, and looking at this picture makes you feel blissful. 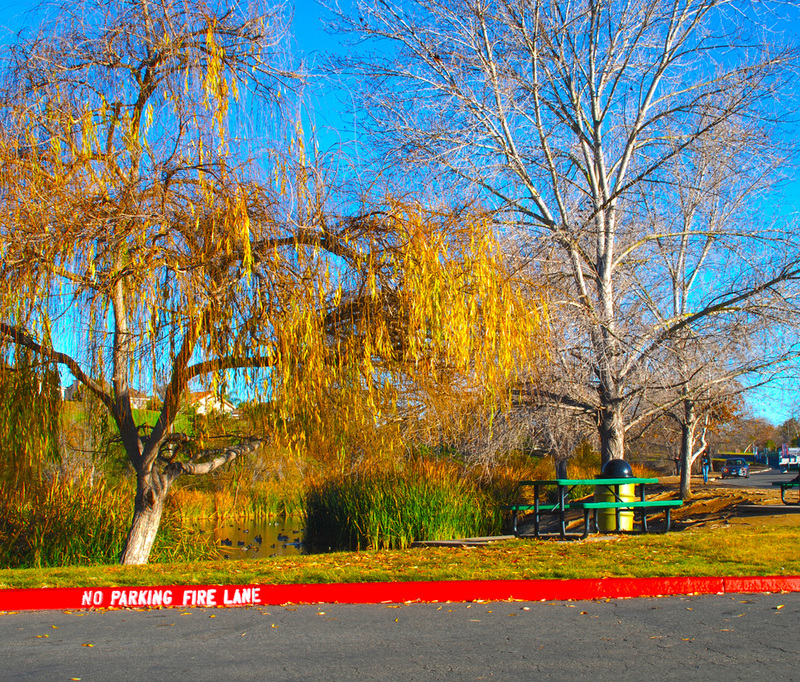 To get this photo, my class and I took a little walk down to the Duck Pond near my school. I saw this tree and the angle and knew that was the shot I wanted. I took 5 photos in total to make this one exactly how I wanted. To create this HD photograph, I took each picture with a different exposure each time, (0, -0.5, -1.0, 0.5, & 1.0). After taking the 5 photos without moving the camera, I downloaded them onto my computer and opened Photoshop. I took the 5 photos and merged them with the HDR processing tool, and then I played around with the different settings to make the picture detailed and vibrant, so you could really see just how beautiful this was. I like these types of photos because the colors pop and the details are visible, and all around these are my favorite types of photographs. I am extremely proud of this photo and these are the types of pictures I love to take. I would best describe myself as someone who strives for color, and wants to see something beautiful, and be able to show every aspect of its beauty through a photo. 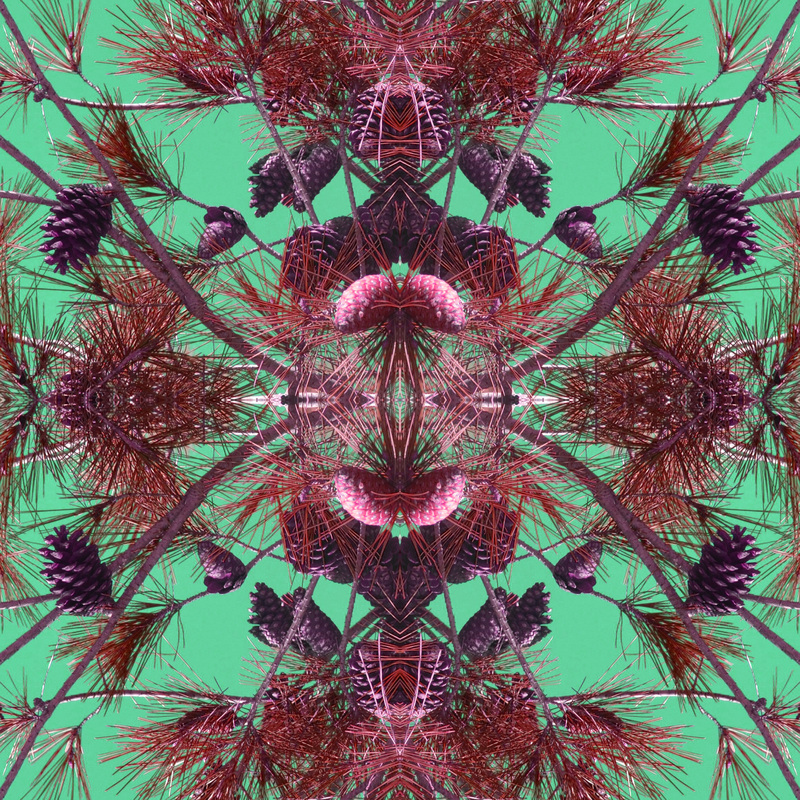 This year, I have learned so many things; Making a mandala, HDR photos, mastering Photoshop, and so many more. I look forward to mastering photography and being able to tell a story through my photos. Whether it is pictures of nature, or something as simple as a portrait of someone, being able to show the inner and outer beauty is one of the many things I love about photography. Aidan Dean, Class of 2016, Modern Interpretation of Cubism. This piece was titled that way because of the nature of the collage. Many different photos make up these singular collage that is really just one large photo, which reminds me of the way Picasso painted in his style, Cubism. This is a series of photos of a colorfully painted door in a Vista neighborhood. It stands out because it is a bright off set yellow with the white around the frame, and the cream colored stucco walls. It was taken on a Canon Xsi rebel DSLr, and I made the collage on Adobe Photoshop. 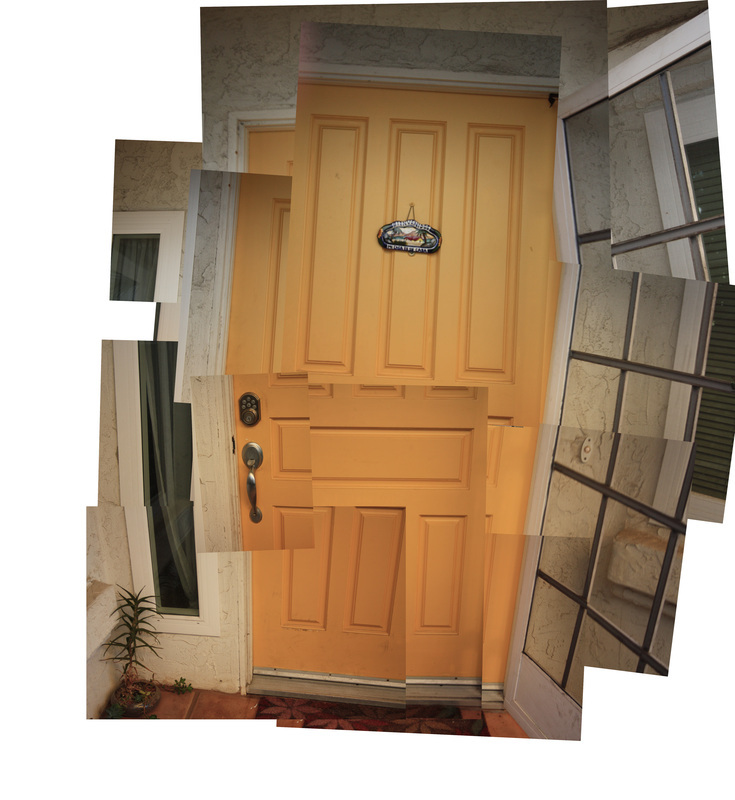 There are many ways the collage can be put together to look good, this is just one of the few I made out of the door photos. I like this photo because it’s mine. I took the photos, and I put them together in this way, it belongs to me. It is art, I can't measure it's success on my own, that’s the opinion of other people. As an “artist” I don’t really know how to explain my self, I like what I like. I really enjoyed the artist research, because I got exposed to other peoples work. I’m looking forward to seeing what strikes me next. Monica Delgado, Class of 2015, I Miss You. I Miss You were the first words I woke up to, the first day my Grandma was gone. I never believed how much it would hurt to lose someone so important in my life. I’m sure that I’m not the only person that has lost someone so special to them. But all I know is that memories are the only thing I have of her. This picture shows a lot of whom my grandma was. She was a strong woman that never gave up, a woman with a huge heart. Always taught us how important our religion was and how much faith we needed in life. I took this photo with a lot of love and courage. This is a photo of me at my grandma’s house, kissing a white rose and staring at her gorgeous smile. This photo was taken 2 weeks after her passing. Family and friends gathered at her house to support my grandpa and to pray the rosary for nine days straight. I love this photo so much because it shows how much my grandma meant to me and how much respect I had for her. 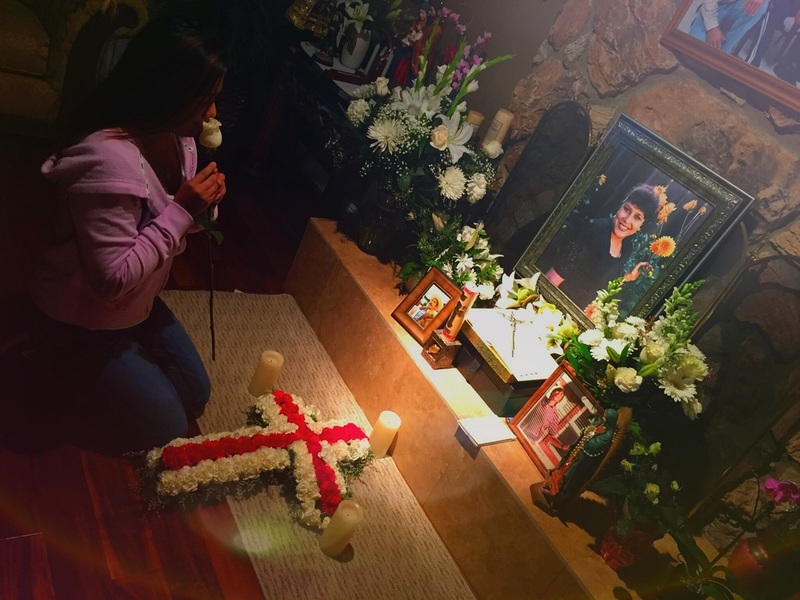 This photo is successful to me because it shows the love you will always have for a person that passed. It might not be a successful photograph for anyone else but it sure is to me! I believe that anyone can be an artist. I would describe myself as a passionate and creative when it comes to being an artist. Photography has always been a part of me. Taking photos to me means the world to me because I will always have those memories and never forget them. I’m looking forward to learning more about photography and enjoying clicking the shutter button. And also, never forget to enjoy that specific person you love so dearly because anything can happen on any second of the day. Bryan Del Rio, Class of 2016, Some Locks. The way I came out with that title is the picture itself, because there is more that one lock. This picture is about a lock keeping two gates together. Without that lock there will be no way on how to lock that gate. Which caught my attention is the detail of the chain because it is all rusted up. I edited this photograph in Adobe Photoshop because there wasn’t an other program that I can think about to do the mandala. 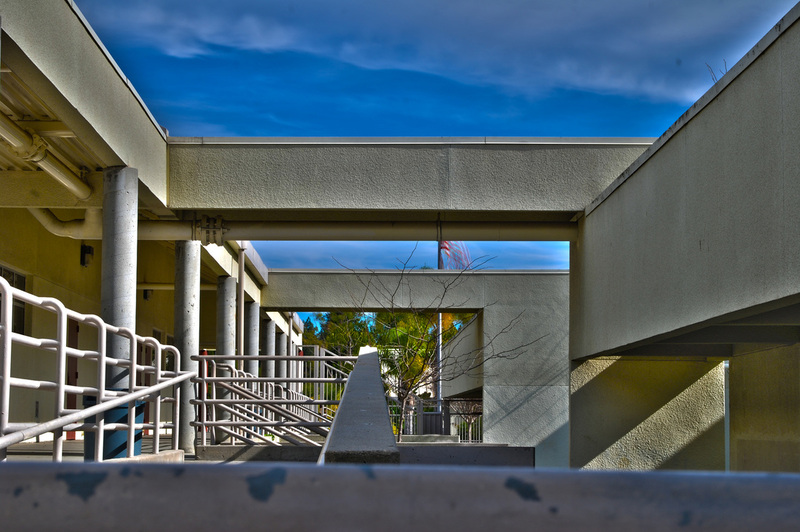 I took this picture at school in the black top. I like this picture because you can see the detail of the lock and the chain. This picture is successful because everything is evenly out and everything connects. The way I will describe my self as an artist is thoughtful because I will think of what I am going to take a picture about a lot. I’ve learned a lot this past year of shutter speed, aperture and when to use a tri-pod. I’m looking forward to take a lot more fun pictures. Mario Diaz, Class of 2015, Soccer Life. 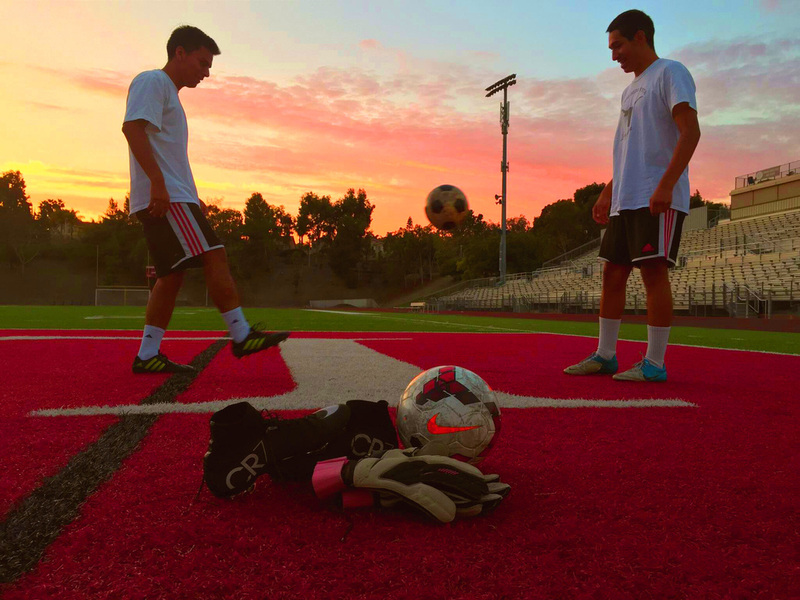 I titled my picture soccer life because it’s a sport I really like to play. The two people that are in my picture are my two friends Ricardo Garcia and Michael Nava. They are standing about 3 feet apart juggling the ball. What I did to take this picture and to make it the way it is was first I took it on my IPhone 6. And after that I only took the picture once because it came out perfect. And then I just started messing around with different effects. And I tried getting the nice sunset. I like this picture because I got to do it on something that means a lot to me. And it was just the perfect timing to take this picture. I got to have the sunset in the background. This is a successful photograph because of all the space in the background and how it’s just focusing on the two people and the sun. I would describe myself as a serious photographer. I like taking pictures of sports. I have learned so much this year about photography and how much exposure a picture has. Christian Enriquez, Class of 2015, In Bloom. The name I chose for this photograph is “In Bloom.” I chose this name because of the flowers that are blooming around this flower that is in focus and in bloom. Now, this is a picture of a bee on a flower. 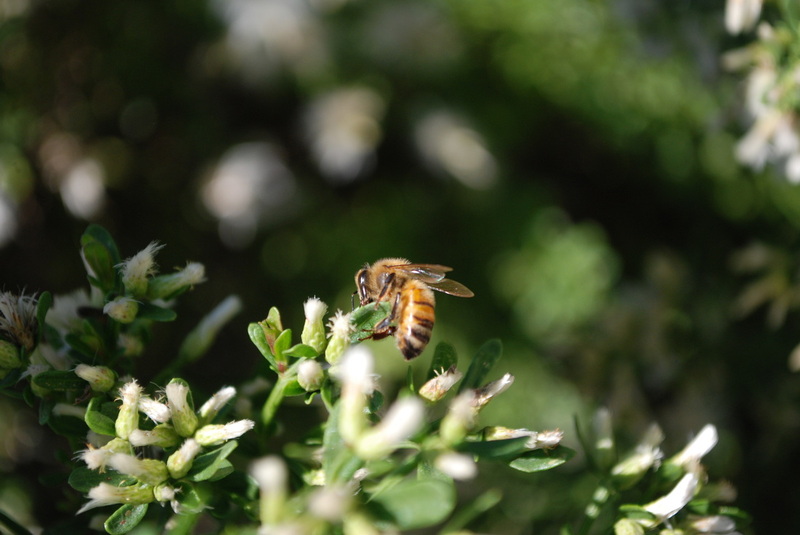 I took this while on campus and it was nothing more than patience and persistence to capture a photo of this bee. I didn’t enhance it on Photoshop or anything. It is a natural image. I like this photograph because, well, I think this is one of my best photographs I have taken so far. I was very patient with this bee landing steadily and trying to get the best angle possible. I almost got stung, but it was worth it. I think I have come a way in terms of being an artist. I’ve learned many things in this class and have been enjoying and will be looking forward to everything I learn in photography. Matt Frey, Class of 2015, Forest. This is the title because it looks like the photo was taken in a forest. This picture in taken somewhere in the duck pond and it is of some grass and a stream. I took 5 different pictures on different apertures and then merged them to HDR in Adobe Photoshop, removed the ghosts and edited the picture by adjusting the saturation. I like this color because the vibrant green color surrounding the stream. As an artist I’d say I’m still trying to figure out who I am. Isabel Gabrail, class of 2015, One with Nature. I chose to title my photograph this because it shows the trees coming together and how beautiful nature is. This is a picture of tress with acorns that I modified to make it more lively and exciting. It shows a different perspective on nature and how no matter what you change, it’s still majestic. The first thing I did was take a picture of a tree with acorns. Then I went on Photoshop and cropped the original picture to 2x2 and made it 300 resolution so it’s the highest resolution. 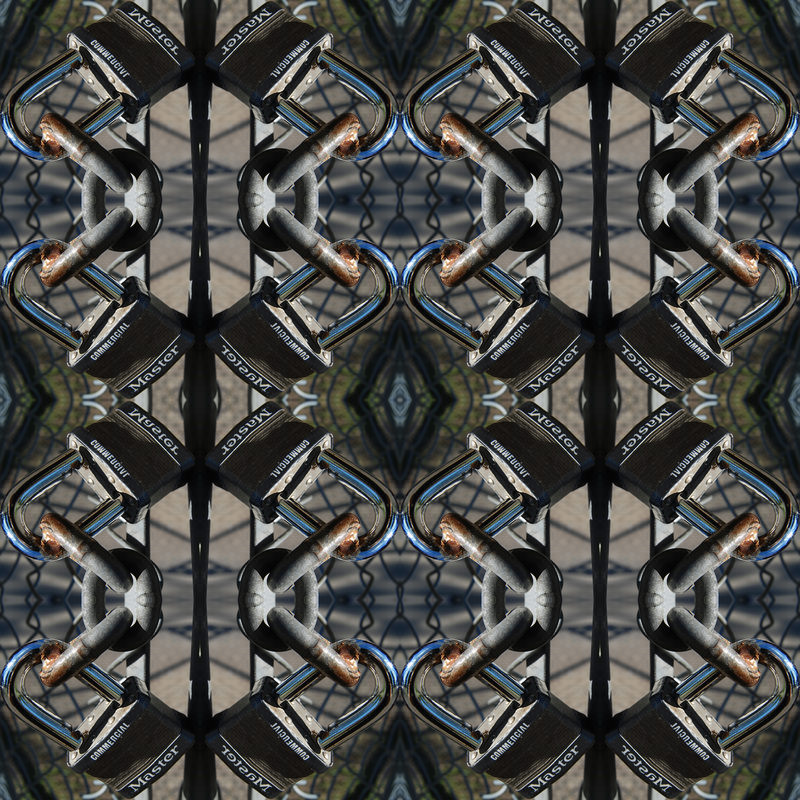 After you click on the ruler and make 4x4 squares and drag the original picture to each box rotating it to make the center look unique. I personally like this photograph because it has a unique sense of representation and makes a bland picture fun. As an artist I think I have grown a lot in a way where I see the world in a different lens, specifically a camera lens. It makes me want to capture every thing that I see to make memories. I’m really looking forward to learning more ways to edit in Photoshop and the different projects we will be doing. Mikayla Garcia, Class of 2015, The Truth Is In The Details. I called my picture “the truth is in the details” because I feel within this photo I was really able to capture incredible detail in one shot. You can see the texture of the pant so clearly and the design that it creates such a beautiful image. 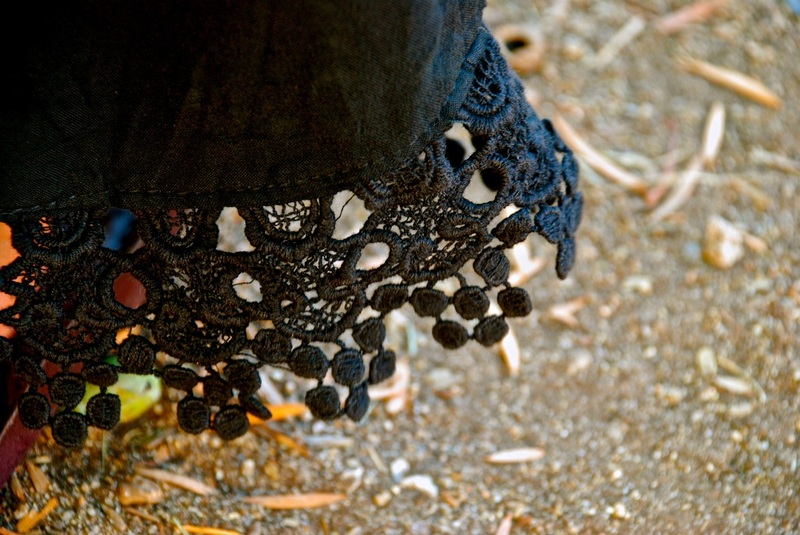 My close friend was wearing these Bohemian pants and I was so intrigued by the trim detail I had to take a picture of it. To produce this photograph, I put it on aperture priority and had a fast F -stop. Then, in iPhoto, I was able to edit and make the photo come to life with adding highlights, definition, and contrast. I really like this photograph because it is so detailed and a really beautiful picture. I think it was well done because of this reason, and one's ability to see the texture of the pant and the color of it as well. I would say that myself as an artist is very open and intrigued by all photography and I appreciate the use of space and color manipulation. I have learned how to do all of these things this year and I look forward to learning more on how to edit photos to make them how I would like. Jose Garrido, Class of 2016, Crescent Flower. The reason why I title the crescent flower was because it looks like a crescent from the moon. 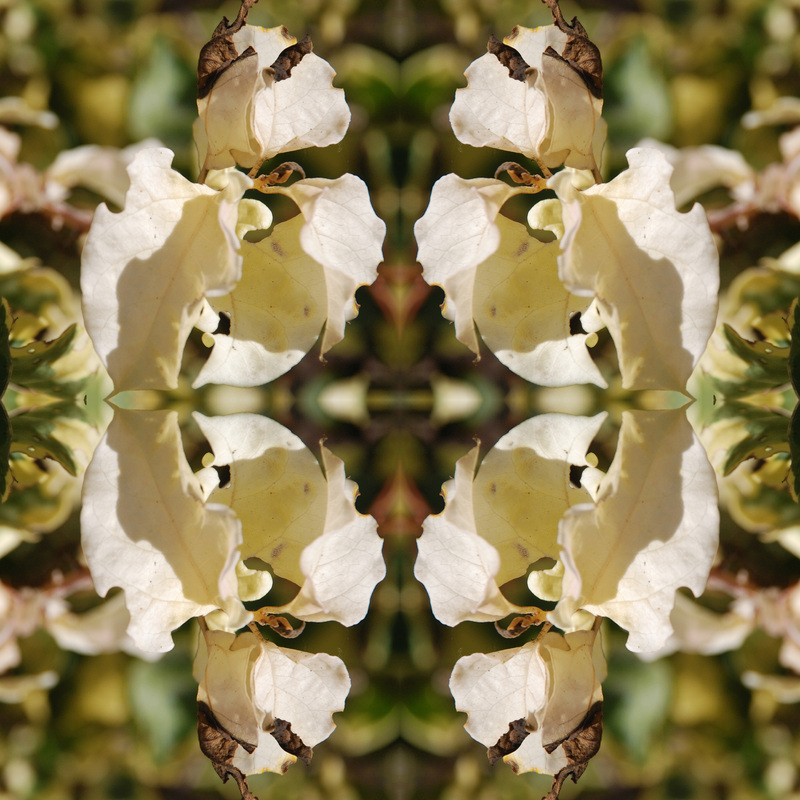 What the picture of a white flower that has been taken one time and has been rotated to a 90 degree. I made it in Adobe Photoshop. I like this picture because it looks like it’s a big flower but it is only the side of the flower. I think it’s a successful photography because it's the first mandala I ever did. I don’t consider myself an artist I consider myself more like a learner I am learning new ways to use Photoshop and make my skills grow. Some of the things I am looking forward to learning would be how to use Photoshop more and equipment. Jesus Garza, Class of 2015, Simply Beautiful. What’s the first thing you think of when you see this picture? A beautiful picture of a red rose. A simple picture of a rose that contrast really good with the background. That’s the main reason I named my picture “Simply Beautiful”. The picture is of a red rose on school campus. If you look closely you can see the detail in the roses pedals and it look beautiful. 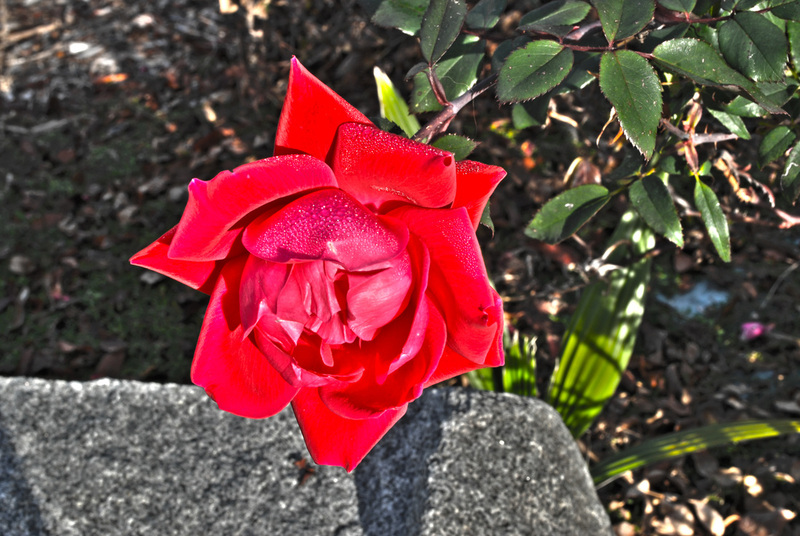 To make it in Photoshop I had to take 5 photos of the rose in different exposure levels. I merged them together into an HDR photo. And lastly changed some levels of contrast so that the picture could look like this. The reason I like this Photo is because it look beautiful and simple. The contrast levels are perfect and I love the detail on the rose pedals. The way I would describe myself, as an artist is a decent one. The reason I picked this picture for the mid-year gallery is because I love how I captured the details and the vibrant colors of the rose. And I’m really proud of this picture. Ethan Goeres, Class of 2015, Peek-A-Boo. The reason I titled this photograph Peek-A-Boo is because It looks like I’m playing the old childhood game but in a mysterious way, because you can still see my face even though my hands are covering it. The is a picture of me with my hands over my face but I did some editing to make it so you can still see my face. The way I took this photo is I took one picture of just my face then I took another picture of my hands over my face. After this I edited the photos in a app called after light on my phone. 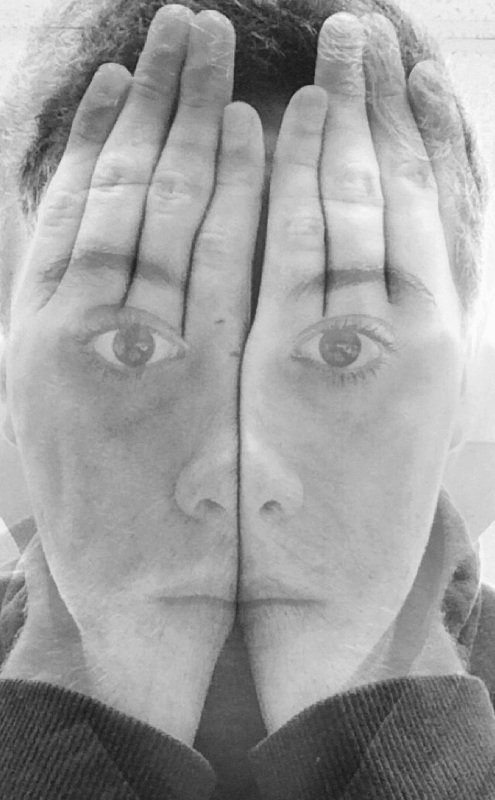 In the app I put the two pictures on top of each other then changed the opacity so that you could see my face over my hands. I really like this picture because it is mysterious and kind of plays with your mind because even though my hands are over my face you can still see it. The things I like to take pictures of are people and nature. I have grown a lot since the beginning of the year. I didn’t even know how to turn on a camera. Now I am taking really good pictures everywhere I go. I really like photography and I hope to take pictures my whole life. Iray Gomez- Class of 2015, Wind. I named this picture Wind because on that day there was a lot of wind and it was really cold. 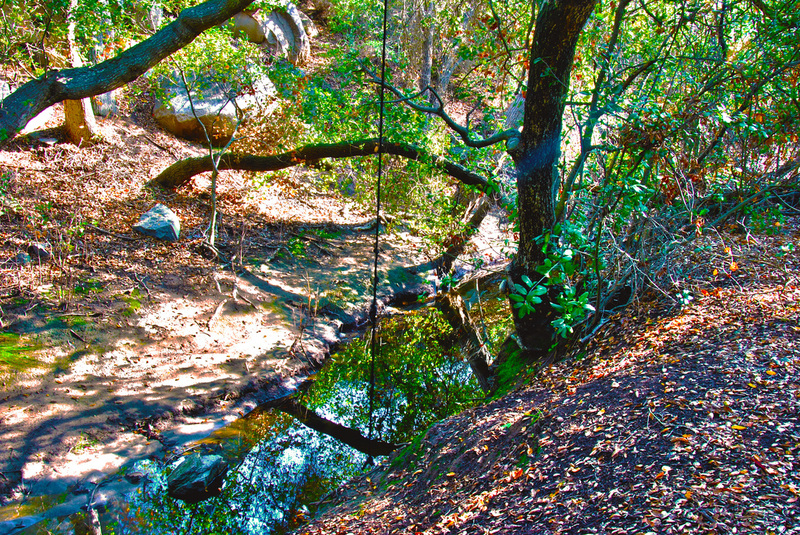 The picture is of water going down to a small pond. The water has to pass through rock that makes it difficult for it to pass by. 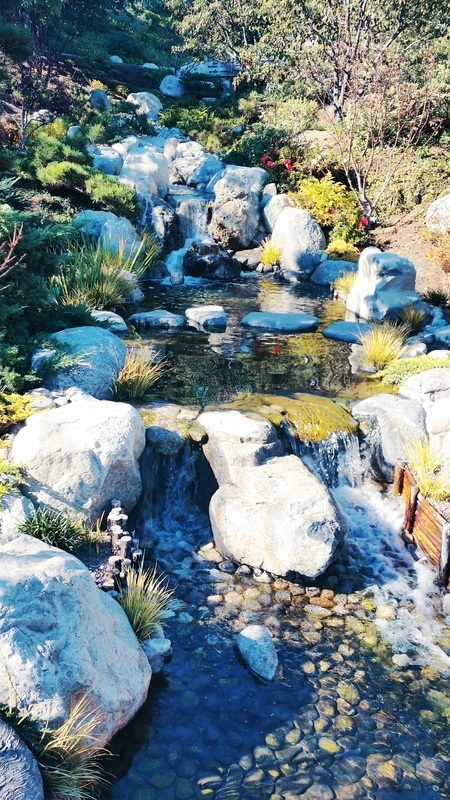 I went to the San Diego museum to a section called the Japanese Friendship Garden. I went there during Christmas break because my family wanted to see it. What I did to make it special was I turned on a button on my phone that says HDR. Turning on this button made the picture have more color and it was brighter in many areas. I really like this picture because I like that the colors are really bright and there is a lot of blue showing. It was a special day too and I am glad I was able to take a picture. I would describe myself as a creative artist. Although, I may not be good at taking pictures I can use my creativity for drawing. I prefer being able to see the process and being able to do more than just press a button. But as a photographer I believe I have improved a lot since the first day of school. I also have been able to learn a lot about proper ways to take photos. Yissel Gonzalez, Class of 2017, Follow The Line. I titled this photograph “Follow the line” because it is a picture of a leading line, and I just thought that it went really good with the photograph. The second reason why I decided to name my photograph this was because you can clearly see the path in this photograph. In order for me to edit this photo I had to use Photoshop and I used the fisheye lens. I took this photo at the duck pond. The reason why I really like this photograph is because I really like the way it came out and the way I took this photo. A second reason why I enjoy this photograph is because I really like the way I edited this picture. I think it is a successful photograph because I think it has really good detail. I would describe myself as a artist that is learning and who is doing a good job. I have learned a lot of wonderful things. For example one this that I learned is how to edit my photos in Photoshop. A second this that I have learned in photography was how do make an HDR photograph , how to make a Mandela and edit it and I also learned how to do light painting which was pretty cool. Mercedez Granados, Class of 2015, Brothers For Life. I titled this picture ‘’Brothers For life’’ because they go through so much together and noting can come between them. It’s a picture of brothers who will fight together. I used my phone camera. 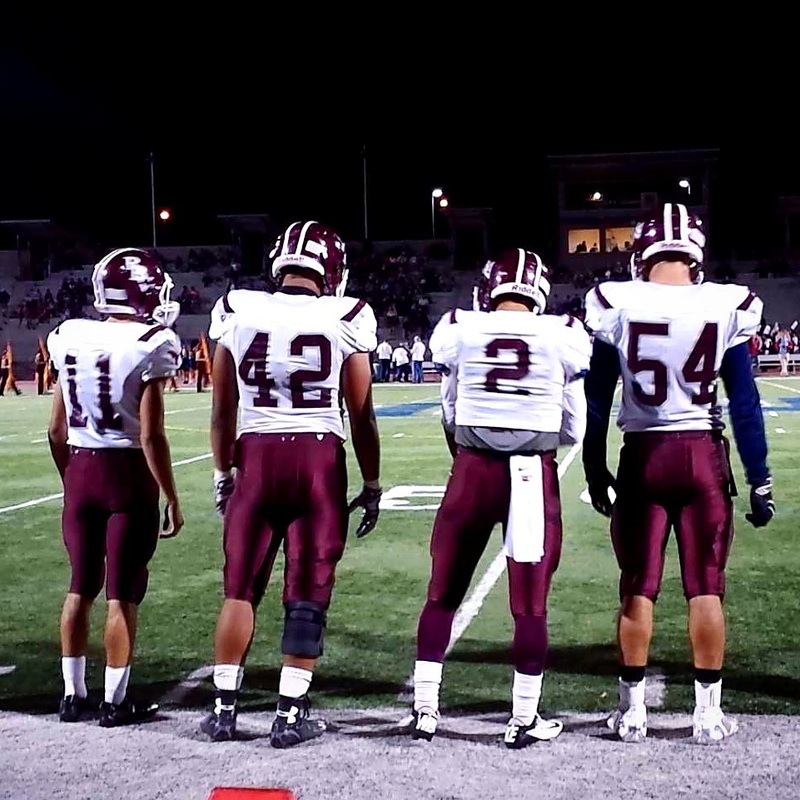 I like this picture because it shows how ready they are and how dominated they are willing to be. I would say that I’m a true and unique artist. I learned that when it comes to taking pictures you need to be really unique and have a big imagination. I am looking forward to knowing more about photography. 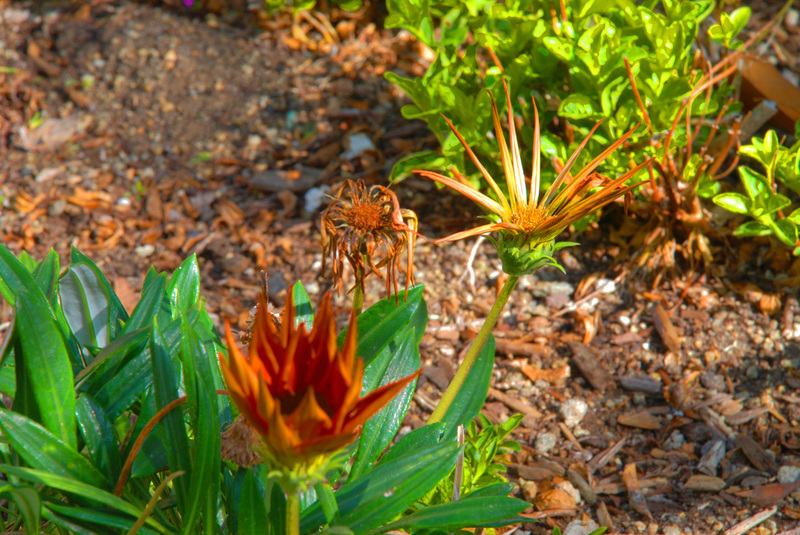 Madelyn Gutierrez, Class of 2016, I Spy A Bee. The reason why I titled it “I spy a Bee” is because there’s a bee that landed on the flower right at the time I was taking the photograph. This photograph was part of a project we did called Mandala. 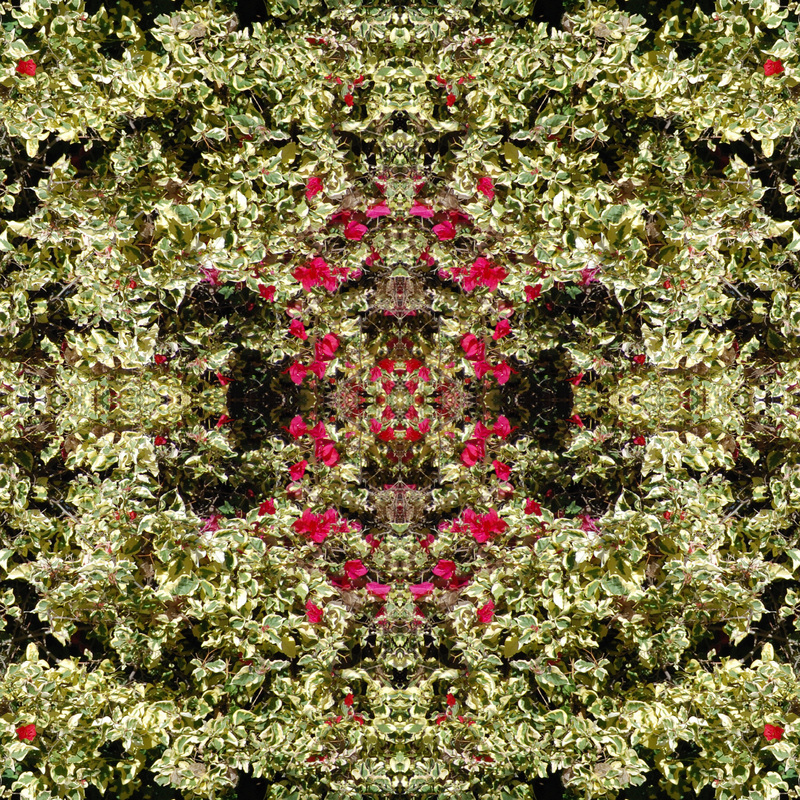 We had to take pictures of anything and create a mandala out of the chosen photograph. To make this mandala you had to make a 8”high and 8” wide document with 300 resolution. Then get a photo from iPhoto that we took and drag it to Photoshop as a new file, but having to crop the photo to a 1 times 1 square. We also had to adjust it to where the corner of picture would go to the center and then match the rest of the pictures to it with a result of something like the picture above. One of the things that made me like it even more besides the nice bright color of the flower is, the fact that the bee landed right there and it came to my mind of this being a beautiful photo with the bee standing out. I think it’s a successful photograph because of the detail of the flower that did come out and the detail of the bee also the wings of it is what I liked the most. I don’t consider myself a full on artist but I do consider myself as a learner and the fact that I’ve grown to understand more the concept of the certain ways of using the camera. I've become interested in photography and am having fun with projects, which makes it more exciting to start a new one, to always be creative and think outside the box. Finally, I hope to learn many more creative ways to edit photographs and learn more of the photography world. Alana Halttunen, Class of 2015, The Eye of Kuosi. “The Eye of Kuosi“ means the eye of design, pattern, cut, and fashion. Kuosi means design in the Finnish language. The eye came from the fact that my picture looks like an abstract eye. This mandala is made up of copies from the same picture cut and placed in a precise way. 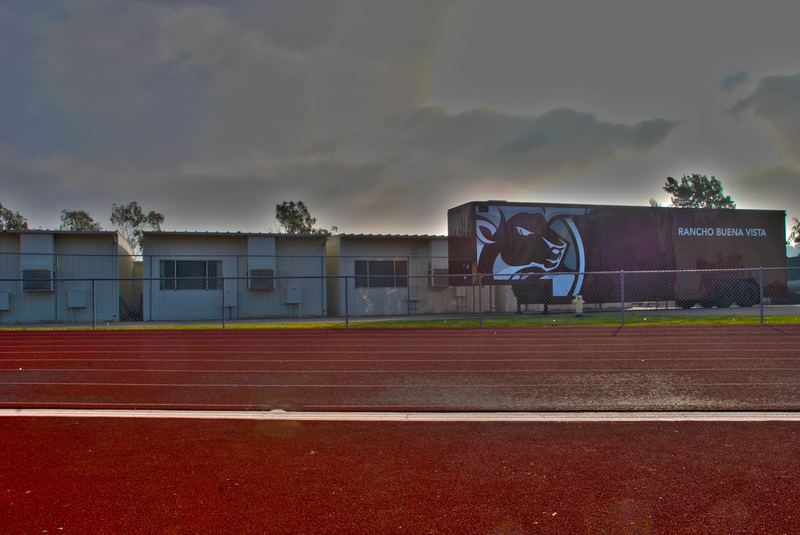 The picture was originally just a photo of one the murals around Rancho Buena Vista High School. As an artist I am drawn to bright color with a touch of black. Bold patterns and rhythm fuel my creative side. Proportion is a huge factor in my artwork. Overall my best works come from experimenting with color and new mediums. Since the beginning of this year my skills in Photoshop have grown tremendously. I am able to create clean photos and turn them into works of art. Carlos Hernandez, Class of 2015, Playas de Tijuana. I titled this photograph “Playas de Tijuana” because this is where my photo takes place. 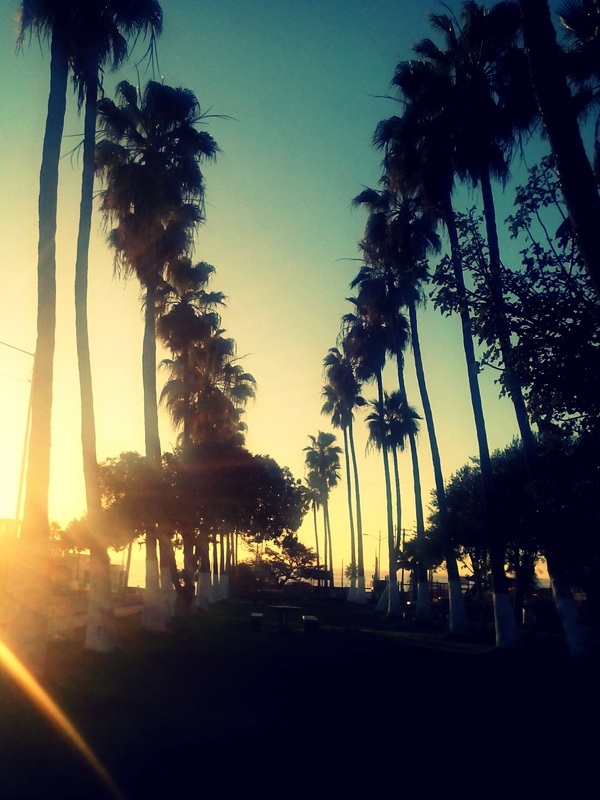 It is a picture of some palm trees lined up at a park near the beach, which is straight down the middle of the photo. Although it may sound like an ordinary picture, it holds a big significance in my life. It was based on the assignment called Photo Sense of Place. In this project, I had the quote “I’m in a place where I can look back into my childhood and never forget of my origin with my family”. I took this photo originally with my phone camera. Then, I decided to make it look nicer by editing it in an app I downloaded which is called, Pixlr Express. Like I mentioned earlier, it’s taken place in Tijuana but, somewhere special. It is where I hold many memories with my family and their origin. I like this photo because I think it is the best one I’ve done out of all. I like how it came out and what it means to me overall. I think it is a successful photograph because when I uploaded it in Instagram, Mr. Joe Medina, the photo teacher from Westlake School, commented in it and said he loved it and wanted to use it for his project. When he told me this, I was so happy and proud of myself. In the end, I can describe myself as a creative, open minded, and positive artist who always looks forward to having fun when taking photos and do a great job when editing them. I learned a lot from this class like using Adobe Photoshop which I have never used before in my life and wish to keep on learning new cool things as the year goes on. Julie Hernandez, Class of 2015, Entwined. The name of my piece is “Entwined” because it demonstrates the tangled, complexity of life. 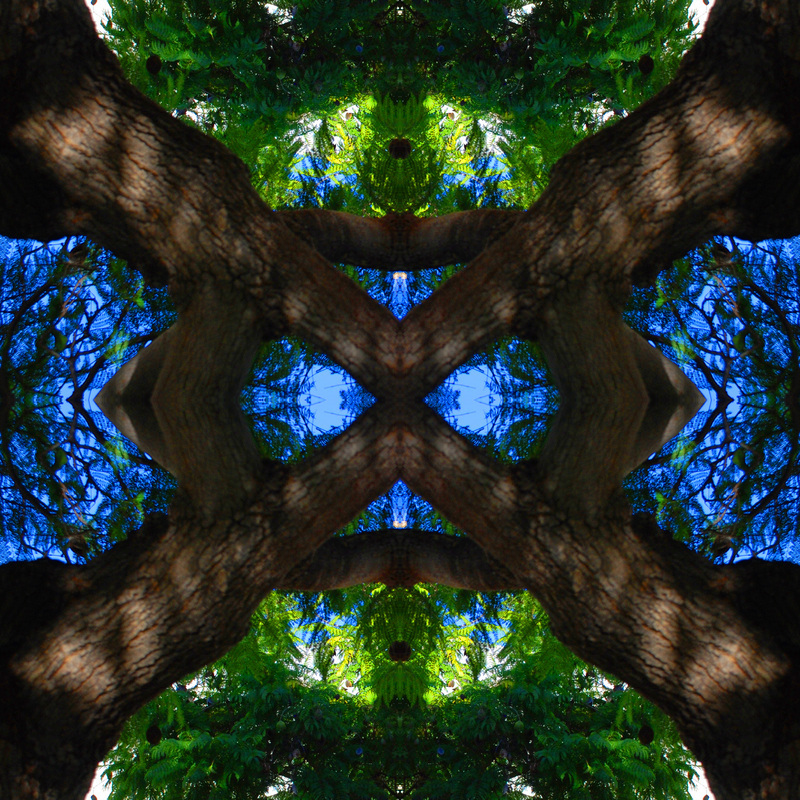 This is a mandala photo of the branches of a tree. To create this image I used Photoshop to rotate the same photo four times, then adjusted the levels of saturation and contrast. 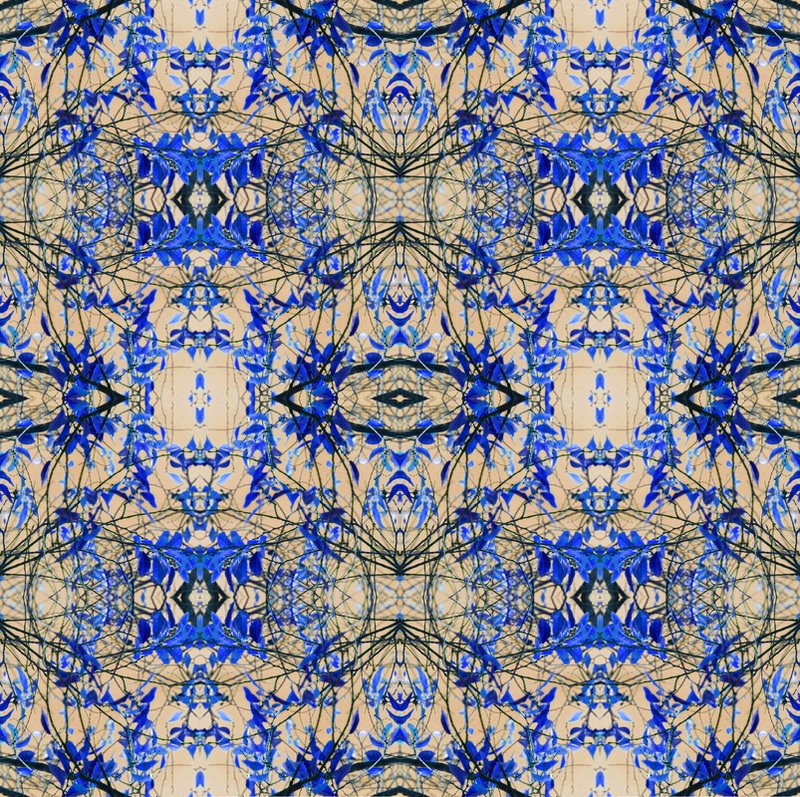 I like this image because it looks as if it would when looking into a kaleidoscope. I feel it creates an almost trance or psychedelic effect on the viewer. I think it is a successful photograph because of it is symmetrical yet complex. As an artist, I would say I provide an innovated perspective. This year I have learned various concepts and elements of art as well as different techniques to capture an image. I am looking forward to learning so much more and capturing many more experiences. Paula Hodge, Class of 2015, Kilroy Was Here. I named this artwork “The Cactus of Life” because it’s similar to the circle of life, but instead it’s a cactus. 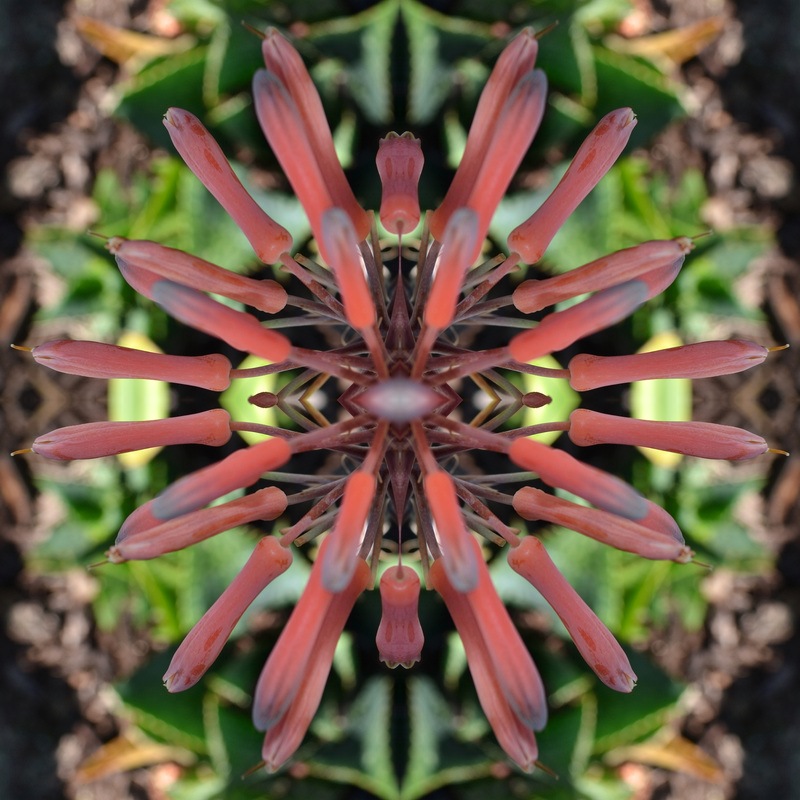 This is a Mandala of a picture of a cactus that I found on campus. When I took the picture I took it of the full cactus and I tried making it as close as I can while the photo is still in focus. 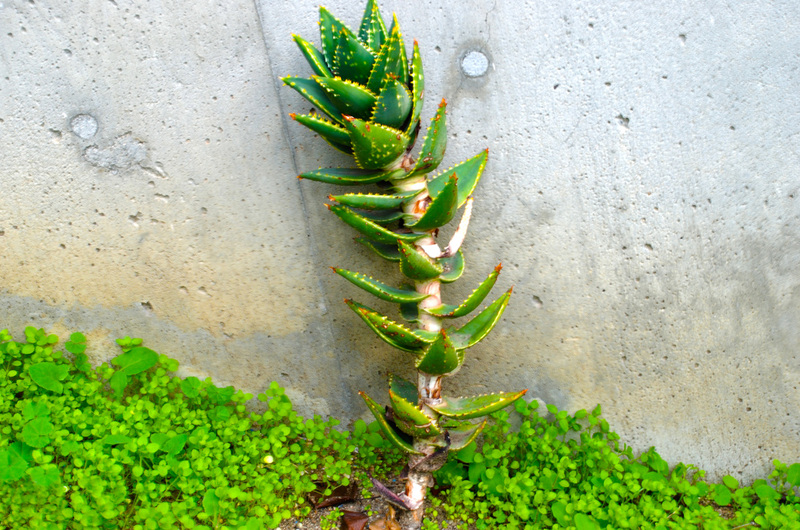 Then I opened the picture in Photoshop and used the crop tool to crop half of the cactus. 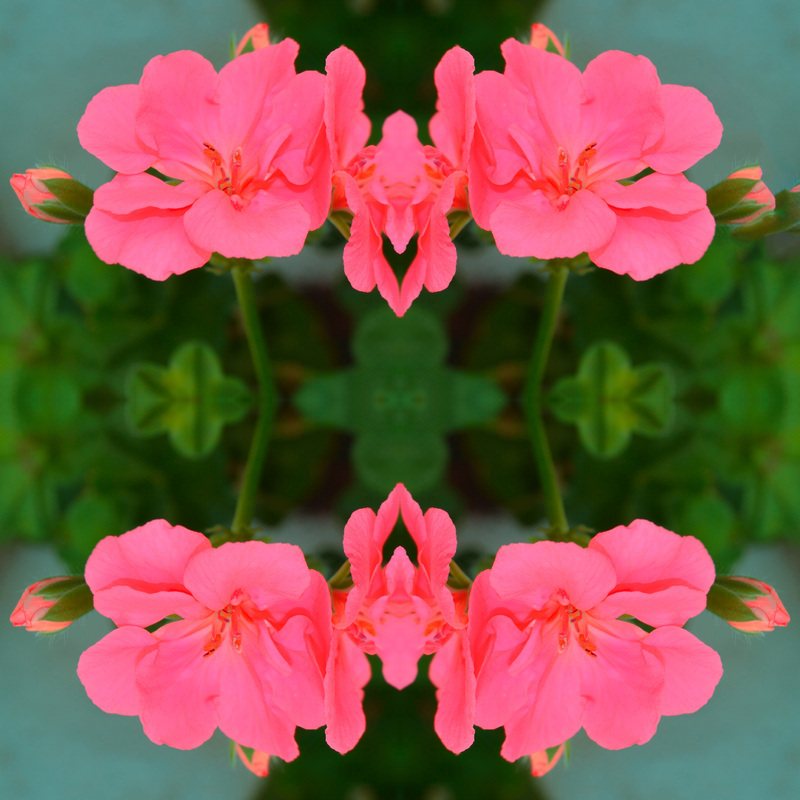 I used the same photo four different times at different angles and it created this beautiful symmetrical shape. I also used various tools to bring out the vibrant colors of the cactus. I like this picture because of the unique shape it has. I also like how you can see the spikes of the cactus. I’m an artist who loves creating unique, adventurous photos. I’m always down for an adventure and I love capturing memories with the click of a button. Karisa Hughen, Class of 2015, Between The Branches. 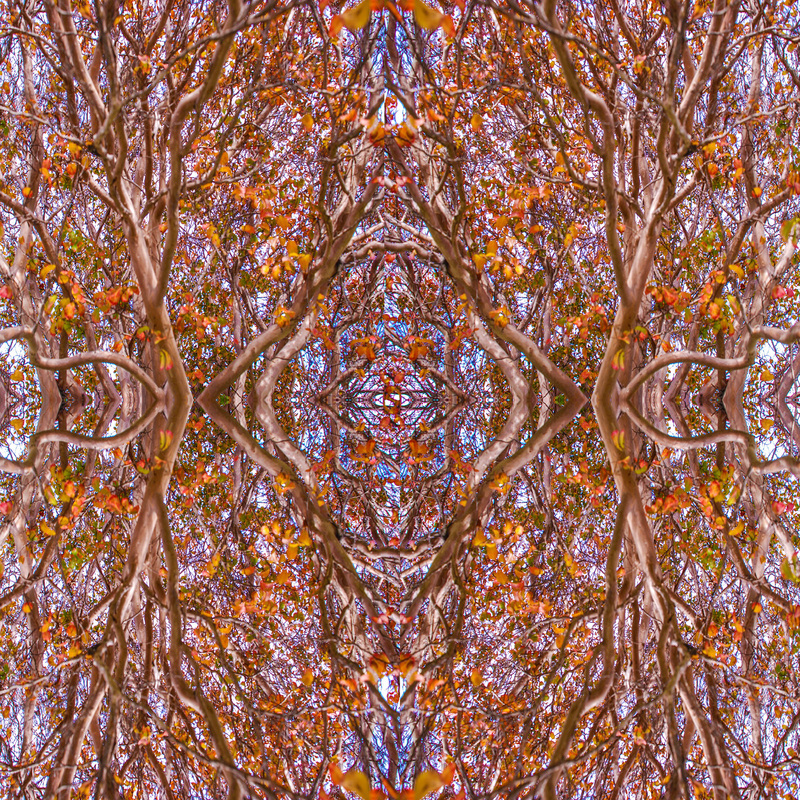 I titled this piece "Blue Between the Branches" because the original picture this image came from was a zoomed in picture of small branches with leaves on the fire lane at Rancho. 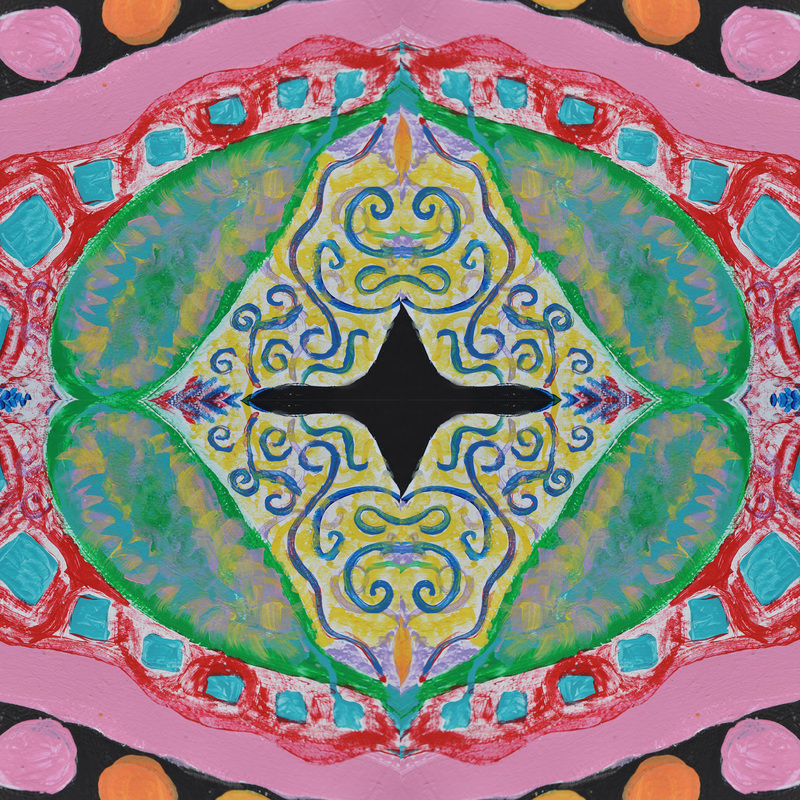 The image is called a mandala because I used the same picture but flipped them in different ways to create different geometric shapes. Then after I flipped the images and was satisfied with the way it turned out, I started to mess with the different colors and brightness, which resulted in the blue color in the image. I really enjoy this picture because of the complexity and color of it. You can look at any of the different shapes and it takes awhile to fully comprehend the picture as a whole. I love the shade and amount of blue that was incorporated into the picture, which really make the picture pop. I would describe myself as a colorful artist. I love to capture photos with a bunch of color and or add color in when editing it because it allows the photograph to stand out a tell a more bold story. Dianna Jaramillo, Class of 2016, Wonderlust. I named this photo Wonderlust because this gives me a mood about how beautiful places can give you a beautiful feeling. Nature is beautiful and peaceful to watch and also it is good to admire it while it last. Nature nowadays have not been admired by people because now it’s all about electronics instead of outdoors. I believe if we all admire nature we would realize how much we been missing these exquisite things. This picture of the river gives me a peaceful mind. It’s like I feel like I’m in that place where all the terrible things has become a blur and the most beautiful things have been focused on. I used photoshop in this picture because I needed more vibrance and needed to adjust the contrast. How I will describe myself as an artist is that I love being precise about pictures. I always want it to come out beautiful and also I want others to enjoy it. So far this semester I have learned how to use Photoshop and how to make pictures more gorgeous than they are straight out of the camera. What I am looking forward this year is to learn more how to use Photoshop. Letrina Keila, Class of 2015, The Most Simplest Thing. I titled this artwork “The Most Simplest Thing” because something as simple as a flower, a tree or even a leaf makes you appreciate the little things that surround you or that happen in your life. The picture is of a tree that I took here at school. To create this photograph I went to Photoshop>File>Automate and then I selected five photos to merge to HDR pro. After Photoshop merged all the photos together I removed the ghost and used Monochromatic Artistic to give it a little more so that it can look this way. I like this photo because I used it for simplicity and it is very simple and the background is not so busy in the back. As an artist I feel like that I have gotten a lot better and I love that I am getting better each day and I continue to learn more. Daniel Lopez, Class of 2015, Hiking To The Top. I name this picture “Hiking To The Top” because I took this photo from the bottom of the hill and it looks like it’s a big hill. 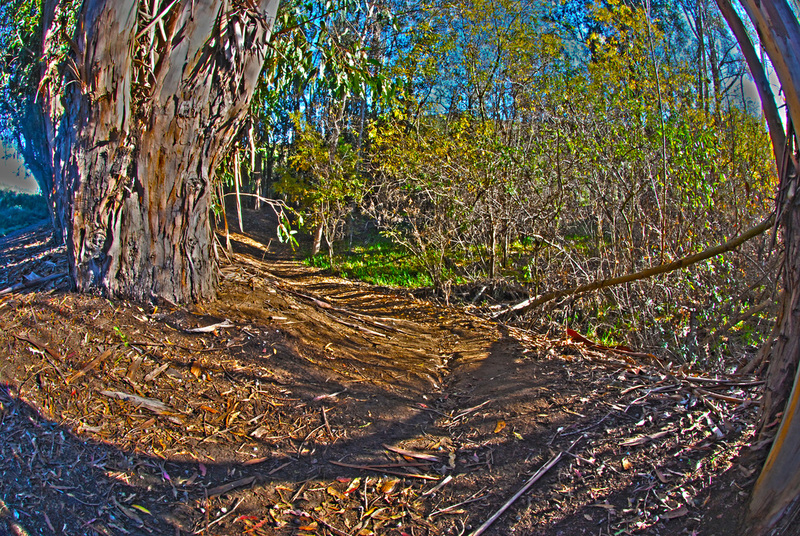 This is a picture of the hill by the duck pond and what I did to make this a better picture I went to Adobe Photoshop CS6 and took 5 pictures of this and used the HDR affect. I like this photograph because of the lighting and the glare of the sun. I think it’s a successful photograph because of how everything is lay out with the hill with great lighting making it look vibrant also with the blue sky. I learned so much as a student and feel that I have improved on how I have taken photograph and also how to use Photoshop. What I would like to learn this year is just to improve the way I take pictures. Micaela Lopez Rubio, class of 2015, The Great View. The title of my artwork is “The Great View”. The reason why I titled my artwork that name is because of how green the trees looks and how it contrasts with the sky and with the sand. The picture is of a big hill. What I did to make it look like this is that I used Photoshop to brighten the colors and background. I like it because of how the colors look and the view. I think that it’s a successful photograph because of the angle that I took it and how clear the photo is showed. I would describe myself as a hard worker artist. What I learned so far this year is the difference to take a pictures with the Camera and using Photoshop. What I look forward to learning is what else we could do in Photoshop. Alex Lucero, Class of 2016, Alone In The Open. In Photoshop I made the brightness and vibrancy high to make the colors pop and have a nice shadow. I like this photo because there are so many questions that you can’t answer. I have taken many different varieties of photos because one minute I take an action photo, then Ansel Adams inspires me to create my own landscape photo. I’ve learned many different type of photos. I always thought you turned on the camera and took a picture, but it’s more than that- you have change the aperture and the ISO sensitivity depending on the setting you are in. I’m really looking forward to making more incredible pictures. Karen Luna, Class of 2016, My Future. I titled my photo my future because this was a project where we had to choose a photographer and then I looked threw her pictures and I saw this one of her taking this shot and I was like I have to take this one because I know that in a future I will want to be doing this . I chose this picture because this is one of my favorite pictures because in the future I would love to become a photographer and in that picture I felt like it was me in the future doing what I love with people. I also love this picture because it looks peaceful and my friend admiring how beautiful she is . 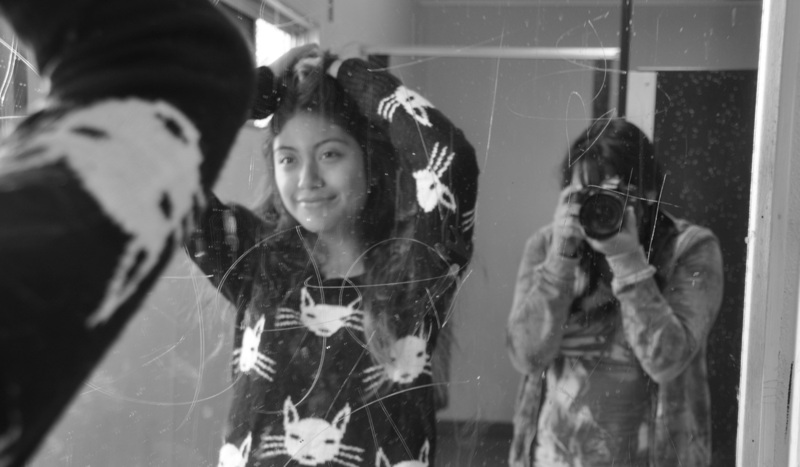 Something that made me take this is that I love how she is looking in the mirror and I’m in the back looking professional like if I was a real photographer and it had to look like it was in the 1950s so I used photo shop and made it black and white. It is a successful photograph because it makes me happy it makes me feel like I look great doing that and where people can smile. I would describe my self as a really good artist and like taking pictures. I have learned so many things I can’t believe how much I have learned such as how to use everything such as shutter speed, light painting ,layer mask, and so much with the beautiful. I would like to learn just how to edit pictures more the correct way and more talking pictures with nature. Alec Madrid, Class of 2016, Tree of Zen. I titled this picture “Tree Of Zen” because it is a very relaxing picture and just very calm. Zen has to do with serenity and this picture explains serenity in the form of art. 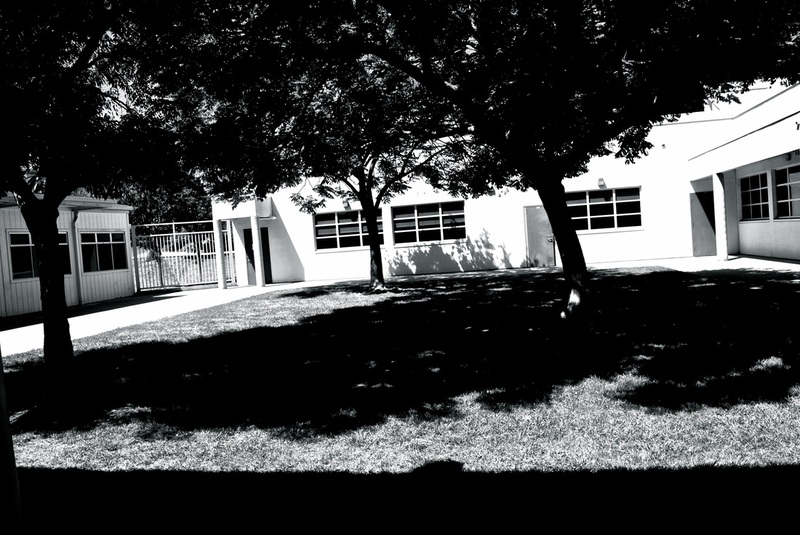 The picture is of a tree at RBVHS with the sun glaring through its leaves and glaring of the camera lens, which creates the little rainbow in the middle of the picture. 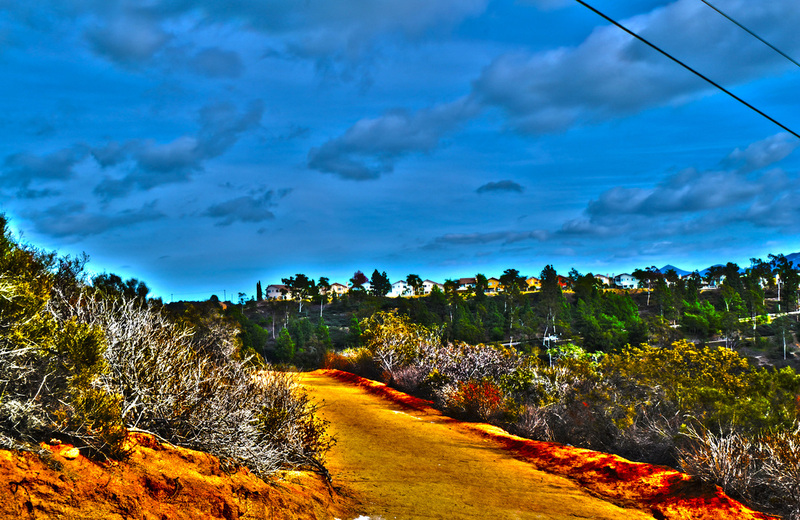 In Photoshop I made the picture more saturated to make the colors pop more. 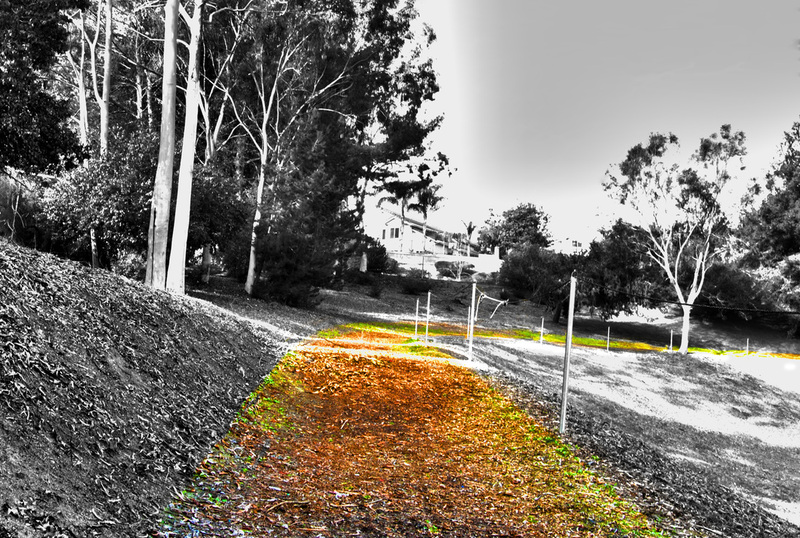 Then I went into the selective color option in “Image” and selected greens to make the leaves pop. I did the same thing for the browns to make the branches and the base of the tree pop more. I like this picture because it can be interpreted in many different ways. I think it is successful because it has multiple different elements in it, such as color, emphasis, and value. I am an amateur still with photography but I hope that I will be a pro by the end of 2nd semester. I have learned how to edit photos in Photoshop and what aperture to use for different depths of field. I want to learn how to perfect my photos and make them look as amazing in my picture as it does in reality. Jesus Manriquez, Class of 2015, Life. I titled this photo “life” because it shows a way life and how it’s always changing. Its shows the life of the tree how it still has it’s leaves but they are still falling slowly. Then how it leads into the other tree at the top and leads down, and how the tree changed because it doesn’t heave all its leaves. 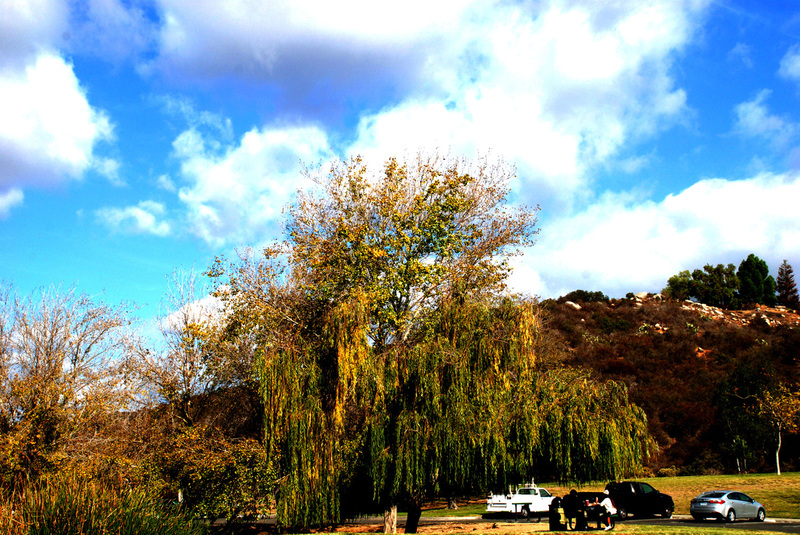 The picture is of the two far trees at the duck pond at the end. I like the photo because it’s bright, peaceful, and it shows depth. I think its successful because it shows a way of life and you can get multiple feelings when looking at this photo. Myself as an artist is that different is normal and normal is different. I’m not afraid to take that weird angel picture to make that one great photo and I push the boundaries. Adrienne Martinez, Class of 2015, Just a Dream. My name is Adrienne Martinez and I would describe my self as a bright adventurous artist. This is my favorite artistic assignment I’ve done so far. The name of my art is titled “Just a Dream” because it symbolizes my dream. Growing up I’ve always dreamed of meeting Chris brown and attending one of his concerts. The original picture is a beautiful photo of Chris brown and his current girlfriend Karrueche Tran posing for the camera. 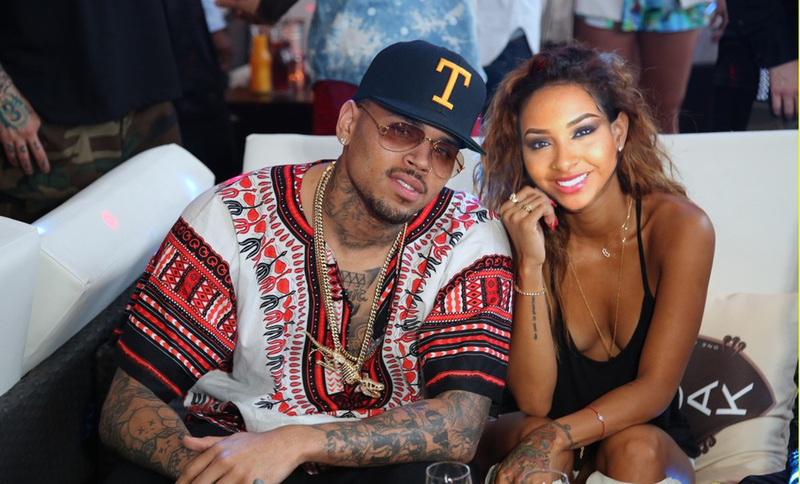 I created this image by using Google for an image of Chris Brown and his girlfriend, Photoshop to replace her face with mine and of course a picture of myself. 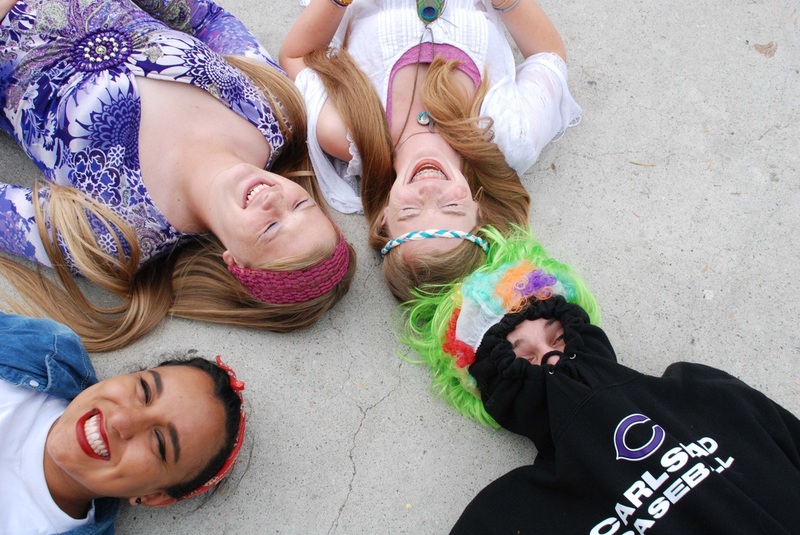 I really like this picture because it describes me and makes me happy. Overall I think this photo is successful because it looks very realistic. Since the beginning of this year I’ve came such long ways because I didn’t know how to do anything related to photography. I was looking forward to Photoshop and I finally got a chance at learning it and I think it was a very successful first time try. Edgar Martinez, Class of 2015, Nature. I gave this photograph the title of “Nature” because I believe that nature is one of the most incredible things in the world. Nature can be found all around the world with a lot of different incredible things that you would never thought they existed. I choose this photo because nature is a beautiful gift to this world. 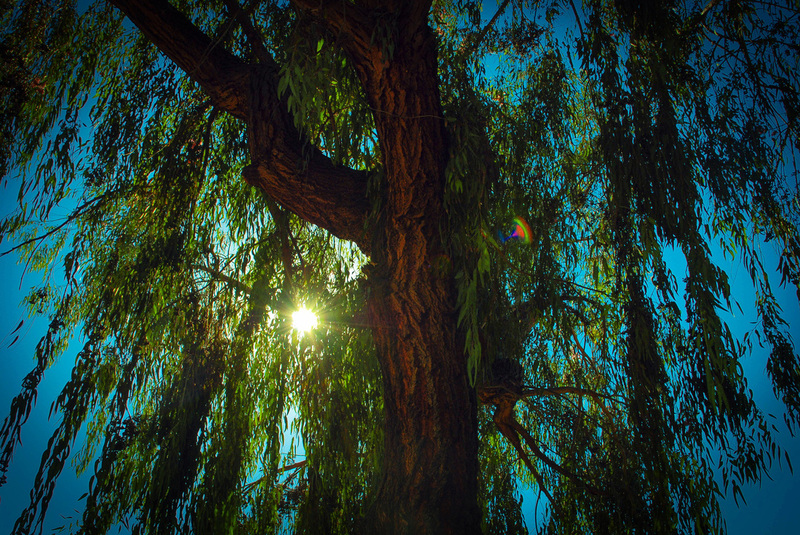 This is a photograph of a tree in the park that I took. The tree is colorful and the background as well. This place was lonely when I took this photograph- as you see there’s no one around. I made this picture special and I love the way it came out. This picture can mean a lot of different things. The color of this photograph brings happiness, hope and faith. The color just brings smiles to faces. This is my favorite photo so far. I wouldn’t describe myself as a very good artist because there’s a lot of things that I need to learn to be a good artist. I would love to keep learning new stuff with cameras and taking more and more photos. Photography is a fun class. I enjoy taking pictures. Sierra Matthews, Class of 2016, Perception. I titled this picture "Perception" because I feel it shows how Martha is in thought and using perception to become aware of something through using her senses, also one viewer may have a different feeling or perception than that of a different viewer. This is a picture that I took of Martha sitting at a table in the school garden looking through the gate as if there is something she feels and is aware of but does not know how to assess the situation. What I did to achieve this photograph was just to simply go to the school garden and place Martha in a spot the shows how I want her to express a feeling. From their I angled myself just right so I could get the table in the foreground of the photograph and Martha right in the middle. The reason I like this photo is because I feel it shows how a lot of students at are school and in our community feel and what that is would simply be, the have an aware sense but that do not know how to deal with it, whatever it may be. I think this is successful because I know many people can relate to it. I would describe myself as unique because I know when people are happy, sad, etc. I have leaned how to take better quality pictures and how to edit pictures in Photoshop and Lightroom. I hope to learn how to take better HDR photos. Cody McKeon, Class of 2015, Perception With A Glass Eye. The name of my photo is called “Perception with a Glass Eye”. I chose that name because when taking this photo I realized how big our city is. From the top of our stadium you can see everything from the local mountain ranges to far away neighborhoods. Your perspective of the city is completely different when looking from above. 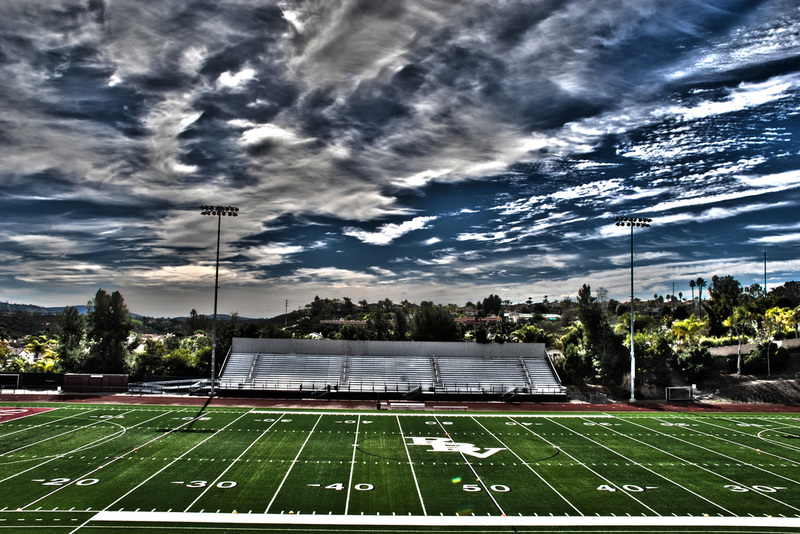 The picture I took is from the top of our stadium overlooking the City of Vista towards the coast. I took 5 different photos, each consisting of a different aperture setting. 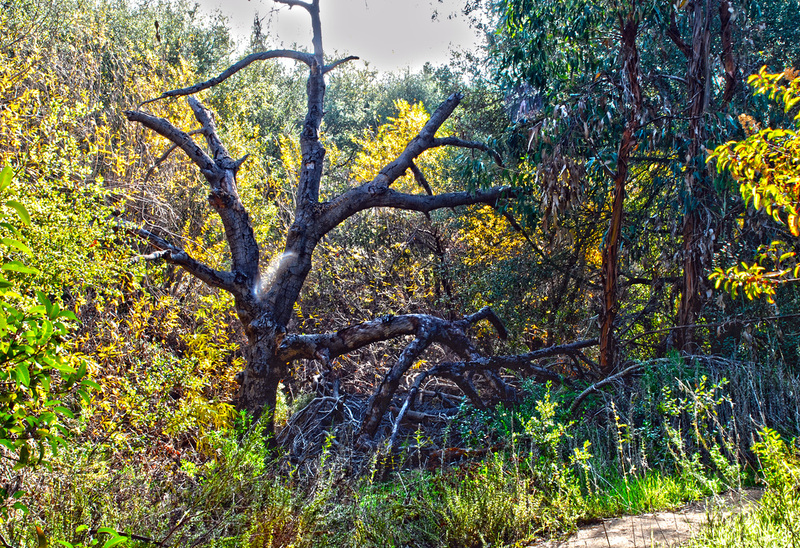 I then went onto photo shop and merged all the HDR photos into one creating a layered sequence. After that I messed around with the gamma and the highlights and shadows to create this silver looking tent across the sky and I added more detail and vibrance to create the lime green of the field and the popping of the RBV logo on the center of the field. I like this photo because it is different and unique. I wanted this photo to look different than everyone elses and have its unique style so this is why I created this photo and it gives everyone a different perspective when it is taken from an aerial view. I am a very creative and unique artist. I love to take photos from different angles that most people would not care for. I like to get large depths of field shots and long exposure shots of things that people pass by everyday without even thinking of snapping a photo. I have learned how to create layer masks and how to brush up objects to fix mistakes and how to layer photos on one another to create a cool effect. I’m looking forward to learning how to get expert shots of objects with long exposure and how to get large depths of field shots and edit them to make them look appealing to the eyes of all. 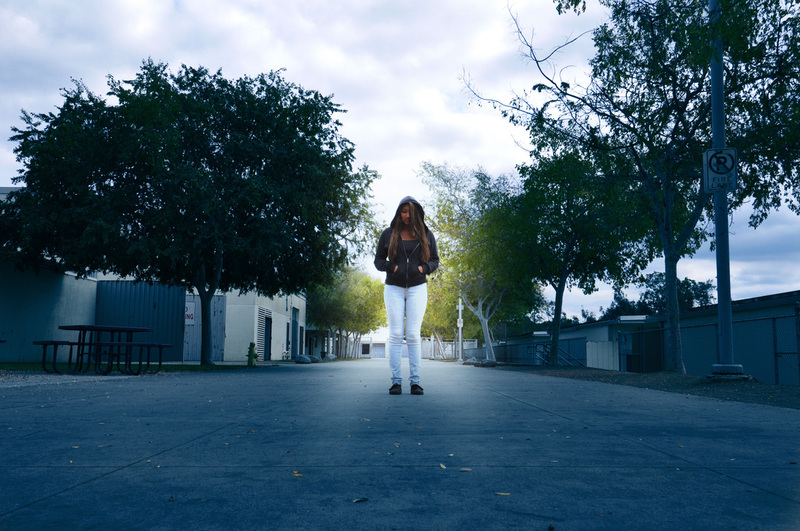 Sioney Medina, Class of 2015, There's Still Light In The Dark. The title of my photograph is “There’s Still Light in the Dark”. I titled my photograph that because you can see that she is surrounded by darkness, but there’s still light around her. I made this picture in Photoshop I was trying to make it look dark and mysterious so I was just messing around with it. I took this picture at school and I thought that it was perfect for what I was picturing.I like this picture the most because I feel like it represents hopefulness. I think it represents hopefulness because even if you’re stuck in the dark there’s still a streak of hope. I think it’s successful because it has detail, it's clear, and I feel like its an eye catcher. I would describe myself as a thoughtful , creative and imaginative artist. I’ve learned how to use a camera properly and the difference of exposures and different things. I’m looking forward to learn many more things for the rest of the year. Hugo Mejia, Class of 2016, Some Nature Stuff. The reason I titled my picture “Some nature stuff “ because it was a picture of a bush with some little flowers in it and I noticed it was just some natural stuff. My picture is a picture of a bush in front of my school. I made this picture by cropping it so it can just focus on the bush that had some flowers in it. Then I copied the main photo and rotated the copies to horizontal and vertical. I liked this photo because it had some red flowers in the middle and you don’t normally see that. I thing this is a successful picture because my picture is very detailed and the red flowers stand out. I describe myself a hard working artist. I have learned Photoshop and how to make my photograph more powerful. I am looking forward on taking more pictures and to be a better photographer. 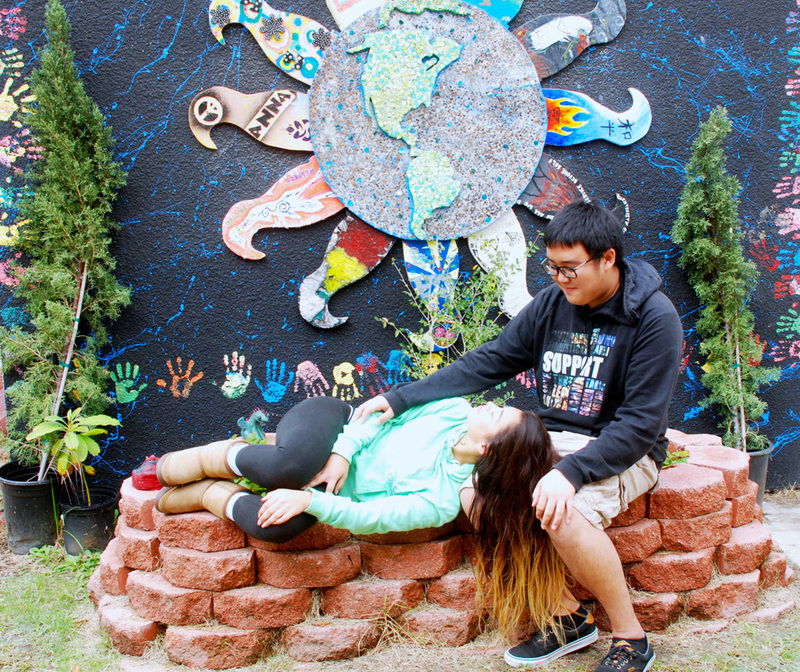 Ashley Melchor, Class of 2015, Nature's Sunshine. I have named this photograph "Natures Sunshine"’. 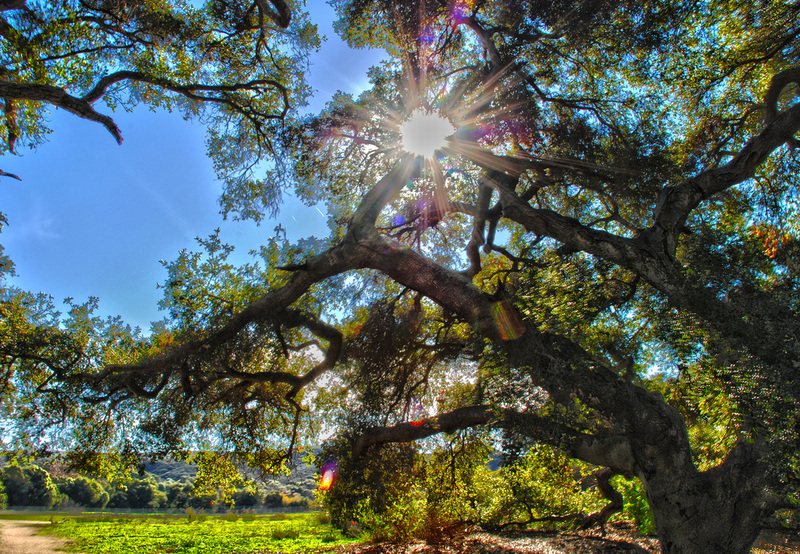 It’s given that name because of the way the suns rays burst threw the branches of this this tree. This picture was taken at the duck pond, this is a good place to take photos of nature because it gives off such a beautiful outlook on the simplicity and serenity within its self. As a photographer I feel accomplished that I am able to define a feeling or a setting with one picture, but I would like to learn more. I look forward to advance my skills on how to set up a scenery involving people. Jesus Mercado, Class of 2015, Picnic Lunch. 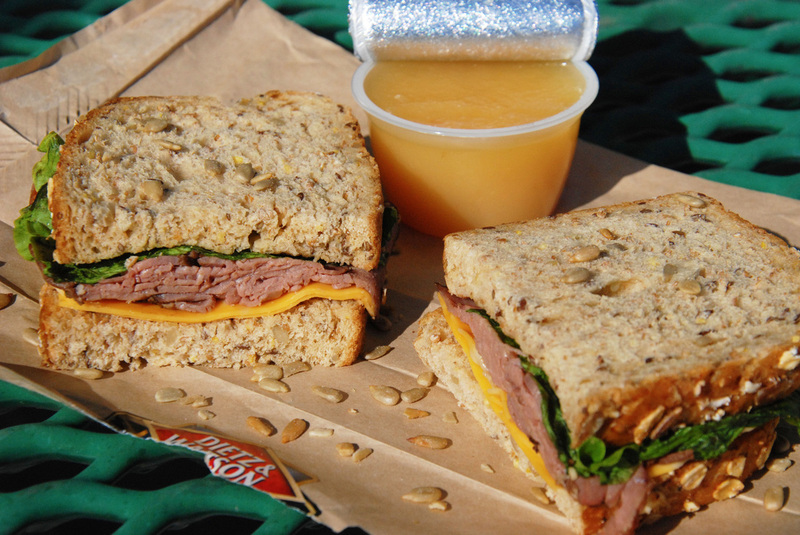 I titled this picture Picnic Lunch because this is the type of snacks or lunch someone would like to take to a park or a picnic. The background of the picture you can see a green table, like the ones you would see in a park. So when I took the picture I noticed that when you look at it, you get an idea that the picture reminds you of a little lunch at the park. The reason I took this picture was because I was doing research on a well known photographer Clare Barboza, who is known for her culinary pictures and workshops. She inspired me because her pictures were well taken and very tasty because you can really tell what the food tasted like in her pictures. I honestly didn’t really edit the picture after taking my photograph, because I really liked how they appeared when I took the picture so I left it alone, because I knew it was a great photograph. I think it’s a very great picture because compared to her work it’s not as good as Clare Barbozas but I think you can really tell how the food tastes like from my picture. It looks very well taken and I really took my time while trying to take this picture, and I get a good feeling when I looked at this picture because I know its one of my best pictures I have ever taken. I joined ROP Photography because I wanted to learn more about taking pictures and how to take pictures, and honestly I have learned a lot since I’ve joined this class. I think I’m the type of photographer who likes to take his time when it comes to pictures, and waiting for the right moment and knowing when a good simple picture means a lot more than just an old boring picture. I like to give it a lot of background because photographs are art and that’s how I like taking my pictures, and making it look as my art in my way. Lucero Meza, Class of 2016, Forgotten. My photograph is inspired by an alternative process. This has been my favorite photograph that I’ve taken so far I think it’s really good. I chose to title this picture “forgotten” I chose this name because this photograph is really low, sad, and serious. Vanessa my model is looking down and that represents sadness, she is showing how she feels. It’s made to look like a historic photographic process, daguerreotype, and emulates Julia Margaret Cameron. To make this picture in Photoshop by changing it to black and white. What I like most about this picture is how detailed and how strong the feelings are represented. I tried making it look depressing and I did, the background also suits this picture. This photograph is successful because it’s really similar to the way and style Julia uses and that is who I was emulating. I would describe myself as a unique artist because I like representing feelings and emotions through the pictures I take, even if it would be a picture of a rock I would like to give it a tone or feeling. This year I have learned a lot before I came into this class I didn’t even know how to properly use a camera and now I am very familiar with it. I also learned how to work Photoshop because at the beginning it was so confusing and I didn’t know how to use it. Ellie Miguel, Class of 2016, Summer. The name of my piece is called SUMMER. I named this piece summer because I took it in the summer as you can tell of the sun shining down on the trees causing the shade. The picture is of trees at their fullest, full of life. I edited it on iPhoto because I think the picture was taken just right for simple edit, just add some contrast and just add so much more highlight. I like this picture because even though it's very simple, there is so much detail in this picture like the shadow and even though its in black in white you can tell it’s a very sunny day which it was and that it is what just causing to want to just sit under the trees. I think I would describe my self somewhat artistic and really good on focusing on just on thing when taking a picture and that I take really simple but good shots when interested. I’ve actually learned a lot this year such as like the setting surrounding you, not just to look for the big in a picture but look at the detail in a setting which is sometimes better. Kenia Molina, Class of 2017, Saturday Morning. What I did to make this photo happen was that I went on Photoshop and I went to “File” then to “Automate” and I “Merged” all my photos. I saved that, and then I fixed it up with some brightness and contrast. I also saturated it and I added a little color. The reason I liked this photograph was because it just looks so real and it makes me feel like I really am there, also because of the reflection of the plants on the water. I just think it’s so beautiful. I think this photograph is successful because I truly took my time on it and I just tried to make it good and it did turn out good. This year I’ve learned a lot, for example I learned how to use Photoshop and how to take proper photos. I also learned how the camera is set up. Yeah, I guess I do describe myself as an artist but I would like to learn more about Photography, to truly describe myself as an artist. This year I’m looking forward to learn more things about Photography. Selena Montes, Class of 2015, The Tree of Life. I named this photograph The Tree of Life because of how the tree looks like and it reminded me of a movie I watched. It is a picture of a tree and it looks like it is tilting and the image looks like a water color painting to me and I like the color. I took this picture at the duck pond and it really catch my eyes. 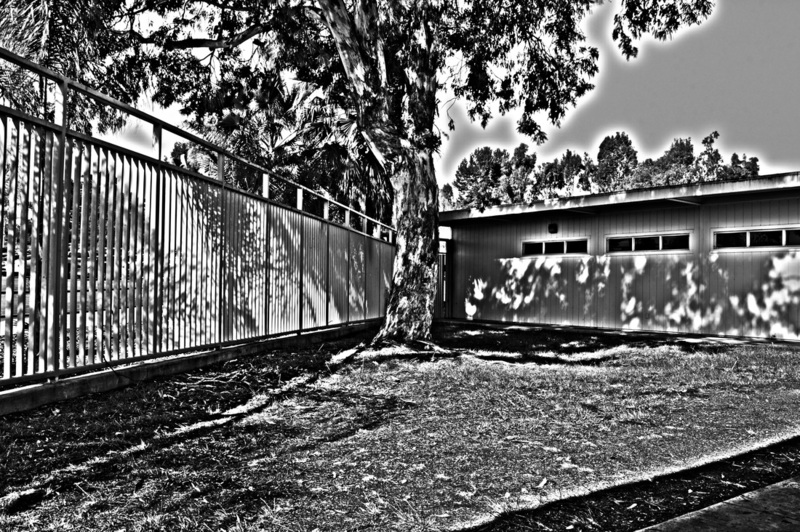 I made this picture using Photoshop and then by going on file and clicking automate and then merge to HDR Pro. and then the image looked nice and then I brightened it up and used a lot of different stuff on it until it was how I wanted the picture to look like and the color. Diego Montoya, Class of 2015, Training Ground. I gave my piece the name “Training Ground”, because this is a place of learning and preparedness for all students that attend Rancho. The photograph consists of our school name and the buildings we were taught in. I used Photoshop’s tool, merge to HDR pro, to enhance the certain colors in the photograph. The timing and placement of the object made the photo what it is by the purpose that the photo represents our “training ground." 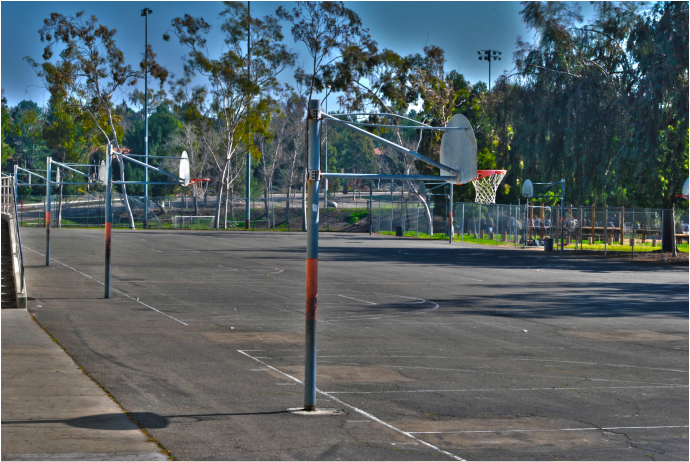 I like this photograph because I believe it’s a good photograph that represents my “training ground” and my school. I believe it’s a successful rule of thirds photograph because the certain object I’m attempting to make stand out is very clear with the light shining right on top of it. I don’t know if I would be able to describe myself as an artist at the moment because I have just began my photographing career in Photo 1. I’ve learned a lot in my short span of taking photographs with digital cameras. I’ve learned how to get exposure on my photographs and how to use photo shop to merge layer masks. I’m looking forward to new projects to expand my photo taking abilities. Andrew Moynihan, Class of 2015, Forward To A Cold Summer Dusk. I chose this name because the leading line travels forward in to the steely, cold blue sky, reminiscent of an early dusk during summer, where the wind bites and the sky is lit up, and contrasts starkly with the vibrancy of the grass and earth. 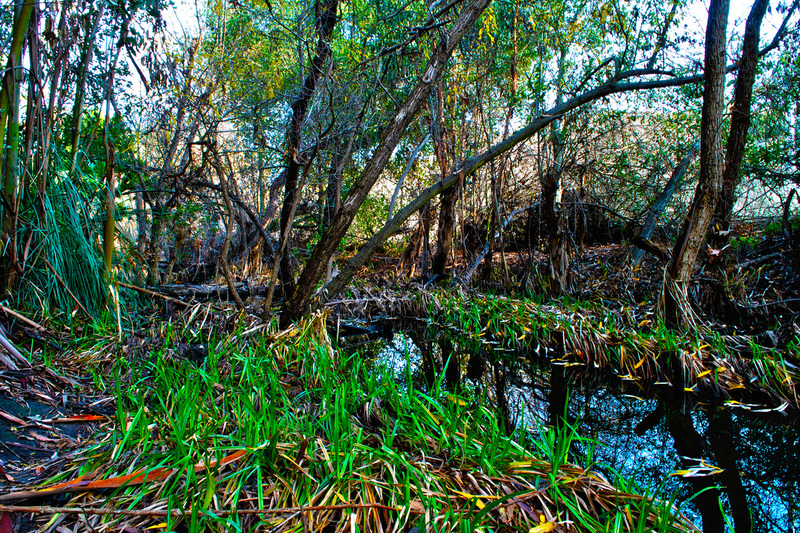 I am not sure how I feel about the HDR editing, I feel the green is almost fake. The grey, steel blue sky contrasts starkly with the vibrancy and color of the grass and earthy ground, and the bench and pole sits in the corner, almost as a grim reminder that nature is not untouched. I like it because even though it is one of my first pictures, I feel that it is on par with many photographs I have seen, taken by professionals and fellow classmates. I am a learning artist, I would say. Not particularly good or experienced. I’ve learned much about editing and picture taking, and I’m not sure what to look forward too and that is what I’m looking forward too. The not knowing. Exciting. Eli Nelson, Class of 2015, The Best Gift. The title of tis Photograph is, “The Best Gift.” I gave the photograph that name because it’s a Gift from God, a gift of Beauty that He gave to us out of his love. This is a flower that I found by the weight room on the school campus that was truly standing out amongst the rest, the only one that had bloomed. I like this photograph because when ever I look at it, it reminds me of all the treasures that have been given to us by God. Even though it is in man's nature to destroy his gifts, God will always keep giving us these treasures because He loves us. As an artist I like to capture the things in life that most people wouldn’t really care to look at in their daily life or even care to notice. I take these kind of photographs so that people still know that those things are still out there and to show that the beauty of those things can still not only be seen but also felt by just taking a few steps back and not just looking at the picture in front of you, but of the picture around you that’s been waiting for you to capture it's beauty. Kevin Ostrout, Class of 2015, Hell's Curse. I called my artwork “Hells Curse” because when I was making this picture I thought that everyone has a dark side and I could see the darkness in one's heart. The picture is of my friend walking down the hallway. I told him to just walk casually down it while I took the picture. I had to take about 7 shots before I got the one I wanted. 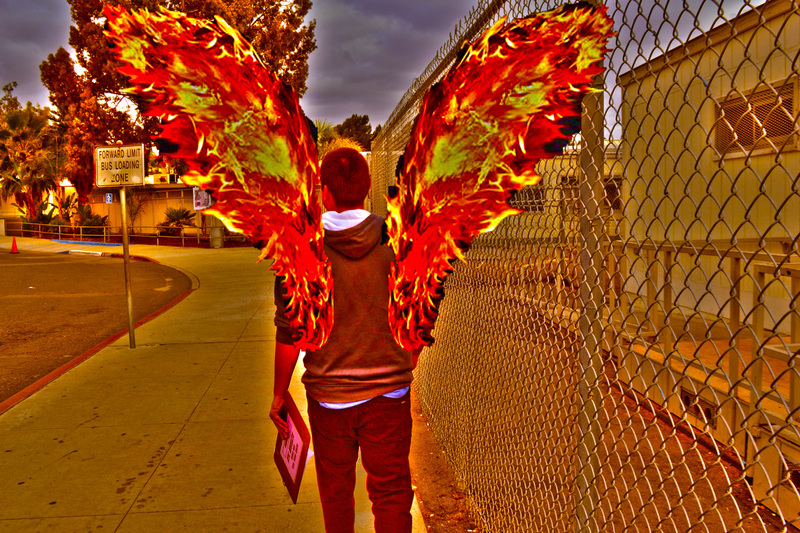 In order to make this picture all I did was grab a pair of flaming wings, cut them out, place them on his back and then change the color of the picture to match the wings to show as if this is what I see through my eyes. I like this photo most because I was always into fantasy, things that weren’t normal. I would describe myself as being someone who sees both sides of the coin and someone who likes to view things differently from others. I don’t want to be like everyone else. I am my own person and I will stay that way. Even though my life is changing so rapidly I treat each day as if it was the last. Each day is a gift not a given right, that’s why they call it the present. Alondra Osuna, Class of 2016, Black and White. I titled this piece “Black and White” because when the color is drained from a photograph, it can get someone to think more and take the picture into mind. The photograph was taken to emulate the alternative processes while taking ideas from well-known photographers. To make the picture have the drained color and the slight cement texture, I used Photoshop. I made Lesly be the main focus of the photograph, making sure that the cement texture I used to give it detail gave her the look to stand out. I like the photograph because it’s not a cliché picture of someone smiling, or someone looking at the camera and people who see it won’t give it thought. I believe that it is a successful photograph, because it can make people think; even something simple: “Where was this photo taken?” “What was she looking at?” or even “What was on her mind?” I don’t have a full aspect of how I would describe myself as an artist because I’ve just been able to use professional cameras, and learn the basics of making a picture stand out. I’ve learned much this year, learning how to work the dials on a camera, how to get the perfect shot, so on and so forth. I am looking forward to learning a lot more, for example, learning more ways to work around Photoshop, and the projects that are to come. Vanessa Padilla, Class of 2015, The Path. I titled this piece ‘The Path” because it’s the path to a new beginning. I am a senior here at Ranch Buena Vista High School and will be graduating in less than five months, and I will be starting a new path. This is a picture of lots of different trees and only one path. That’s what life is, you meet different types of people but we always try to achieve one thing and that is to always be better. What I did to create this picture was through Photoshop I made this photograph into HDR. I like this picture because the colors actually pop out like the green and the brown and how the path is free anyone can pass right through it. I would describe myself as a very unique artist because I always try to take pictures of things that relate to my future and me. This year I have learned how to use Photoshop but I am looking forward to become a better photographer. Claire Peluso, Class of 2015, To The Point. This piece is called “To the Point” because it’s a photograph of a cactus consisting of multiple points from the spikes as well as the points on the leaves of the succulent. 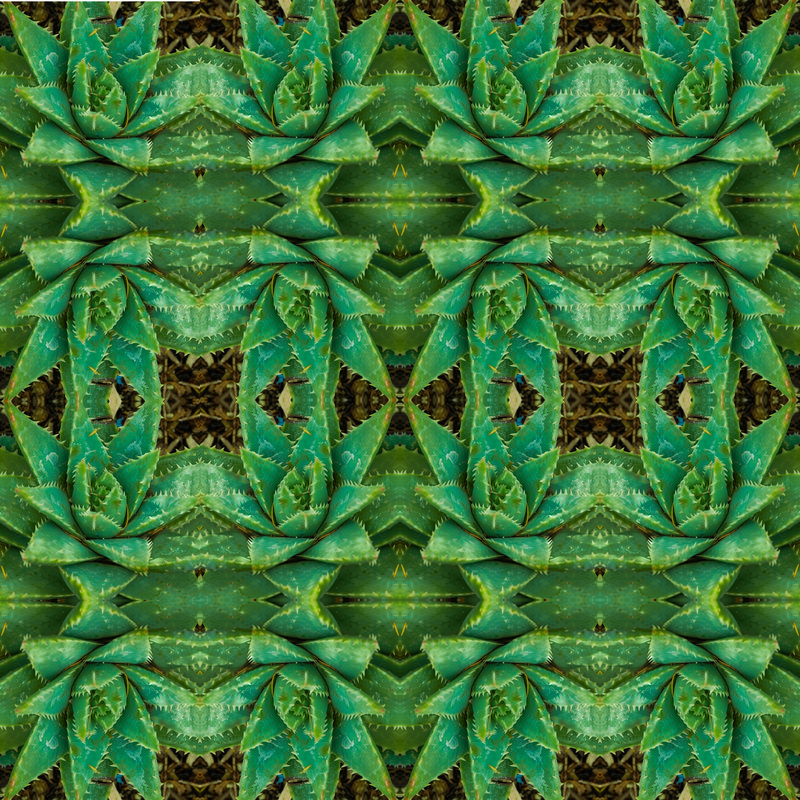 This picture represents a close up off a cactus, which has been taken and transformed to mirror it’s self on horizontally and vertically, resulting in a Mandela. I first edited the photo to saturate it more. 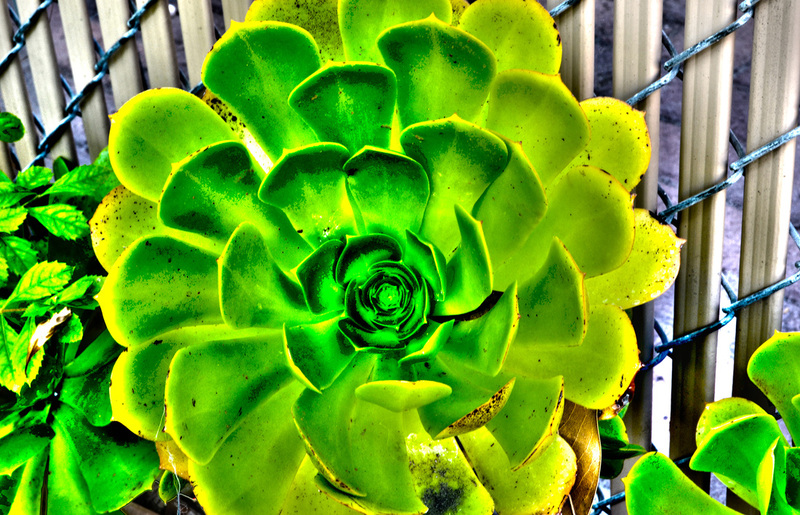 Then in Photoshop, I cropped the photograph to focus more on the center of the cactus. Then I used a specific template that consisted of sixteen two-inch squares, I altered the image to mirror it’s self in each of the for groups of four squares. I enjoy this photograph because of the vivid colors it displays as well as the unusual geometric shapes it creates. I believe it is an successful photograph because it displays a proper Mandela format. I would describe myself as an intricate artist that strives for perfection. I have learned how to properly use a camera and how to properly edit a photograph using Photoshop. I look forward to the “Invisible Man” project as well as becoming more and more comfortable with taking and editing my photographs. Alia Perez, Class of 2016, Growth. I have chosen to title this because when I took this picture it was a healthy succulent still growing. My picture is a lovely bright succulent with little clovers surrounding it. What I did to edit my picture was using photoshop and I clicked on saturated and just edit it manually. I like it because it was the only succulent in that area and the clovers made it stand out more. I think its successful because the camera focused on the succulent and it had no background to it. I don’t consider myself an artist I prefer myself as a learner. I learned to use different cameras and other equipment. Junior Perez, Class of 2015, One of A Kind. I choose to do my artist write-up on the high definition resolution assignment we recently worked on, I did it on the crop picture. I titled this piece “One of a kind”, because it is located behind the weight room and there are a lot of plants similar to it, but this it was the only one the looked slightly perfect and caught my eye. I decided to do my assignment on this particular piece because of the way it came out after the effects from Photoshop and it was also the only one that wasn’t messed with, so it stood out to me. Maria Perez, Class of 2016, Orange Flower. The title of this artwork is “Orange Flowers”. The reason I gave this artwork this title is because the orange flower is the one that gives more texture to the picture. 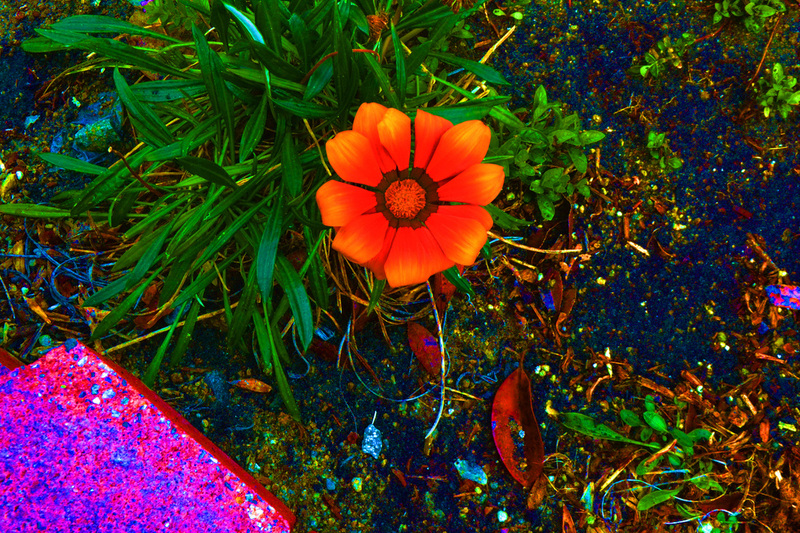 This is a picture of a flower that I took behind the weight room in the garden. I was aiming to get a crop picture for the HDR photos. I like the color it gives to the picture because it makes it stand out. I have learned how to edit pictures and I am looking forward to advancing in taking better pictures. 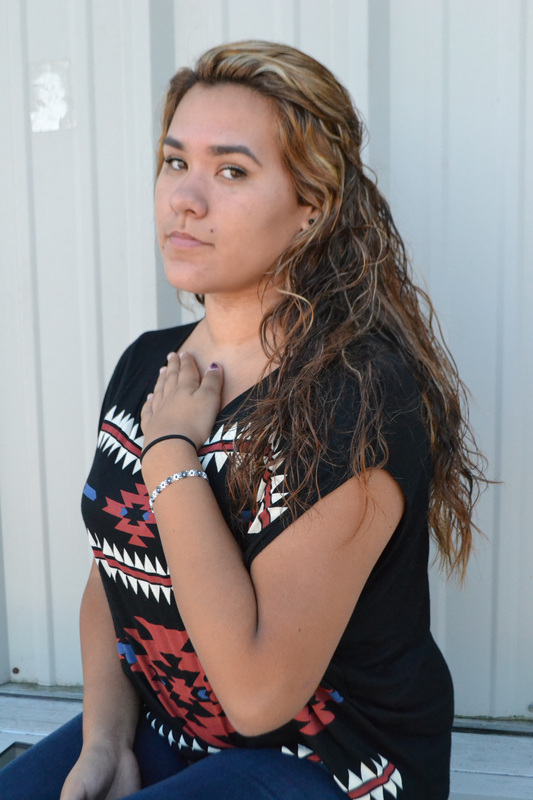 Lesly Ponce, Class of 2015, Secrets Within. 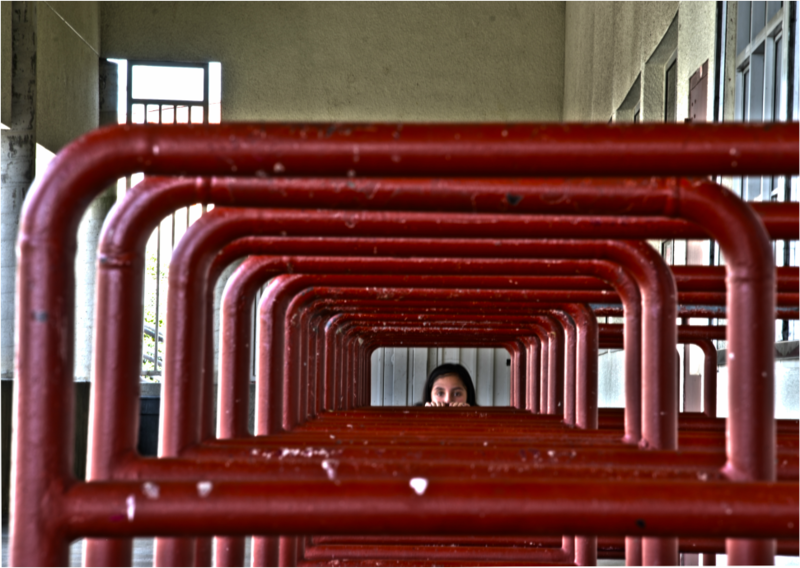 I have titled this photograph “Secrets Within” because Alondra seems to be hiding behind the metal bars. There is also a sense of mystery showcased within her face. This is a photograph emulating a certain alternative process such as cyanotype. We were allowed to go outside and take pictures around the school and then download them onto iPhoto and transport them to Photoshop to edit them. I like this photograph because it encases the many tips that Mrs. Moncure has taught us in order to take amazing photographs and also, how well details both in her face and the palm trees are captured. I would describe my self as a diverse artist because I don’t have a precise style yet somehow when I am out photographing I get a split vision and I just have a sense that this is what I have to photograph. What I have learned this year is to be able to capture magnificent subjects and landscapes in a way that a story can be told through the photograph. I learned how to use the various techniques given by Mrs. Moncure in order to make sure that the images taken would be captured almost perfectly. I want to learn how to encompass the abilities that I know I have and be able to break from my shyness in order to work with my partner to get beautiful pictures. As well as learn all that this class has to offer such as many more tools that help an image become more mysterious and grandiose. Violet Preciado, Class of 2015, The Sky is The Limit. 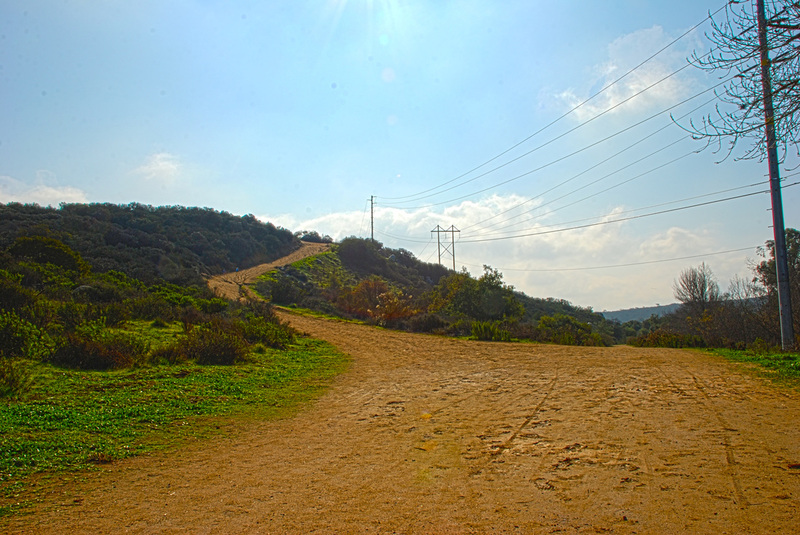 This picture has the title of “ The Sky is The Limit “ because as the dirt trial leads to the very highest point of the hill, it can be perceived as though the hill is leading up towards the sky. 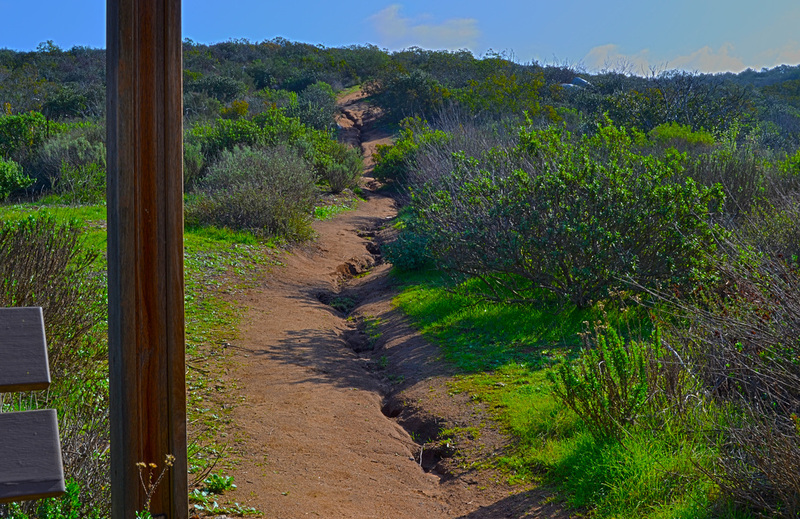 The trail is surrounded by beautiful green plants and grass; along with visible footsteps imprinted deeply into the dirt. What I had done to make this picture so vibrant was that I had adjusted the volumes of saturation and detail in Photoshop. Taking this picture I had used a tripod, which made it a lot easier to capture the right amount of pictures to combine in perfect sync. To describe myself as an artist so far would be that, in the short period of time being inside of a Photography class I’ve gained so much knowledge with cameras along with how to use them properly. I’ve learned how to use Photoshop and have mastered new techniques that are used within the application. I plan on growing more and more through this semester with the time I have left and will set a goal to thrive higher as an artist. Christina Quevedo Sepulveda, Class of 2016, Portrait. Juliet Margret Gardner was the original photographer of a picture similar to this and so my assignment was to re- create that picture so I used Elizabeth as my model. I named this photograph portrait because it basically is a portrait of her. I took this picture with the Nikon camera and I went on Adobe Photoshop to edit it. I don’t have the edited picture but I made the picture in the style of tintype. I like this picture because not only it’s a beautiful picture, you can tell what vibe she’s giving off, her emotion, what she’s feeling. As an artist I describe myself as a perfectionist because everything for me has to be perfect. I made sure her hair was out of her face, everything was straight and in order. So far this year I have learned more about the camera and its functions. I’m looking forward this year to learn and gain more knowledge about photography and also get to work with the camera a lot more. 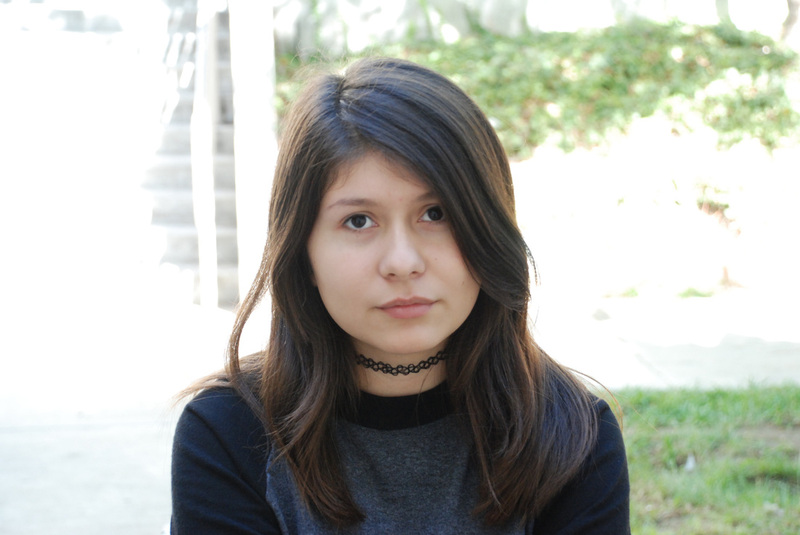 Aurelia Ramirez, Class of 2015, Where The Mind Takes You. I named this piece where the mind takes you because, for me it brings back my childhood. When I was younger I used to see the whole world colorful, clean and safe. In the picture there are rocks and trees a small lake and mud. I love the out doors and this picture shows me exactly why I love it so much. 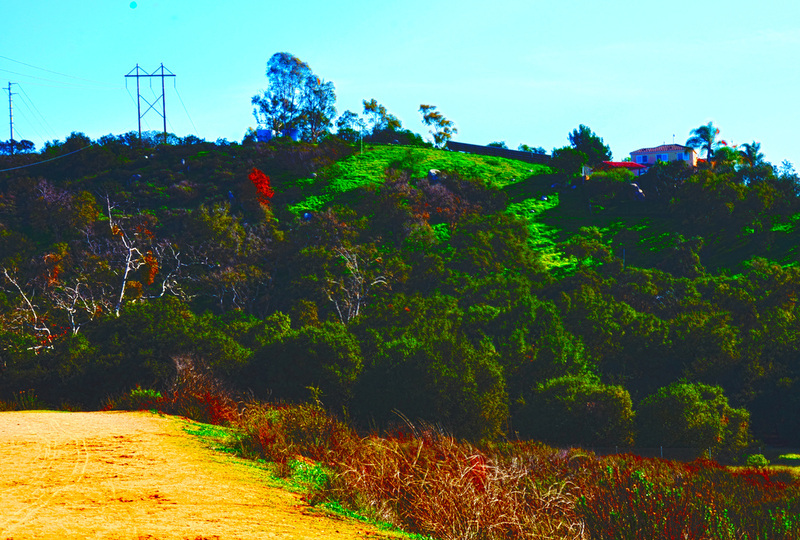 I saturated the picture to make it all brighter and more vibrante. I have grown as an artist because I like to look at setting differently, I love to figure out ways on how I can take a certain picture of a family member or landscapes. Sometimes even really cool wedding or party ideas like the light painting project. I have grown to have a really strong passion for photography. 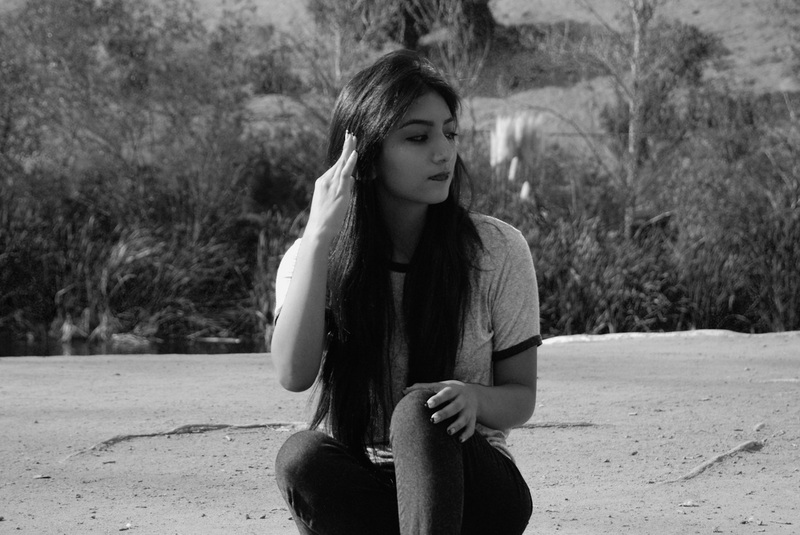 Jessica Ramirez, Class of 2016, Rebel Without A Cause. I titled my photograph "Rebel Without A Cause" because that was the movie that made him an icon in his generation. That is how he became a Hollywood legend. This picture is of a famous actor named James Dean who had become an embodiment, because of hit big hit movie “Rebel Without a Cause”. I made this in photoshop, and it took a while to finish since I tried to make everything perfect. I really liked this photograph because the way that it is structured made me really happy. I think that it is successful because the ways that it looks is different than it just being one. I would consider myself an artist because I am able to express myself through all my pictures. I’ve learned so many things in a short period of time for example making mandalas, HDR process, alternative process, and layer masking. I look forward to learning more things in Photoshop and Lightroom. Mahde Ramlaoui, Class of 2015, Eye Of The Beholder. The title of my photo selfie is “Eye of the Beholder”. I choose this title because it simply fits the picture and it goes along with the message: One cannot find true happiness until they are able to see themselves for who they truly are. 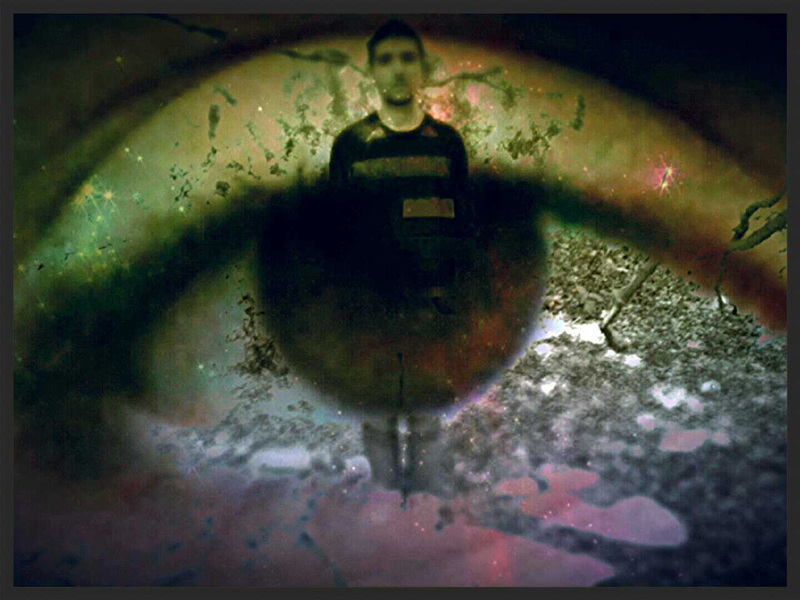 This is a blended photo of me in the background and an enlarged picture of my eye in the foreground. This piece was made entirely on my cell phone believe it or not. I simply used a bunch of blending apps I found on the marketplace at the time. I like this photograph because of its complexity and how it didn’t take much to achieve it. I would describe myself as a very out-of-the-box artist. So far this year I have learned too much to list but I can tell you I look forward to learning more about Photoshop. 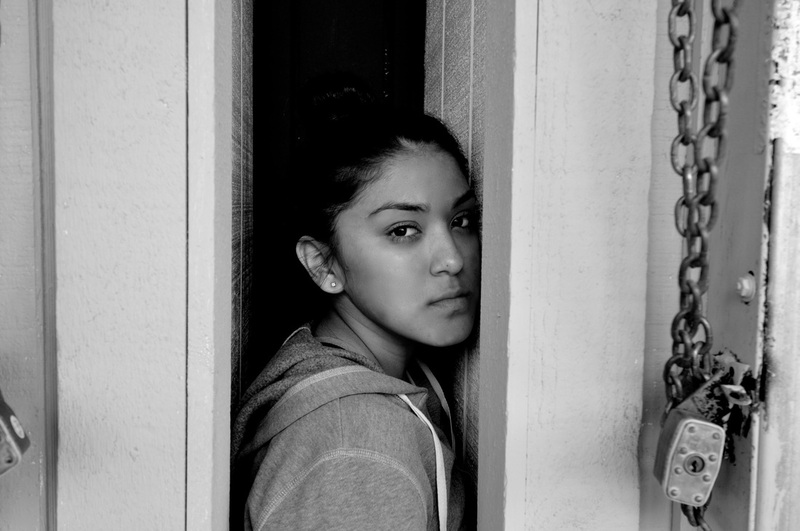 Mayra Ramos, Class of 2015, More Than Just Existing. Music is great but seeing and hearing that song you replay on your phone live, is amazing. Feeling the vibrations of the speakers all throughout your entire body makes you come alive. Moments like this make you feel like you’re not just existing but actually living. I had the chance to see one of my favorite bands, Switchfoot, at the San Diego County Fair. 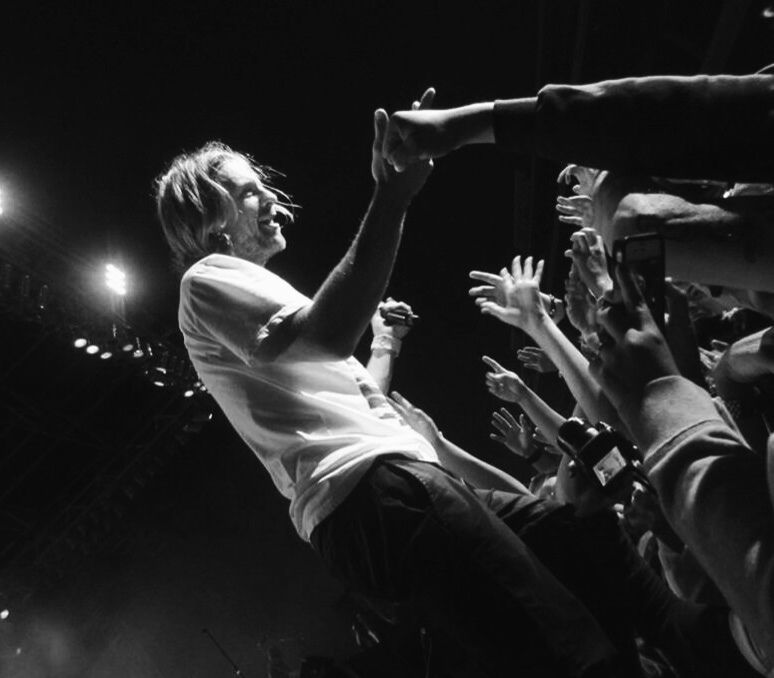 The lead singer Jon Foreman stepped off the stage and joined the crowd adding a sense of unity and freedom to just let go and enjoy who you are and where you are at that certain moment in time. This is my favorite photo because I captured the exact same thing I was living in real life. When I see this picture I can honestly remember every single thing that happened that day. I didn’t do too much the photo but I used VSCO cam app to change it to black and white and make it brighter. As photographer I would describe myself as very free and open to anything, I use photography as a way to express myself and document unique experiences in my life. Cristian Renteria, Class of 2015, The Wilderness. I chose this photo because it’s out in a park and it reminds me of the wilderness. The two trees remind me of how beautiful being outdoors is. When I took this photo, I really took the time to look at the different angles I had and it came out just well. I believe the bright colors and background really bring out the photo. I saturated the photo which made it more colorful. Eric Reyes, Class of 2016, My Best Friend Kim. The photo above is of my best friend Kim, I feel great to have her in my life. She is one of the sweetest girls I’ve met and the greatest person to talk to, we can literally talk about anything, even about stuff that all girls never talk about, which makes her very fun. I titled this “My Best friend Kim” because she just wasn’t my girlfriend but also my friend. I feel bad to have lost her as a girlfriend, but I can’t be too down, I still have her as friend and she is always there to lend a hand. I did nothing to tinker with this photograph on Photoshop because I felt that this photo was already great as it is. It looks great to me and I feel that I don’t need to “wow” anyone with adding anything extra. It’s a simple photograph of a lovely women. As far as I know about being an artist, I don’t see myself as in artist by what I photograph, write, draw, etc. and I don’t doubt myself either, what makes me feel like an artist it’s if my work makes you feel like I do. I really don’t care what people think. I don’t aim to impress anyone. As longest the audience understand me, then I know I did a good job. I don’t know how I’ve grown as an artist in anyway? But I am just a kid, I still don’t care. I have a lot more growing up to do. I just aim to have a good time and make memories. What I carry from this photograph is all the time spent, not wasted. I know we will continue to make memories, I’m glad I get to do it with my best friend Kim…. Jaime Robinson, Class of 2016, Restrained. The title of this picture is “restrained” because it is meant to represent the fact that in this generation, it is so hard to genuinely be yourself. People now-a-days are pressured into conforming themselves into what they think people want them to be. This is a picture of Jeffery who is sitting behind a fence that I took at the duck pond. To make this photograph, I used Photoshop and brightened it up a bit, and then I just put a black and white filter over it, and then I was done. I think this is a successful picture, and I like it because I am a big fan of black and white photography. I also like the dramatic effect that the black fence brings. I would consider myself a decent artist, and I have learned a lot this year because at first, I didn’t know a thing about photography. There are a lot of things that I look forward to learning in this class, and that includes things like different tricks you can use on Photoshop. Stephanie Rodriguez, Class of 2015, Peace Of Mind. I named this picture peace of mind because when I found this scene I thought it was really pretty. The location of this photo is a place I would go to just think and relax. I believe it really would help give me peace of mind. This photo was made in Photoshop. It was from our assignment of HDR photos so I took 5 photos of the same thing, but with different exposures using -.5, -1.0, +.5 and +1.0. I really like this photo because of how the water directs your eye and just how beautiful and peaceful it is. It gives off a calming sense to me just by looking at it. As an artist I would have to say I have grown a lot in the past semester, I have learned so many techniques to use on my own in the future. This class has taught me about the principles of art and how to take a good picture. I have learned to use Photoshop and have grown to love using it. I am looking forward to learning more about how to take great pictures and different techniques that will help me when I graduate. 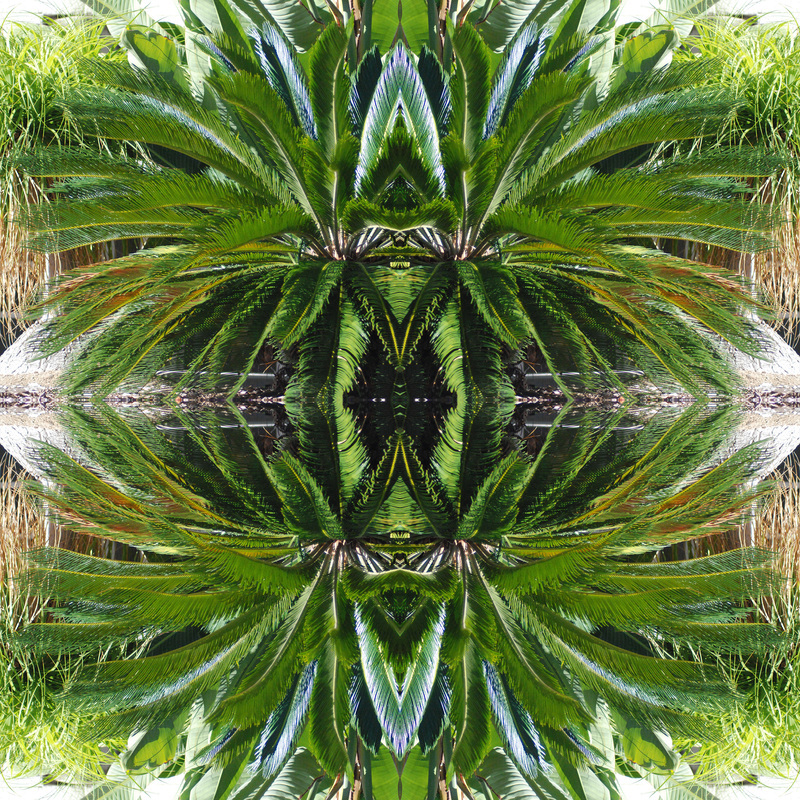 Elizabeth Rodriguez, Class of 2015, Palm Tree Mandala. I titled my photograph that way because its pretty self explanatory. It looks like there’s water in the photo but it’s just a reflection of the tree. 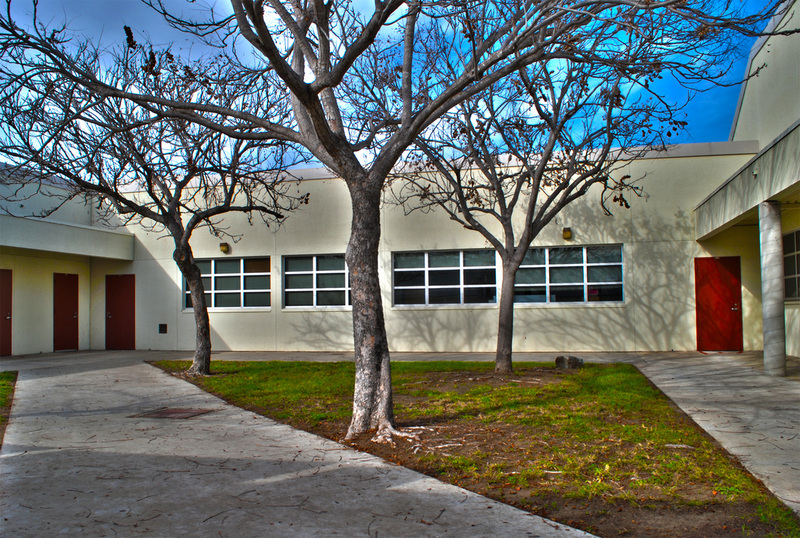 My picture is a palm tree that’s located in front of the school Rancho Buena Vista. The program I used to create this is Photoshop. I added more saturation to the photograph to make it more bright and clear. I like it because when you first glance at it looks like there’s water on the side as if the tree was inside a pond but what’s really looking like water is the rock that’s next to it. What I’ve learned this year is how to make photos so real. 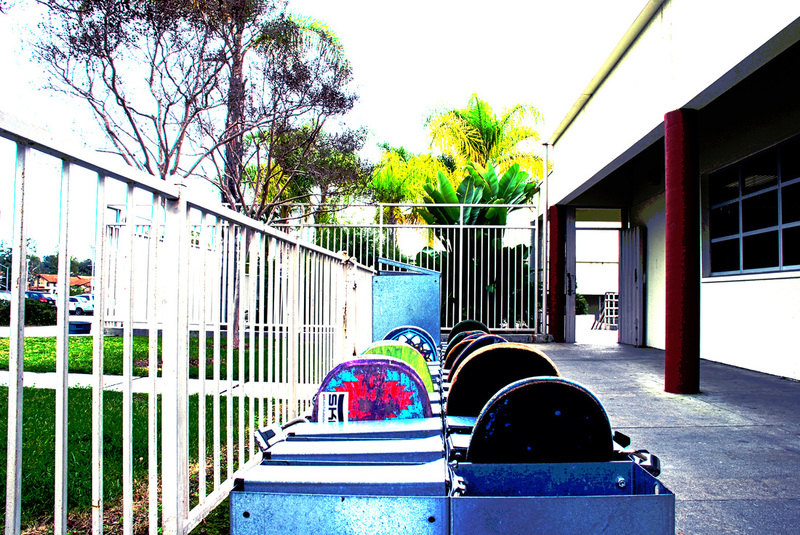 This was one of my favorite projects because I enjoyed taking the pictures around school. It was a successful photograph because I liked the way I cropped it. Emily Rodriguez Johnson, Class of 2015. Jessica Romero, Class of 2015, Choosing Your Path. 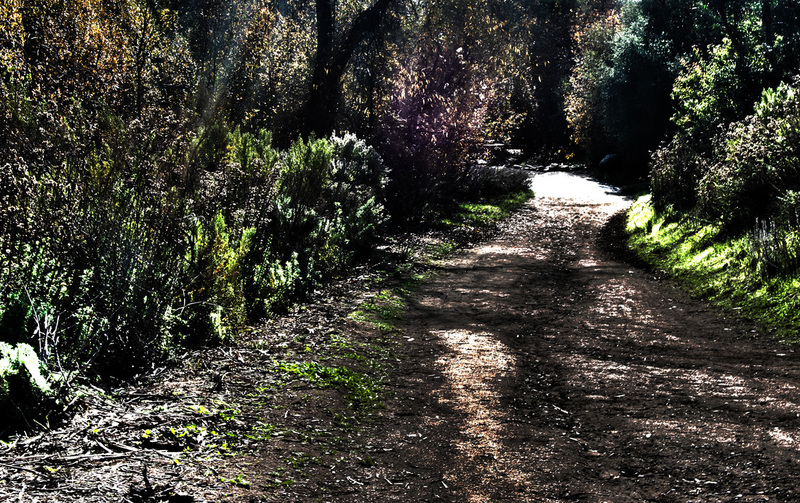 I have titled the photograph, “Choosing your path” because I think that this picture shows a clear example of a path. 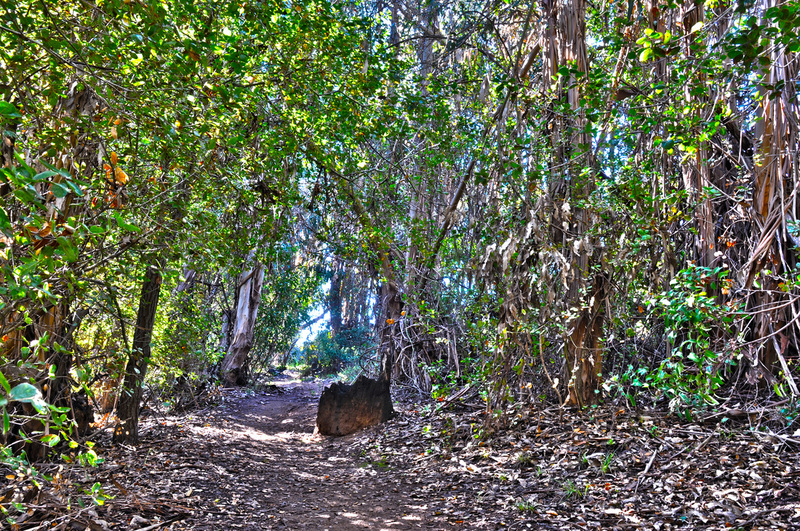 The picture is of a pathway surrounded by plants, trees and a lot of different kinds of bushes. 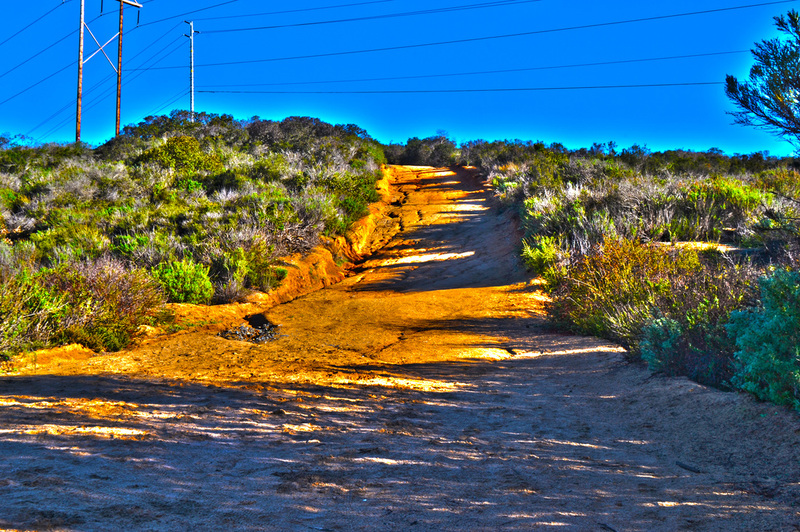 The steps that I did to make it look like that were that I edited the photograph in Photoshop and then went to HDR pro. I took 5 pictures of the same photos with the exposure of -.5, -1.0, +0.5, +1.0 and then with Photoshop I merged them together and then I put more saturated and it made the picture look brighter and have more shadows. I like this picture because it looks really cool with the editing and I like the way the colors come together and the shadows create a more dimensional look. I think this is a successful photograph because I really like how it came out and the colors it has. I would describe as an artist who wants to always learn and keep improving my work to make it better. I have learned a lot since the beginning of the school year. From learning how to work photoshop, to editing. I am looking forward to just learning how to become a better photographer. 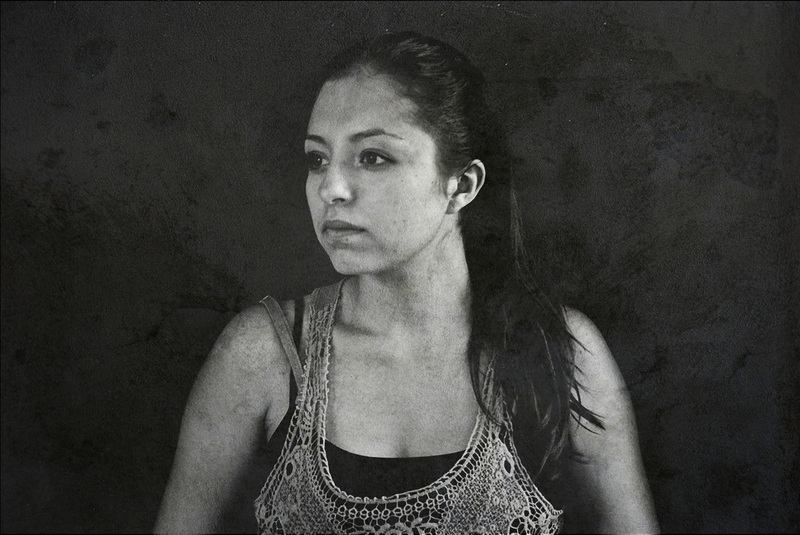 Beatriz Rubio Gutierrez, Class of 2016, Longing. The reason to as why I chose “Longing” as the title was because this picture was representing the time era of the great depression. A women, a mother who’s troubled and thinking of what’s to come next, what to do and what’s going to happen. The people in the background are supposed to be her kids sad and hiding away from the camera so all focus is on the mother. On Photoshop I had to change the color into sepia to give it an old feel and look. Along with that I had to look up a picture on Google of concrete. Once I found one that I liked I merged both photos so that the blended in together to create a wrinkled old look to the photo. I really love this photo because of the look and feel it gives is takes us back in time and reminds us of The Great Depression gives us a sense of history. I got a lot of wonderful comments on this photograph and I decided to chose this one so that more people can see how beautiful this picture is. 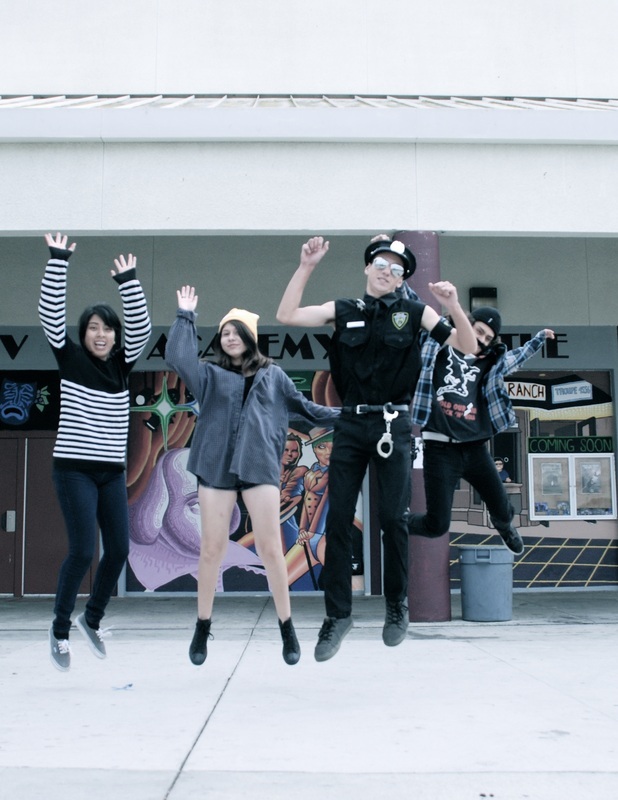 Alina Ruiz, Class of 2015, Think for the Picture. I named my title, “Think for the picture”, because the thought in the photograph was my partner Javier Garcia thinking and I just snapped a photo of him. This picture is of my partner just looking down and thinking of anything that can be happening at the moment the picture was taken. What I did to make my photograph look like this was crop some of the photograph and make some adjustments to it and make the contrast lighter and clicked on Black and White. I like this photograph because it shows a lot in my partner and how I caught the perfect moment. I would describe myself as an artist because I have learned how to take pictures and how the camera adjustments work now. I look forward to learning more about photographs and just how to take better pictures than I have before. Victor Salazar, Class of 2015, Amazing Nature. I picked the title Amazing Nature because my picture shows a lot of plants and tree showing the true sense of nature about how being outside can be so relaxing and amazing. My picture is about landscaping and showing a lot about nature. I edited this photo by using photo shop and combing 5 of the same pictures with HDR. I took this picture at the duck pond. I like this picture a lot because it came out pretty cool and just the amazing colors can really make the picture look so amazing. I think this is a successful picture because it shows a lot about landscaping and nature, which I tried to show. I can describe myself as a creative artist. So far this year, I’ve learned a lot about pictures but my favorite thing I learned this year is how to combine 5 pictures and using HDR to create pictures like this one I picked. I’m looking forward to learning more amazing things to create and edit amazing pictures. 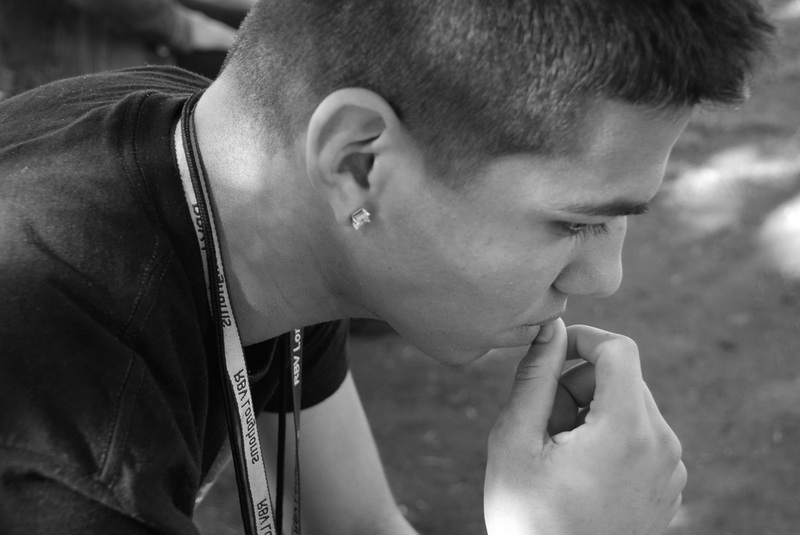 Nick Sandoval, Class of 2015, Life Surrounds Death. The title of this photograph is “Life surrounds death”. I gave it this name because in the ashes of fire and destruction, new hopes and promising life will spawn. Hope is what motivates emotions and a goal for a better life for our future generations. This shot is of a burned tree slowly falling with the passing of time surrounded by the growing green grass and trees that are eventually going to swallow up the dying tree and bring new life. I took 5 pictures of this image, changing the aperture between each shot to capture the darkness in the shadows and the highlights from the sun. In photo shop I merged all the images and made a created one final layer. I like this picture since it reminds me to keep hope even in the darkest times because the darkness is surrounded by light waiting for the right time to present itself. 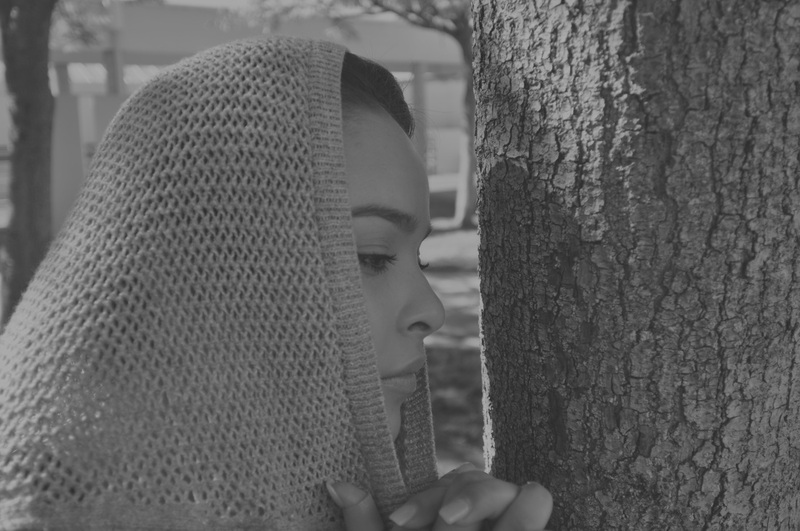 Karley Smith, Class of 2015, Hidden Emotions. I titled this photograph hidden emotions because the way its foggy and dark, and the way she’s sort of hiding behind the fogginess. I think of teenagers when I see this photo because all of us have hidden our emotions at some point in our life and nobody see’s how we really feel which is what the fog represents. Her face expression is serious but calm too, and the way her hand is over her heart kind shows she has all kinds of feelings going on. The picture is of Brandy Velasco leaning against a pillar, making you feel the seriousness she’s giving off. I made this photo in two different places; first was Photoshop where I made the image black and white, the second place was lunapic.com which made it have the cloudy look. I like It because it shows a girl who looks serious and afraid, but she also has hope in her eyes. I think its successful because of the way it makes you feel right away. You automatically want to know what she’s feeling. I would describe myself as artistic and unique because I tend to always want to take pictures that tell a story or can apply to your feelings. So far this year I’ve learned that little things matter too and sometimes the big picture isn’t the big picture, as well as understanding a photo and being appreciative of what you get from it. I’m looking forward to becoming more artsy and learning other types of photography editing. Ria Soriano, Class of 2015, Fearless. I come from a place where fear isn’t part of our vocabulary; hence the title of the photo “Fearless.” My family doesn’t scare easy and I especially don’t either. This photo is a photo of my oldest brother. 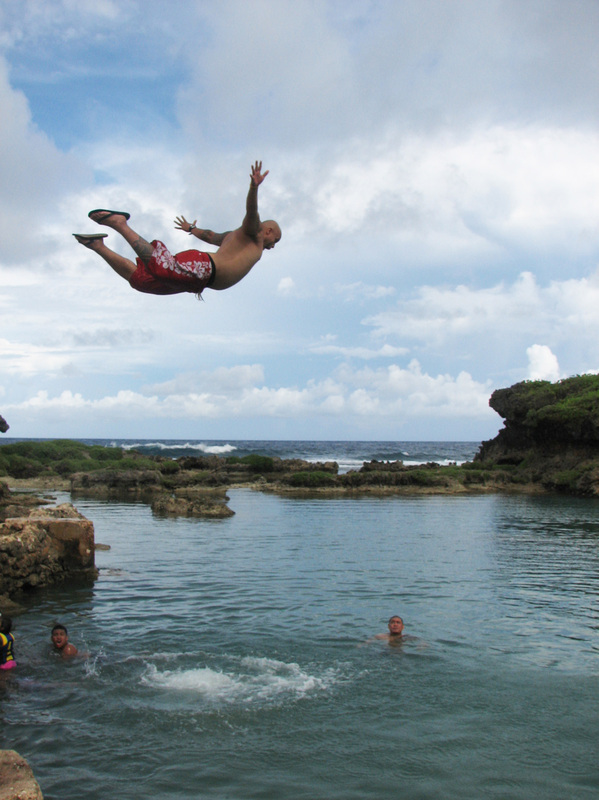 It was taken in the island we’re from, Guam, in August 2014. I can remember this specific day like it was yesterday. It was a day of fun, memories, and family. Here, my brother is jumping off of a ledge as I stood off to the side waiting to catch that perfect moment. That moment when you feel that rush of adrenaline in your head and get butterflies in your stomach. That moment where all your worries go away in a matter of seconds. That moment where you’re ultimately free. In order to get this photo to my satisfaction, all I had to do was brighten it up a little bit. To do that, I used Photoshop and I really like how the brightness affected the photo, making the clouds stand out, giving it a harmonious appeal. I really like this photo because it has complete sentimental value to me. It’s one of the most memorable times of my life and I know it’s successful because it tells such a great story, which is exactly how I would describe myself as an artist. I love being able to capture moments of time that make you smile. To me, if a picture can make you smile, that’s all the success you need. 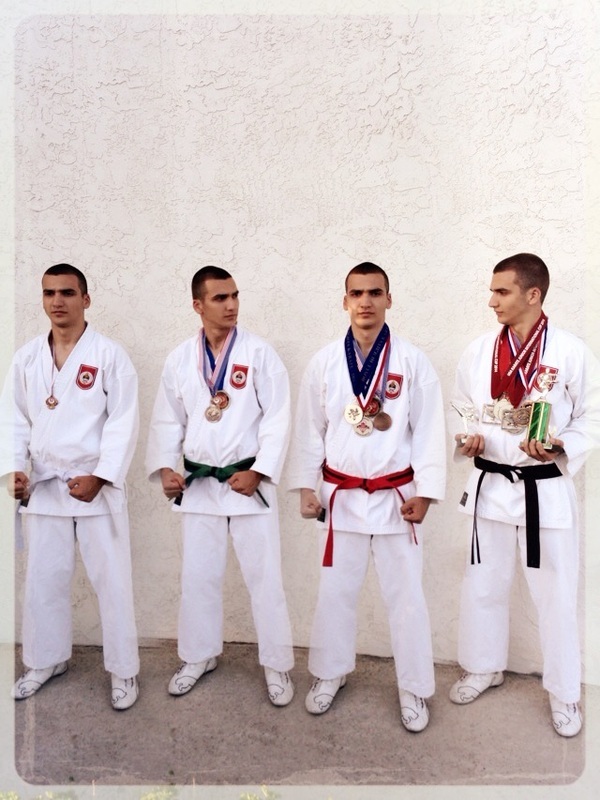 Aleksandar Stevanovic, Class of 2015, Improvement. The title of my peace is Improvement. I named it Improvement because picture shows improvement from white to black belt. The point of this picture is to show Improvement over time. It shows advancement from white to black belt. Also as belts increased the awards increased too. To make this photo I used app called Split Lens. In app I had option to take four photos, that later merge together. I like this picture because it brings me memories from past. I believe this photograph is successful because it tells a story. Through this year I learned many photography techniques, and I’m looking forward to learning many more. Yoana Suarez Mercado, Class of 2016, Freezing Time. I choose to call this picture “ Freezing Time” because this picture is obviously still, but the edits I included make the picture appear more like its cold and snow is falling. That is why I really love this picture that I took during the Halloween photo’s project. I love the way that everybody in this picture is up in the air. It’s like the perfect timing as well has all of their expressions on their faces. When I see this picture. In this picture there is four people. Iray, Alec, Kimberly, and Erick the four of them are jumping up in the air. The type of edits I made where basically adding filters and cleaning the spotted areas on Photoshop and IPhoto. I like this picture because it is so simple yet looks full with happy emotions. They are all looking like they are having fun, and none of them appear to not enjoy the moment. Which makes me think that this picture was successful. I also love the way the filter I added is making the picture appear cold and cloudy. I have learned this year that if you put enough effort and dedication to your picture they will look awesome and Mrs. Moncure will also not forget to make sure you know it. Tony Tapia, Class of 2015, Musician. The title of my artwork is Musician. The reason why I called it musician is because I’m a guy who plays music everyday. I took this photo at my church and I edited with the photo camera roll. 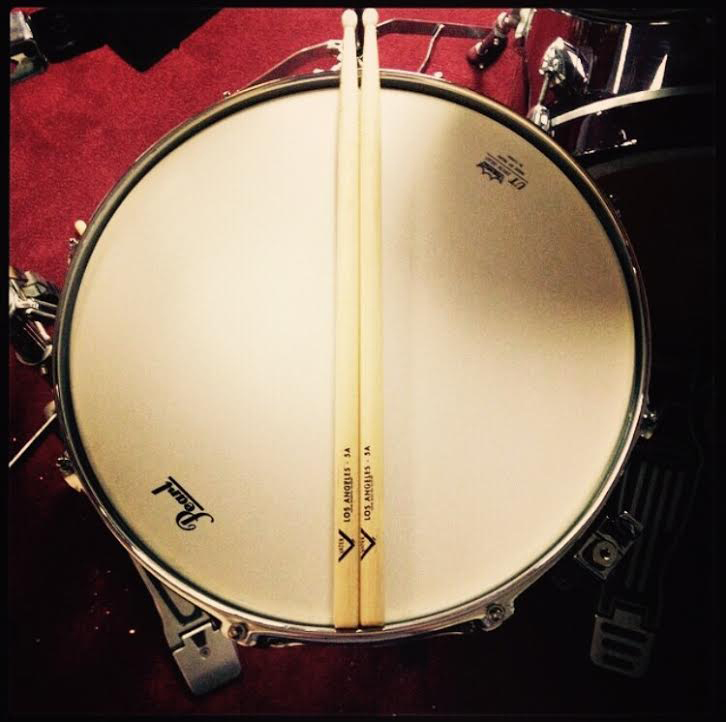 The reason why I like this photo is because I like how the snare is all nice and new; and it’s one of my favorite photo of all time. I learned a few things on focusing the camera and not letting it move. Ashley Taylor, Class of 2016, The Simple Life. I titled this piece “the simple life” because the flower is simple and living its life alone. My picture is a flower all alone in a field of bush’s, I used iphoto to transform this picture into what it is now. I like this photo because it is very bright and high in contrast. 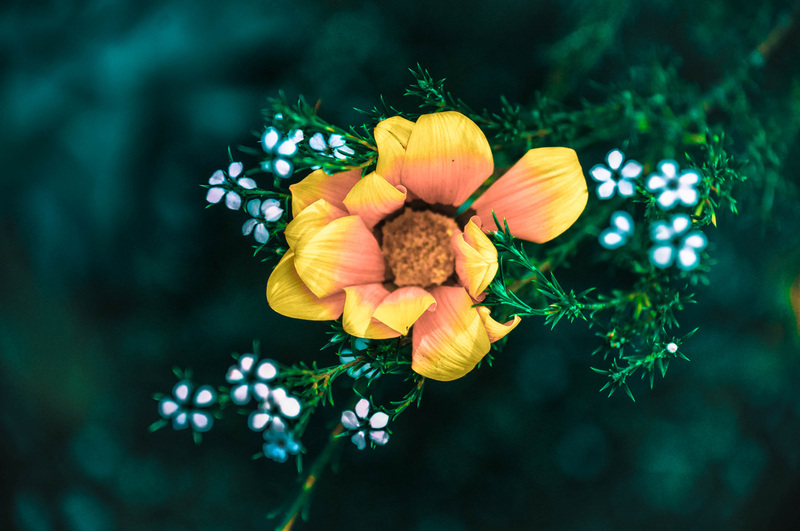 This photo is very successful in the aspect that it is focused on the flower and only the flower. I would say I'm an artist who likes to take outside of the box photographs. I have learned that there is a variation in types of photos and I'm looking forward to learning about how to transform a picture into something completely different. Luis Tejeda, Class of 2015, The Turned Tree. 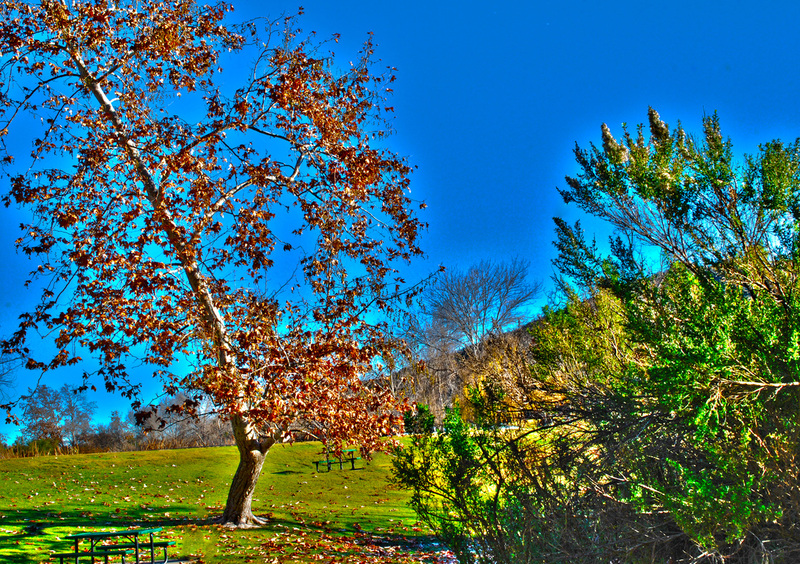 I titled it this because the tree looks live with color and turned off of life. This is a picture of a tree by the wrestling room and I liked the picture because it shows the colors and how bright they are. I edited this picture in Photoshop and I cropped the picture to 2x2. After that I put the picture in 4x4 squares and just rotated them and stuff in order to make it look like they are together. After I did that I modified the brightness and I made the colors brighter so it would stand out. As an artist I think I have grown a lot because now I am able to use Adobe Photoshop and I know how to take pictures better. I live in a place, where the old is still the new and teens shop at the endless thrift stores; go to the single record store in town. My photograph fits the theme “Sense Of Place” because the culture of the past is still infused with today’s culture. In the past, there was only the Avo and Peppertree (a ice cream shop) that the kids would go to watch movies and eat ice cream. Now, there is the movie theater “Kikkorian” and Cold Stone Creamery” along with many other add in’s like restaurants and art stores. Yet, teens today and adults still go to the Avo to enjoy musicals/ plays and the old Peppertree for delicious ice cream. Downtown Vista is my favorite place in Vista so I knew I wanted to take my picture’s here. Especially at night in December because everywhere you see there is lights, music, and people having conversations outside restaurants. 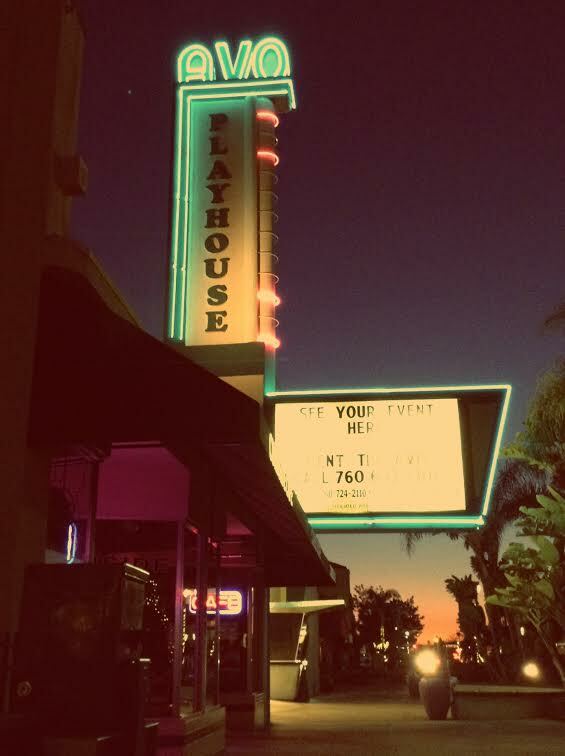 The Avo is very historic to San Diego because of how old it is and it was once the only place to watch movies. The lighting was something that I loved because I think it’s what tie’s the picture together. The sunset is set beautifully in the background and the purple hues of the restaurant go amazingly with the teal lights of the Avo. If it were black and white it could have been an image of the iconic 50’s! Once the sun sets and the stars rise, the freaks come out to play. Jazmin Trinidad, Class of 2016, Flamingo. The name of my piece is flamingo. I picked this name because when I see this picture I think of a flamingo of the hot pick orange color. The color and the texture give you the sense of touching a flamingo. This picture is a flower with a few other flowers growing around it. This is a part of the mandalas project we did. Some of the steps I did was to make an eight by eight inch template, get the picture, and after I made a copy of that same picture. I went to edit and transform and flip horizontal, and so on to fill the four squares. I really loved this picture because the colors are really bright and I feel that it makes me happy to see bright color- it has this effect that makes me really happy. I think this was a successful photograph because when you see this picture you have emphasis on that bright pink flower and it’s also harmony because you have a calming nice background. So far this year I have learned a lot about photography that I had never heard of. I learned that behind every picture there is a greater meaning and story from it. 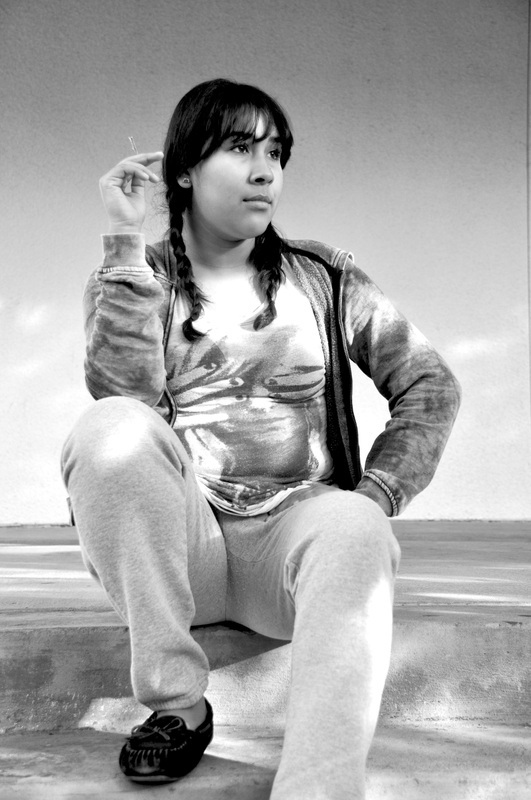 Sarai Vasquez, Class of 2015, Lady in Black and White. I named this photograph Lady in Black and White because it's a portrait of Karen Luna and the filter I used was black and white so I decide to combine two obvious things and make it into a title for this photograph. This photograph is a recreation of a portrait based on my photographer that I chose for the Research Project. I had to make this photograph seem old so I used Photoshop to change the color of the photograph to black and white.I really like this photograph because after two retakes I got an awesome portrait of Karen. I really like it because it wasn’t really hard for the model to pose just like the model in the real portrait that Yousuf Kash photographed. Having Karen to model for this self portrait worked out because this photograph is up on Mrs. Moncure website which it really means a lot because it shows that I did a great job. This year in photography I improve on learning how to use Photoshop and I have improved on taking better photographs. Vielca Vazquez, Class of 2016, Paraíso Obscuro. Paradise is an illusion. 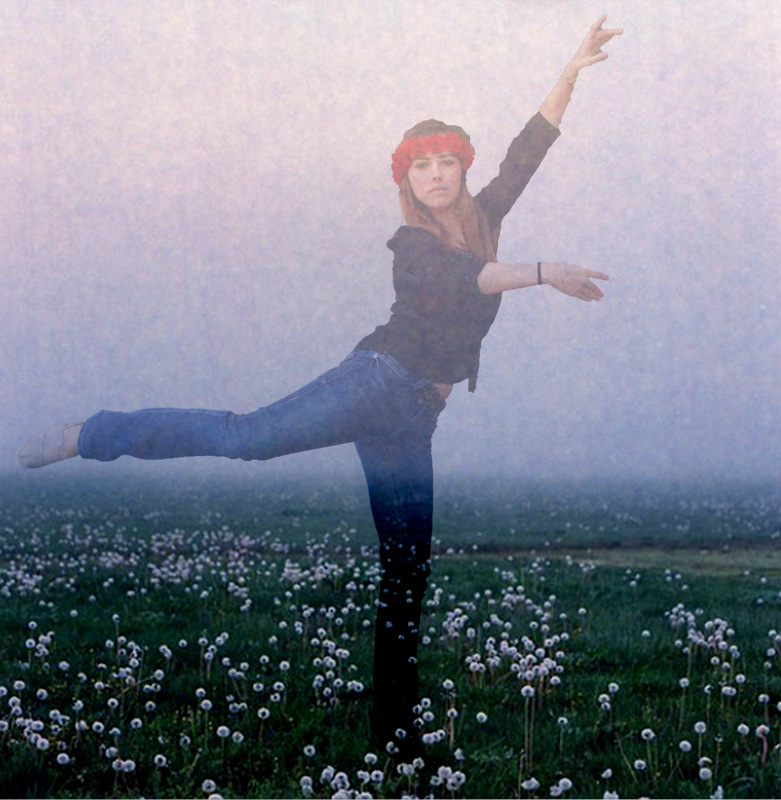 In this photograph Isabel, my model is standing in a dark flower field. The fog makes this place seem very magical and almost perfect, just as paradise would look. Even though paradise is beautiful it’s not always real. This is where the “obscuro” comes in. There really isn’t such thing as paradise. I created this picture on Photoshop. I first took the picture of Isabel posing and erased the background. Next, I found a picture of a flower field on Google. I added the picture into a second layer. Then I fixed the opacity. The opacity created the illusion of her fading into the fog. I love this photograph because it shows every emotion. This photo was successful because it shows the truth behind paradise. Perfect doesn’t always bring happiness and you can see it in this photo. I love dark photography and this picture represents that very well. Ariana Vega, Class of 2015, Julie. This piece did not have a title until now. It’s called Julie. I call it Julie because it is a picture of my cool friend, Julie. Not only is Julie cool, she is also very beautiful as you can see from this picture. This picture was taken before I was going to take a staged picture of her. She was fixing her hair when I took this picture. I think this one came out better than the staged one. I gave this picture a black and white filter and contrasted it a little more to make the black in the photo, such as Julie’s hair, pop. 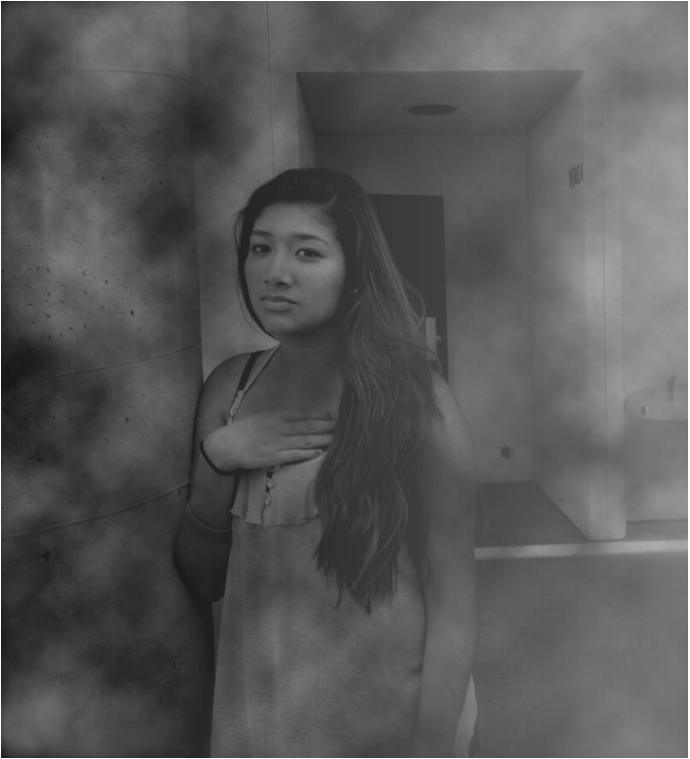 I used black and white because I was doing a project on the famous fashion photographer Richard Avedon. Avedon is known for his black and white pictures of exquisite human beings, whether it be in a studio or a candid taken in the middle of the night. That is what I did with Julie, I took an off guard photo of Julie and made it black and white to mock Richard Avedon’s aesthetic. I like this picture because of it’s simplicity. It is simple yet so alluring and I am very satisfied with it. Julie is also a dear friend of mine whom I admire, that’s another reason why I like it. This picture captures the simple act of beauty, taking it’s course. As an artist, I am simplistic. I like beautiful things. People, inanimate objects, sceneries, you name it. I try to capture pictures the way that I see them without a camera. By doing that, I hope to share the same amount of amazement that I feel with other people. I’ve learned many things this year other than how to use a camera. I have learned how much I like taking picture and how to make them better then create the effect that I want, and even better. I am looking forward to the pictures I will take. Brandy Velasco, Class of 2015, Undeserved Grace. I titled my picture “Undeserved Grace” because the Lord’s grace is so undeserved, we don’t deserve it but we received it anyways. For all the sin and wrong I do, He still forgive no matter what and will always be forgiving. This is a picture if me reading my bible and a verse I really enjoyed, coming out the bible. 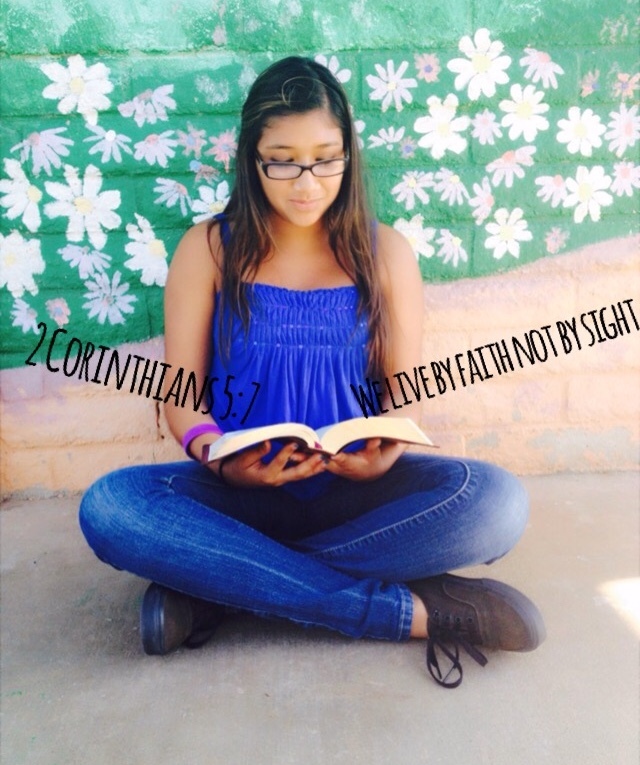 The verse is 2 Corinthians 5:7 – We live by faith and not by sight. With this picture I was aiming to show how much faith means to me. It’s always been a big deal in my family since I was about 7 years old, but just recently I have approached the age where it’s my time to make it my own and my parents are no longer going to push me to stay in the word and continue to attend church. It is up to me and no one else whether or not I will continue my walk with God. To create my little masterpiece, I used the apps ‘Photo Wonder’ and ‘Font candy’. With font candy I was able to add text to my picture and had a variety of fonts to choose from. Photo wonder is an amazing app that I really enjoyed using. In this app I used the ‘beautify’ tool to make my skin lighter so I wouldn’t be so dark. I also made the picture brighter and made the contrast higher to make a sort of dreamy/glow effect. This is one of my most cherished photos. I think its successful and well liked because my message is clear and creatively shown. I would describe my self as a very true artist. I am very true and honest with my work and work from my heart. I have learned so much so far, from lighting to shutter speed. I can’t wait to see what else will come and how I can improve my photography. Biz Whitney, Class of 2015, Hard Times. 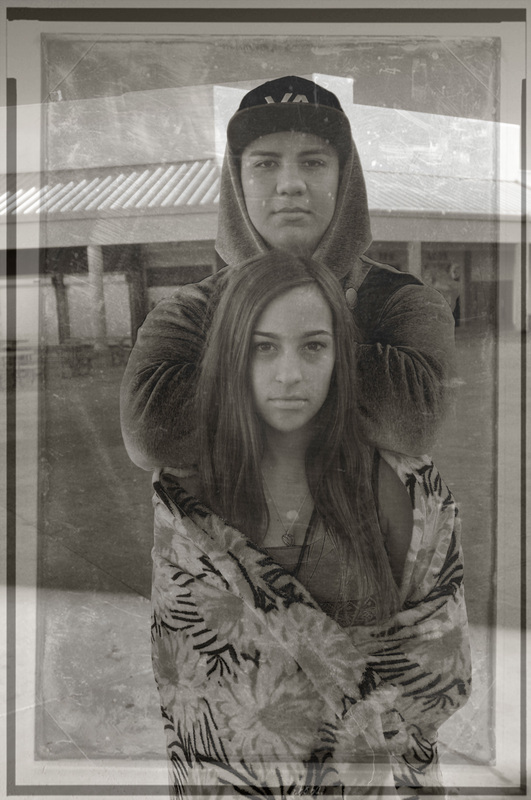 This is a picture of my classmates Tyra and Francisco that I took to recreate a tintype photograph. I titled the picture Hard Times because tintype photograph was popular in 1800’s when life was difficult for many people. People usually had serious or sad facial expressions in tintype photograph because their hard life style and because of the long exposure time. Tyra and Francisco have the same facial expressions that are common in tintype pictures making this picture really unique. I used Photoshop to create the texture and tint of tintype pictures. 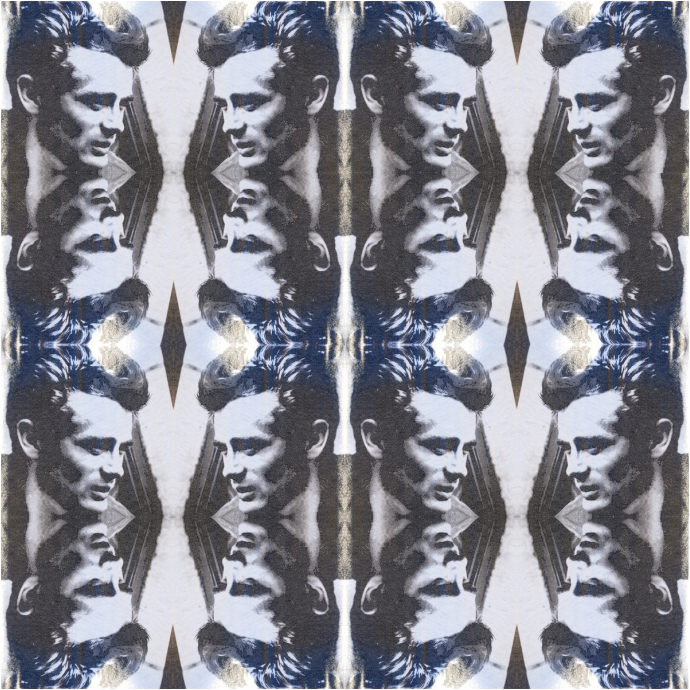 I found a picture of starched iron on Google and I used Photoshop to merge the picture with the iron to make the picture have the starched and antique texture. For the color, I played around with the different tins of color on Photoshop until I had the color which best represented tintype. I learned a lot about photograph and how to take great pictures this year in my photo imaging class. My favorite thing I learned this year is light room and using shutter speed to control the speed of moving objects. I would describe myself as a novice photographer because there is a lot more for me to learn about photographer and I am looking forward to learning more and becoming a better photographer. Martha Zambrano, Class of 2015, Yin Yang. 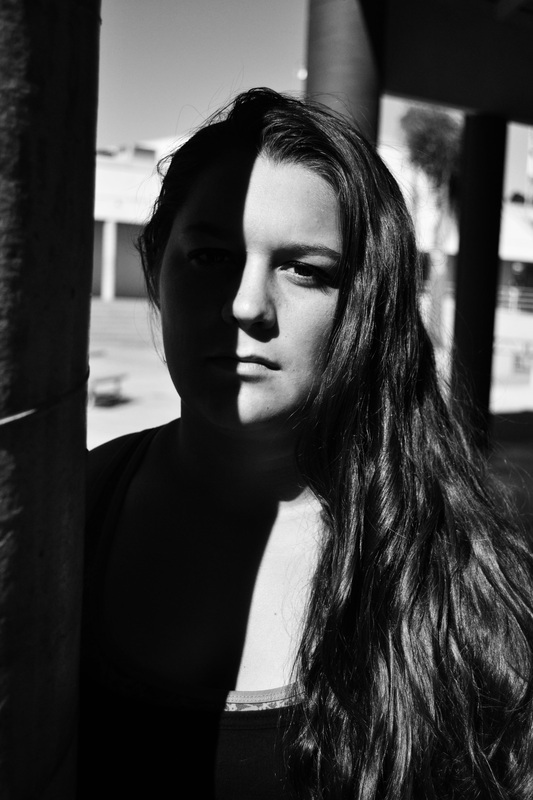 I picked this photo and named it “Yin Yang” by having a black and white look, especially since it adds up the shadow from the reflection of the sun towards Sierra’s face. Also, this picture has the meaning of a person can be either good or bad from what we see in them, since nobody is perfect. This picture is my friend leaning a tall pole made of cement, having to take this photo on daytime, while the sun reflects her shadow, and half of her face reflects a better figure image from how she looks in person. What I did by taking this photo is having my camera on auto, f 16 and had small amount of brightness involve for the shadow can look better and darker once I edit it. I really like this picture because the type of texture I added to this makes it become a unique shot. Also I love how the way it looks and everything came out looking realistic. I believe this is a successful photograph because not every pictures that I have done have been my best, yet this one is the best so far, and I can sense the good textures in the picture. Describing myself as an artist is mostly from loving to take photos and enjoy learning photography based on my personal skills and knowledge been taught to become a better artist, which takes practice, I can feel the practice has made me better. This year, what I learned the most is what the differences from a photo-shoot is and how they will turn out to come out, as well with knowing the names of shuterspeeds, and buttons involving with the camera. What I am looking forward on learning to being close on finishing this year is how to take photos from a far distance but with a clearer view. Hope you enjoyed my small essay, involving with my best photo. 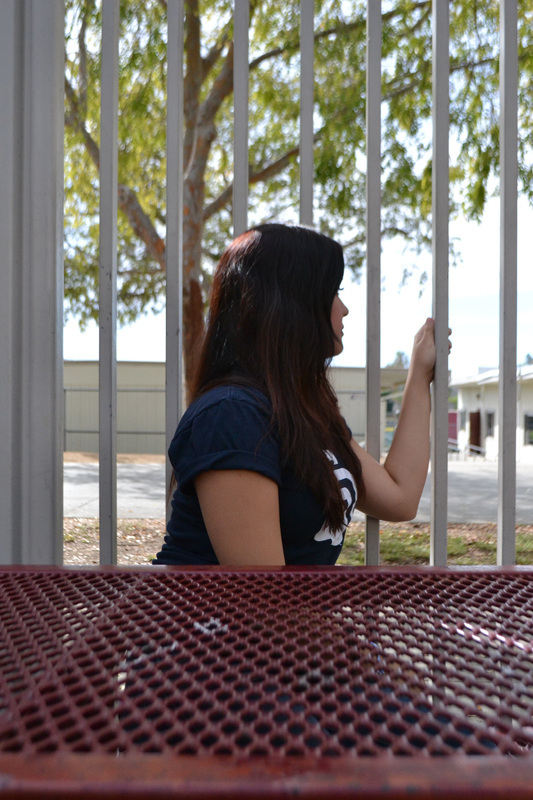 Ariana Zuniga, Class of 2015, Trapped. I titled this photograph “ Trapped” because I sometimes feel trapped and I never realized how much I want to be free. This is the problem that most people have, not just me. 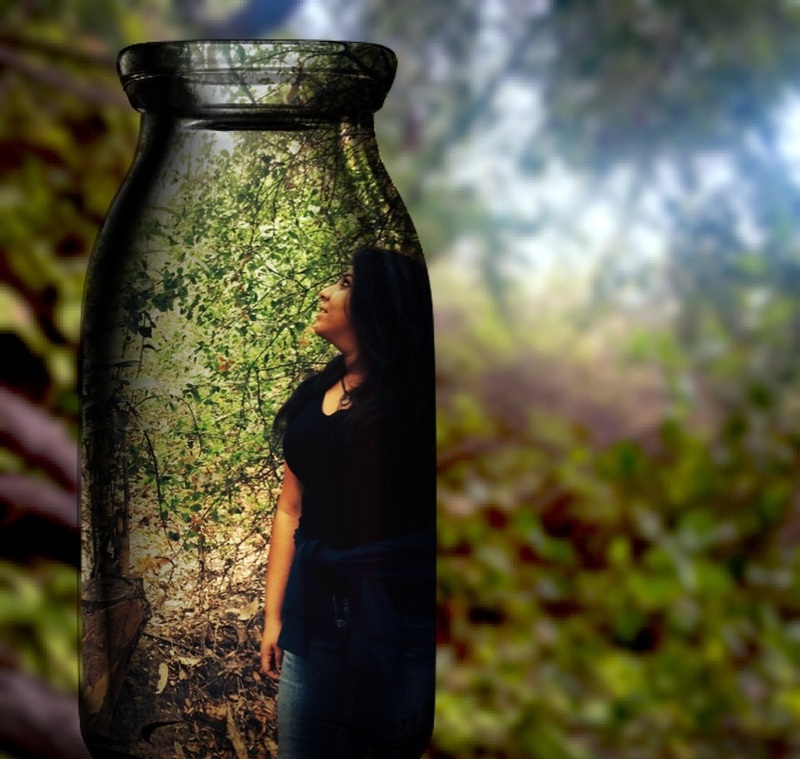 This is a photo of myself trapped inside a bottle, the bottle is outside in the forest and while I’m trapped I notice the beauty of nature but I’m not able to enjoy it. For this photo I only used an app on my phone, the name of the app was ‘ PIP camera’. I had many choices to use but when I saw the bottle I knew right away what my photo would be about. I like this photo because it describes how I feel most of the time. What I like most of this photo is the place where this photo was taken. It was our first time out in the duck pond and when we went to go take photos I was enjoying nature. I have never realized it's beauty and how free I was. It was honestly one of the best places I have ever been in. As an artist I learn something new everyday about life and myself especially when I’m out exploring the world. And I learned it's not bad to learn new things about myself because it will make me a better person in the future. I am looking forward to taking more pictures of nature, but the way I want to, without having a specific task to complete.